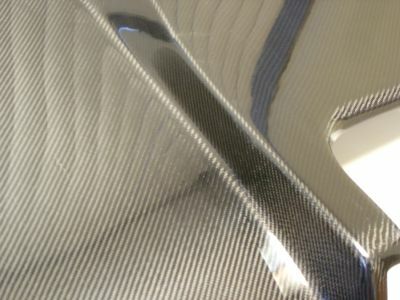 NEW Material Technology! 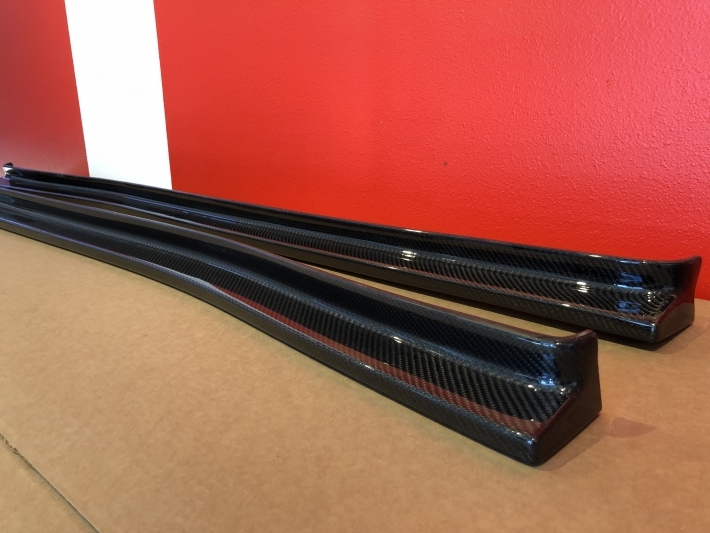 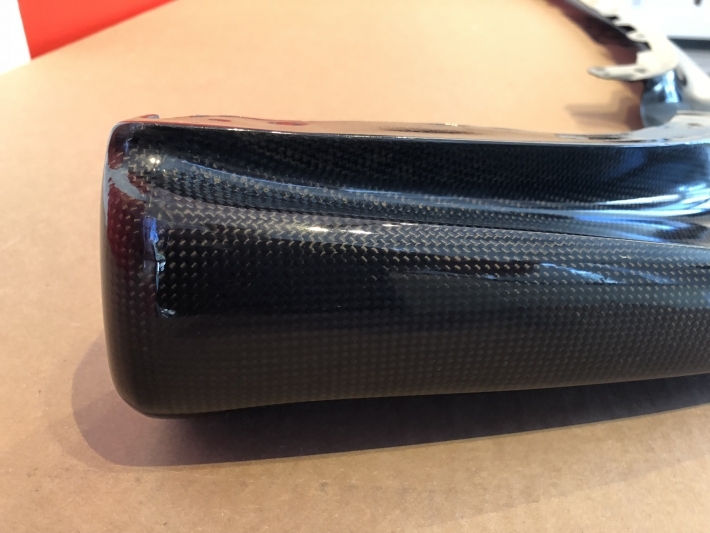 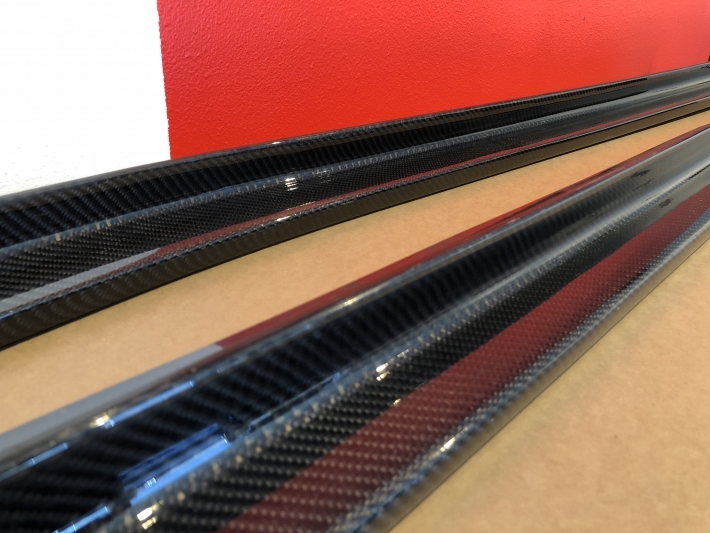 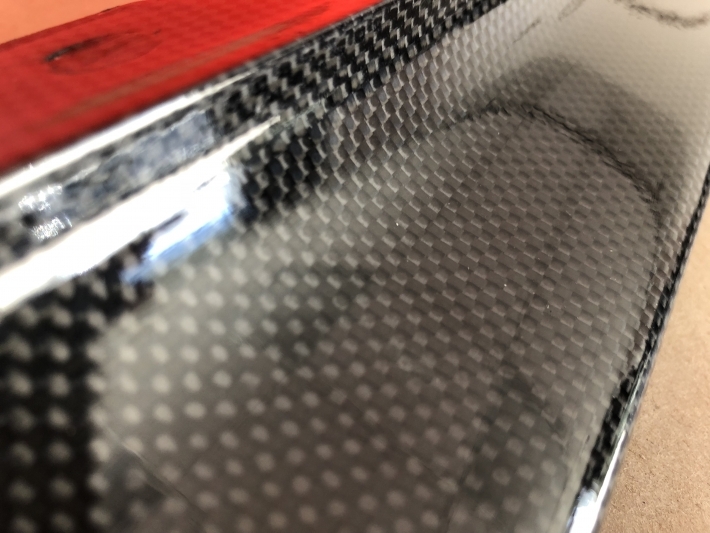 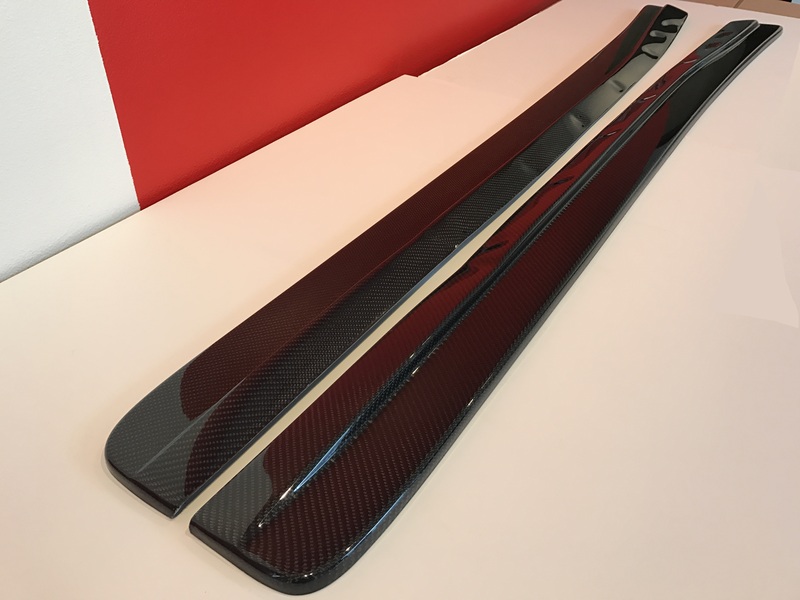 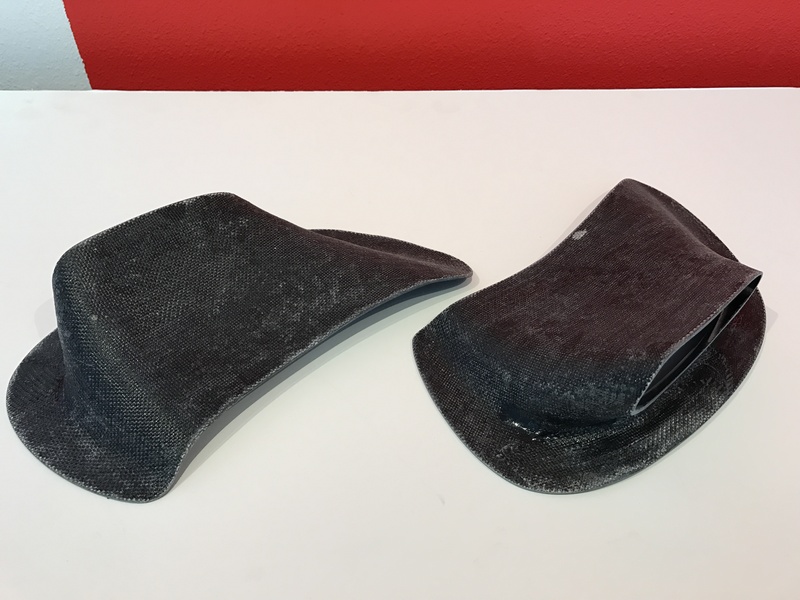 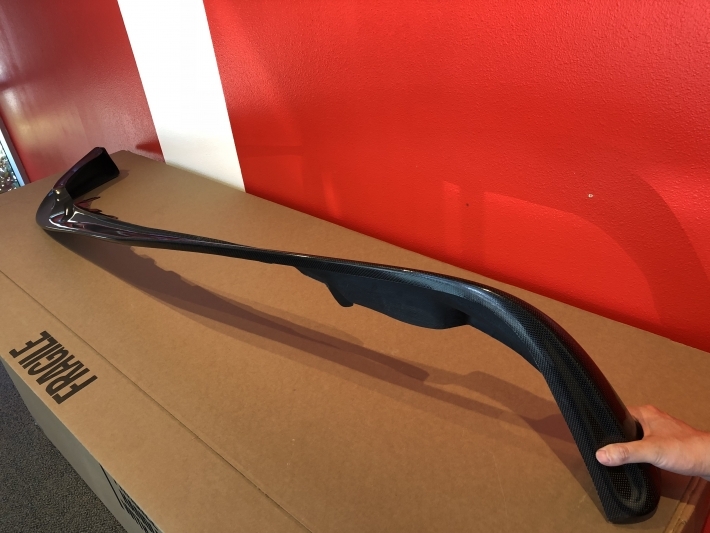 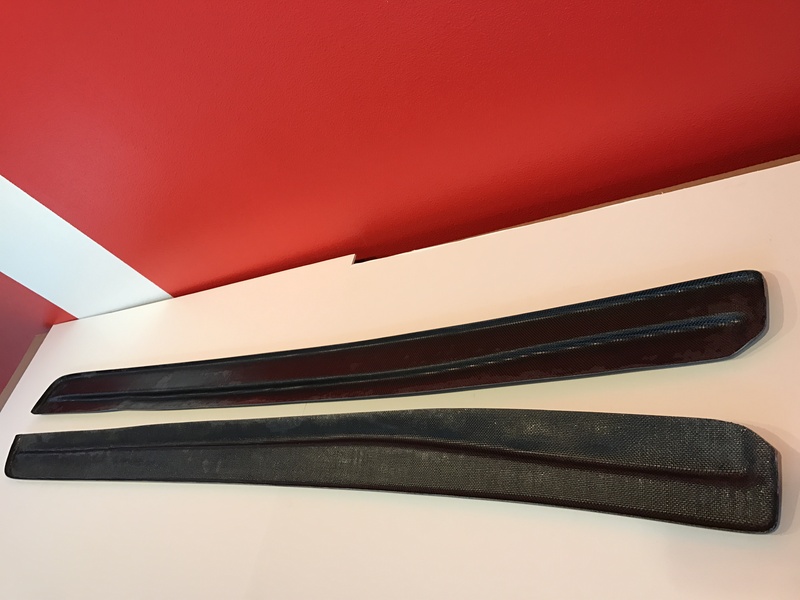 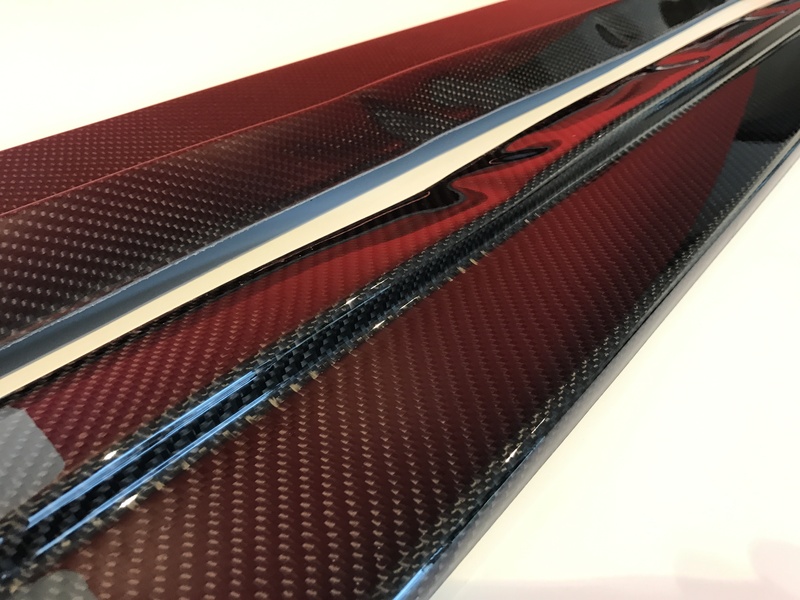 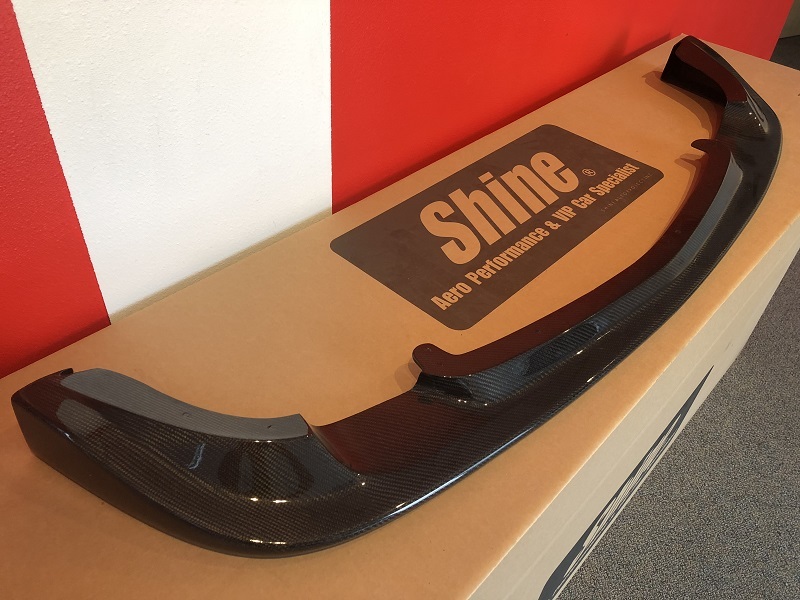 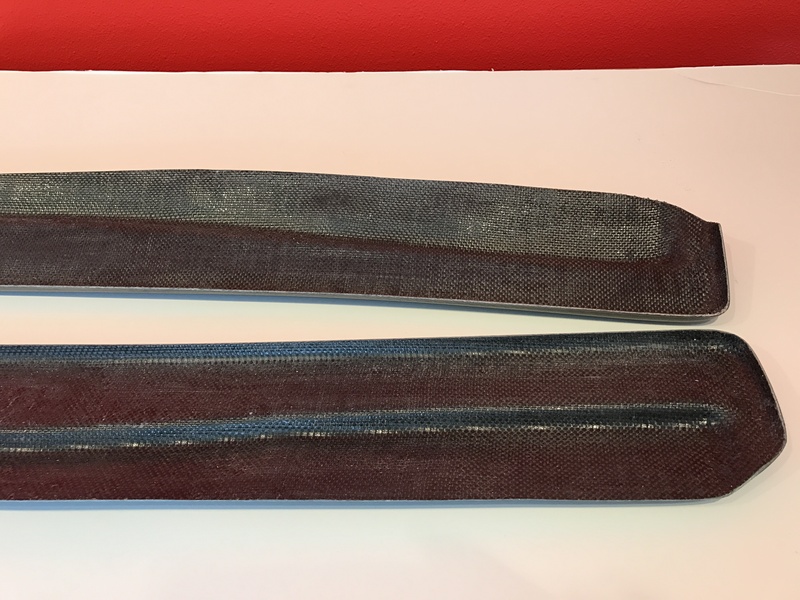 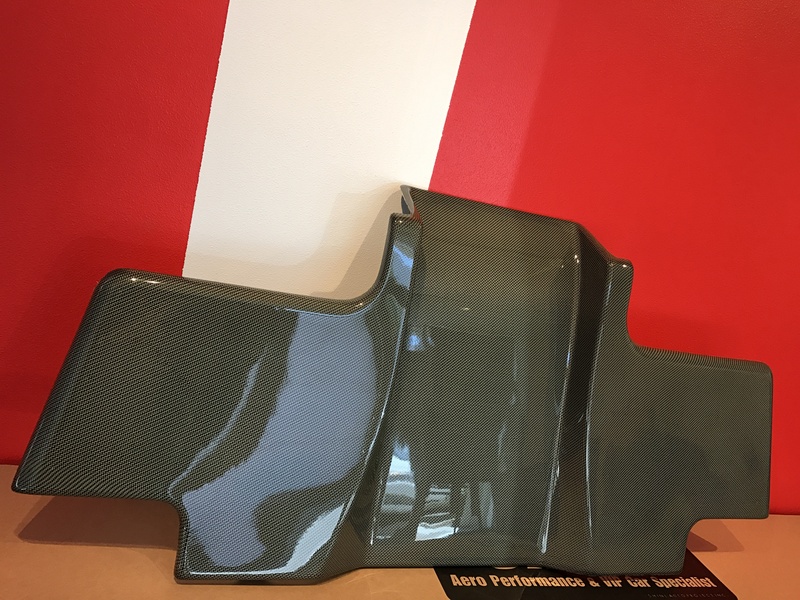 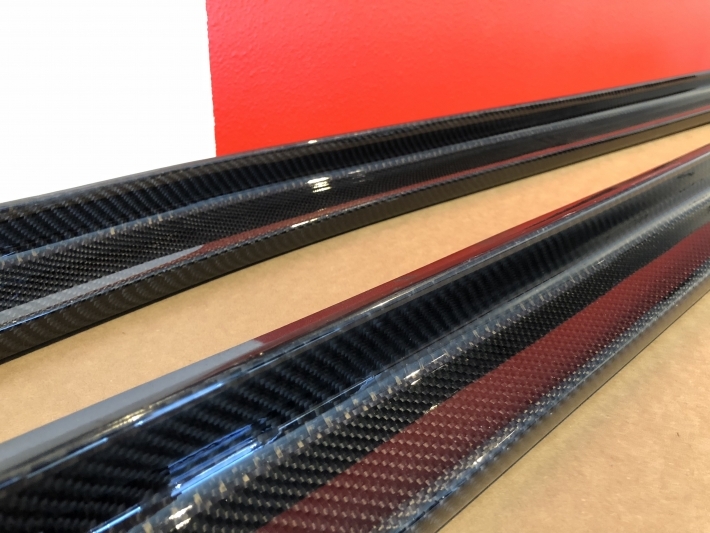 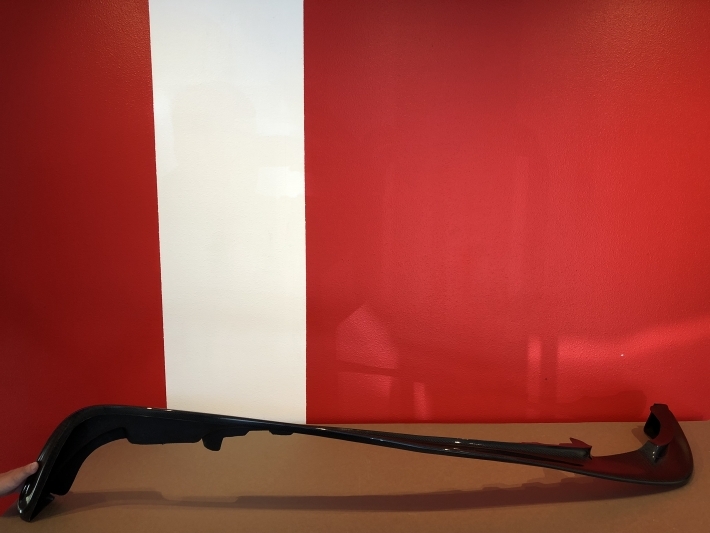 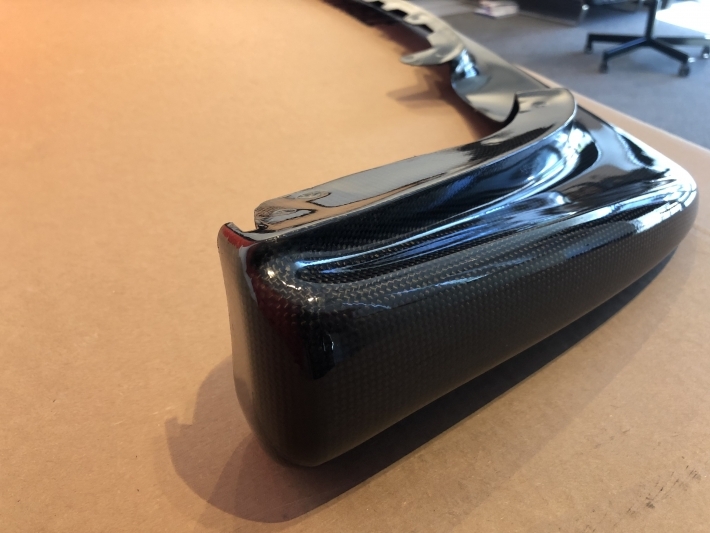 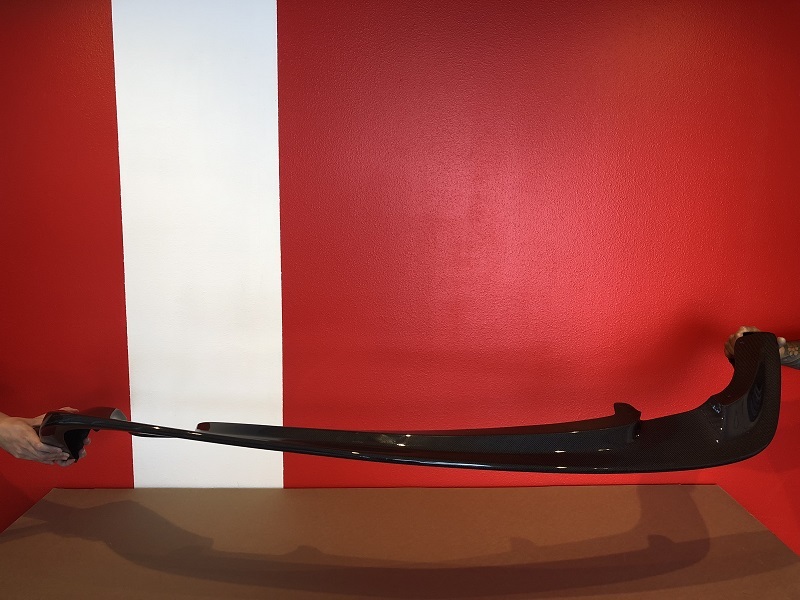 This is the very first product to be made using our newly-discovered Vacuum Infusion HybridCarbon™ process, which results in a flexible carbon fiber product. 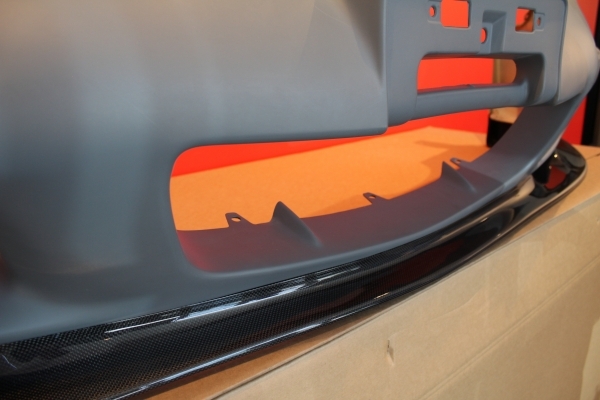 This is an extremely rare feature in the automotive after-market industry. 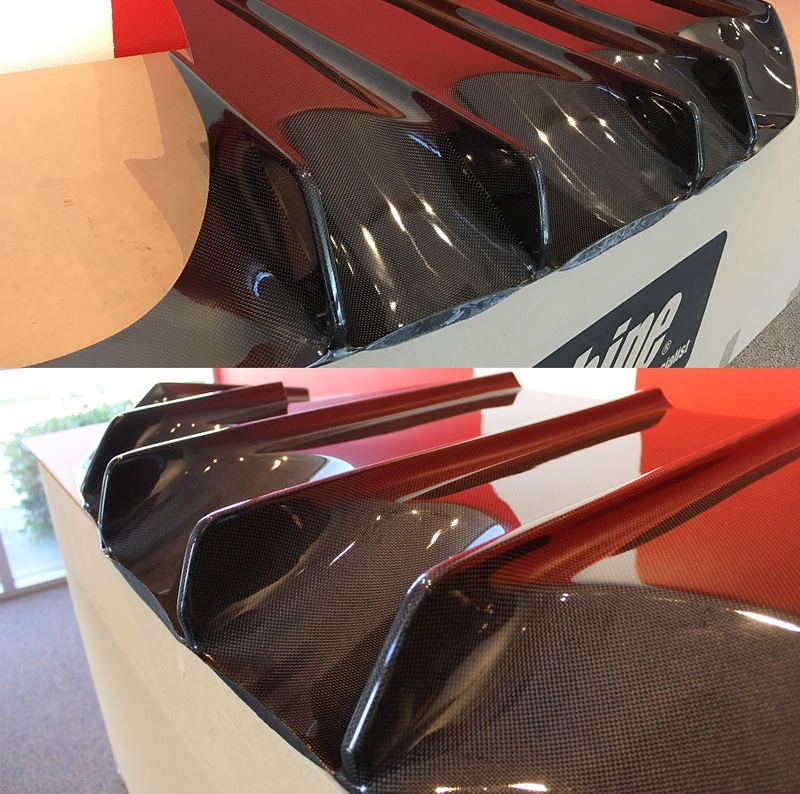 Added flexibility equates to added durability. 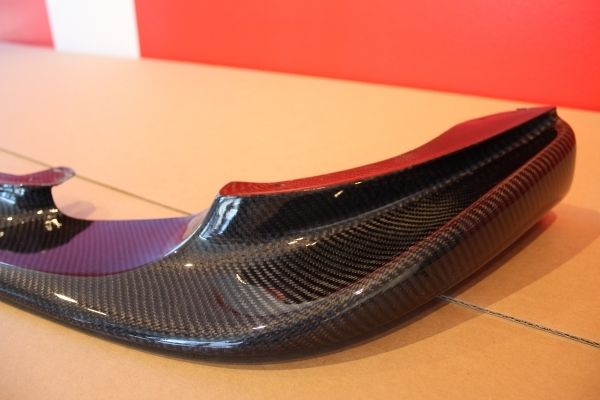 Of course we are not implying this part is indestructible. 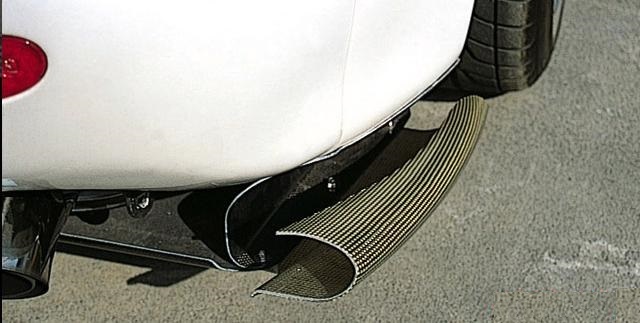 We are simply implying added flexibility/durability gives the product a better chance at surviving minor daily driving mishaps such as pot holes, speed bumps, etc… than if it did not have any flexibility at all. 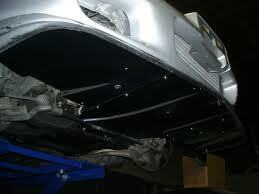 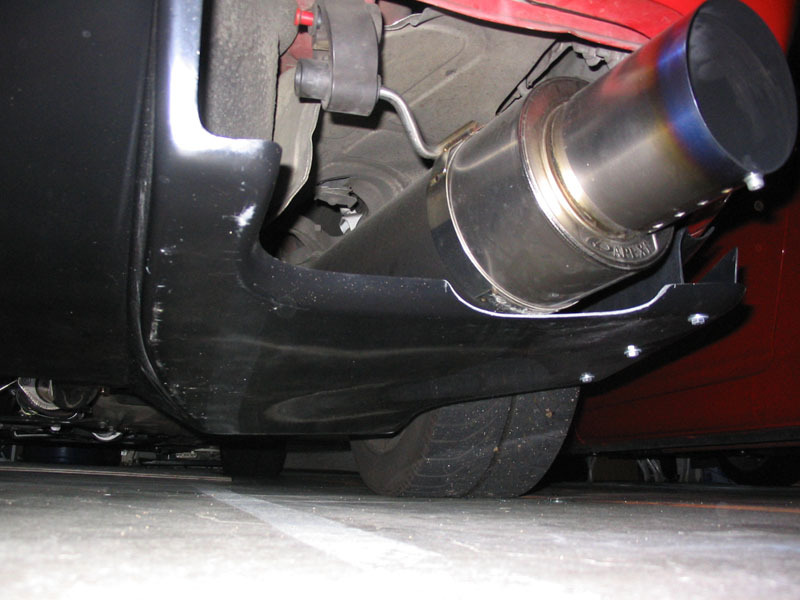 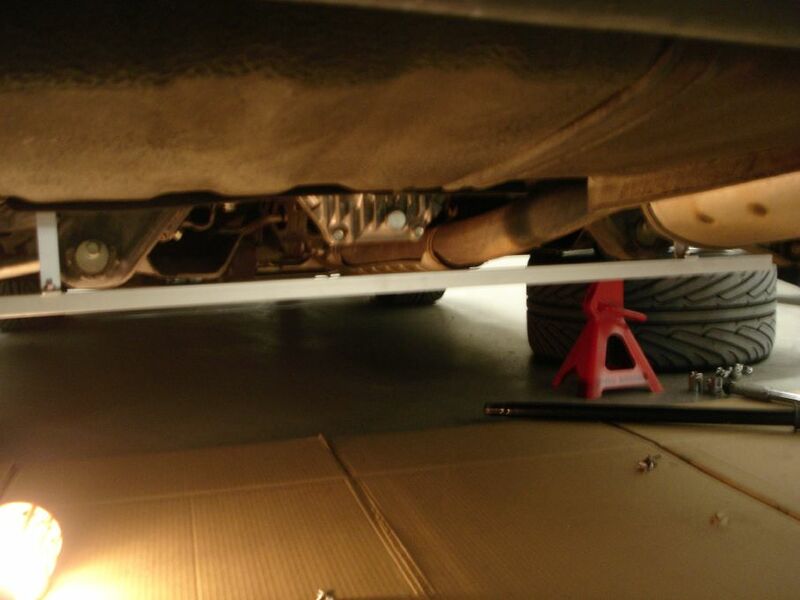 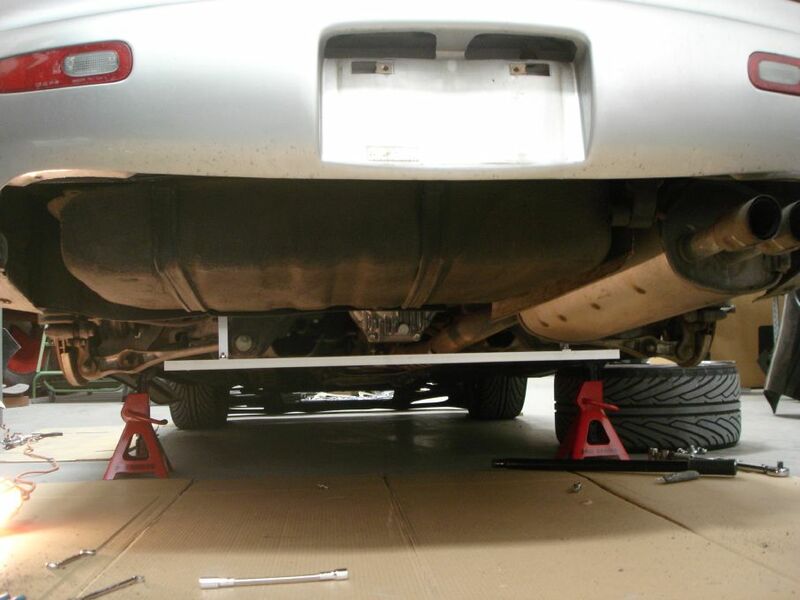 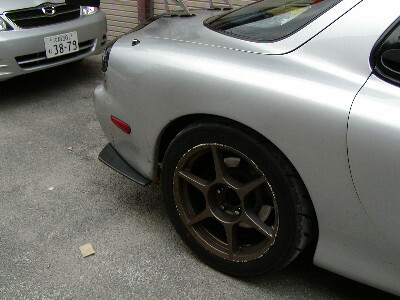 This is a one-piece design as opposed to the traditional 2-piece design of the JDM OEM 99-Spec lip. 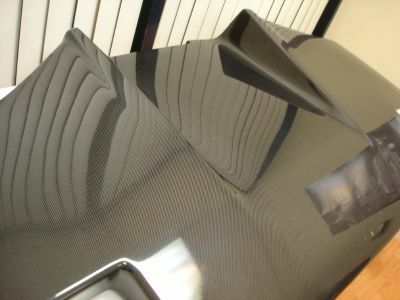 NEW Material Technology! 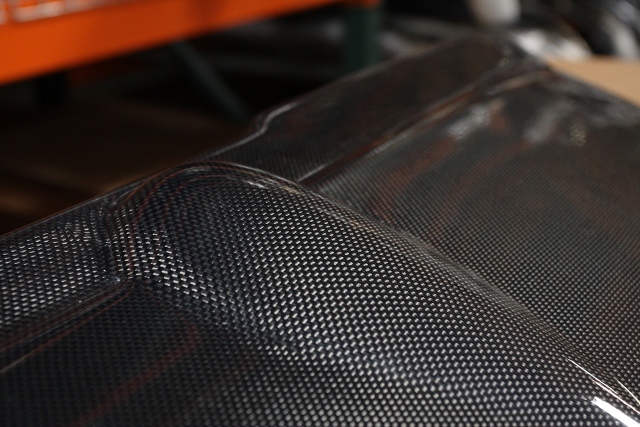 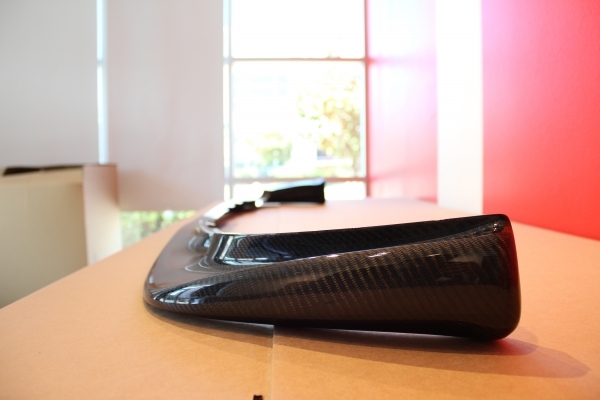 Made using our newly-discovered Vacuum Infusion HybridCarbon™ process, which results in a flexible carbon fiber product. 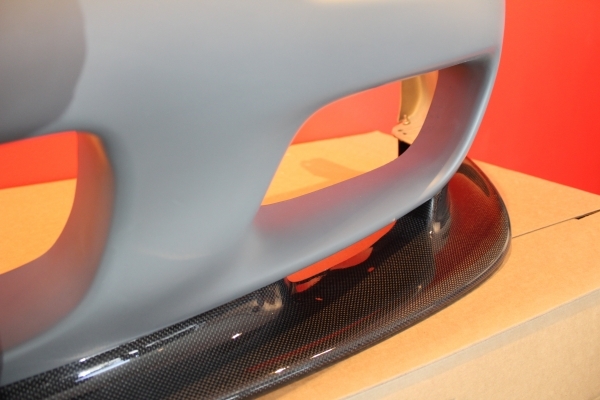 This is an extremely rare feature in the automotive after-market industry. 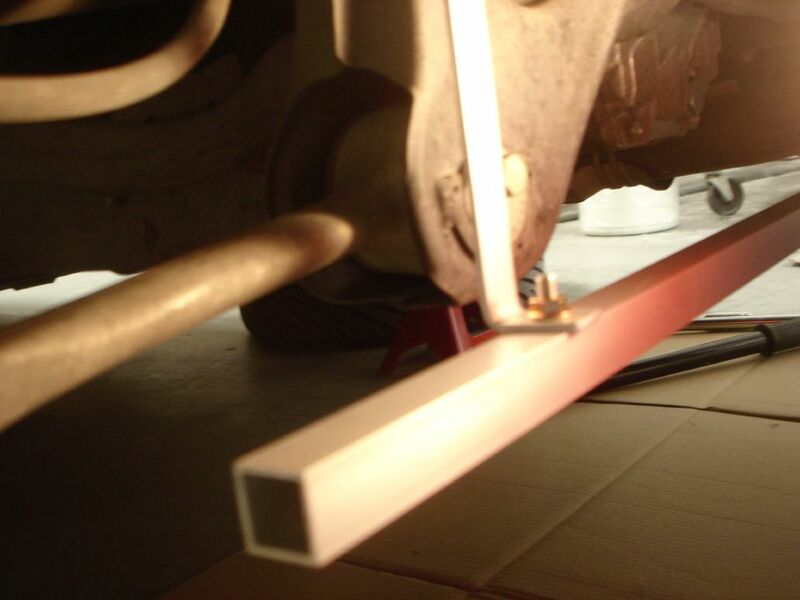 Added flexibility equates to added durability. 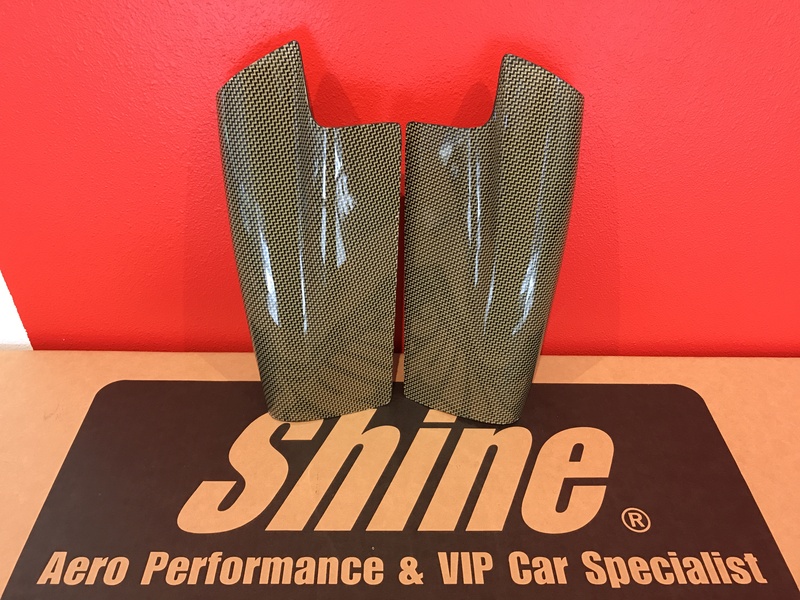 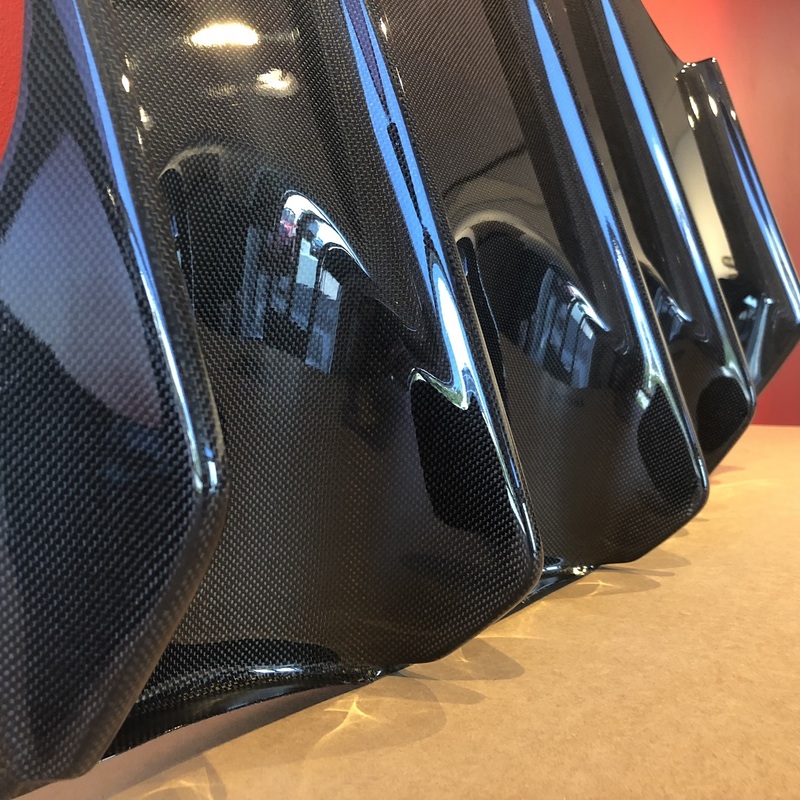 FRP, Carbon, and Carbon-Kevlar versions are reinforced with an extra layer of carbon fiber for superior strength along with a cleaner looking backside finish. 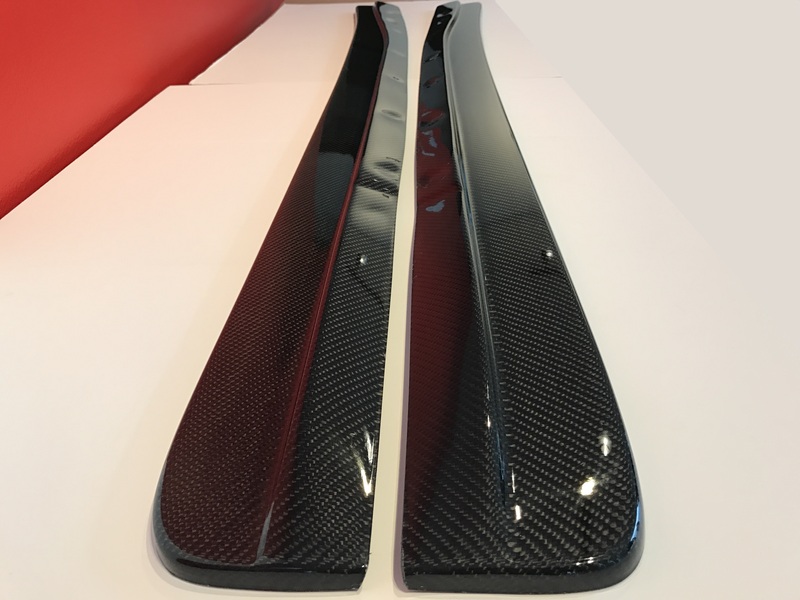 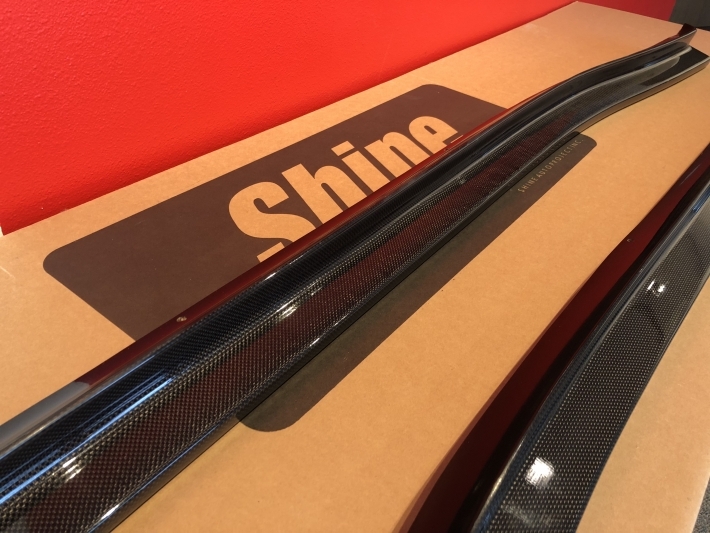 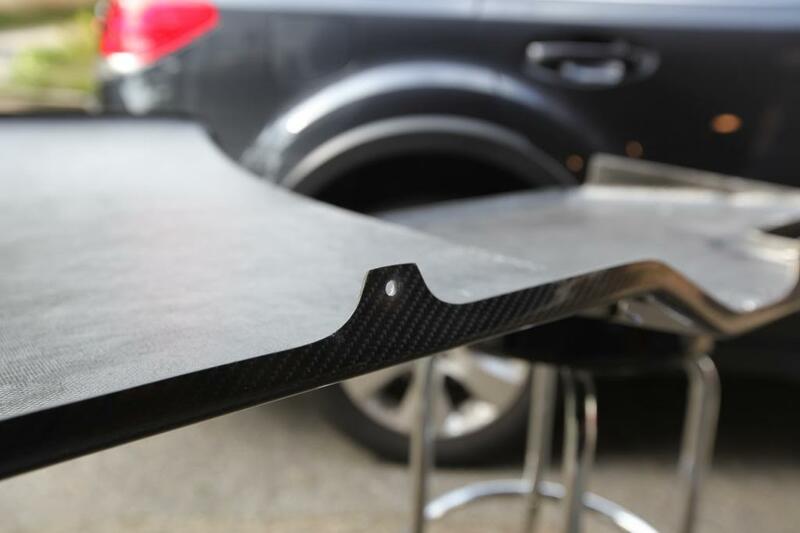 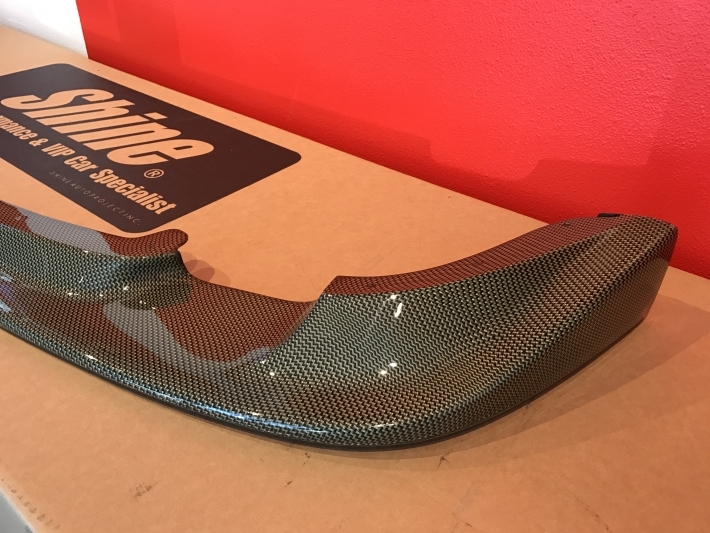 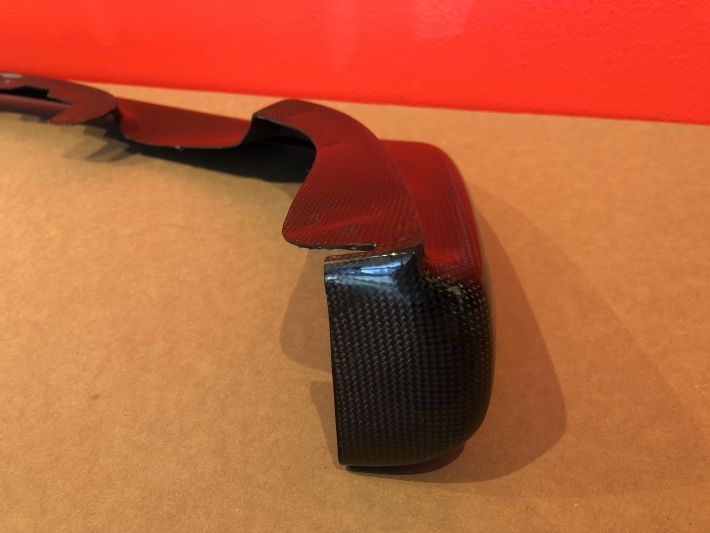 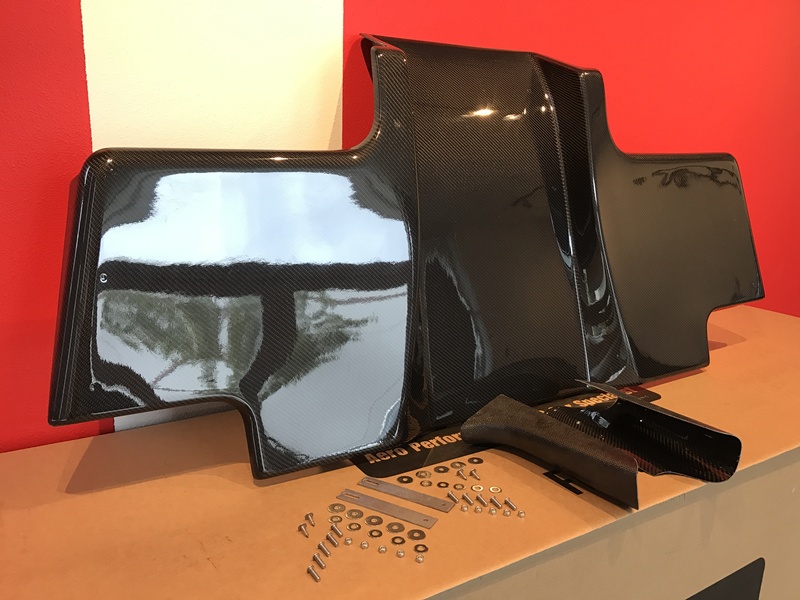 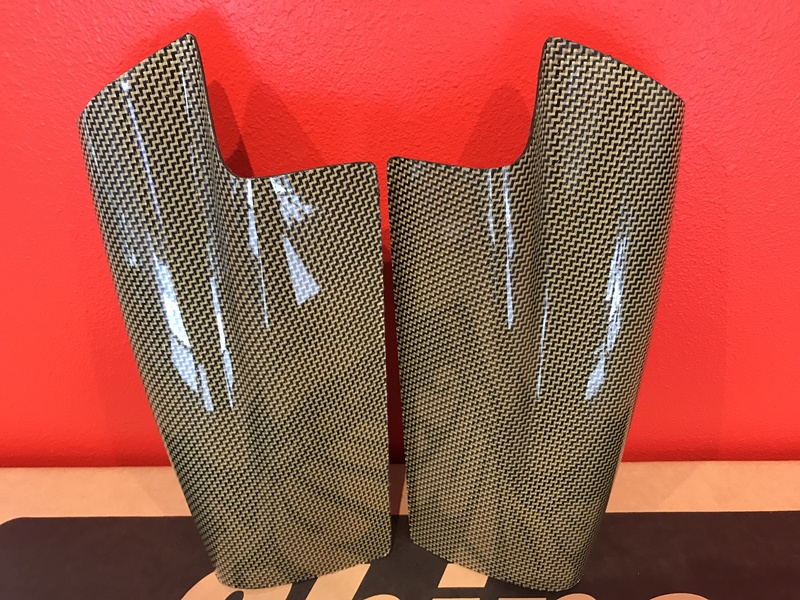 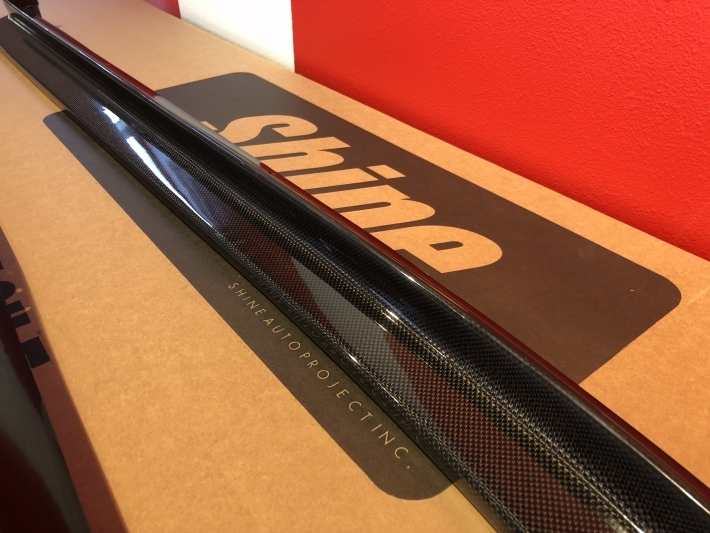 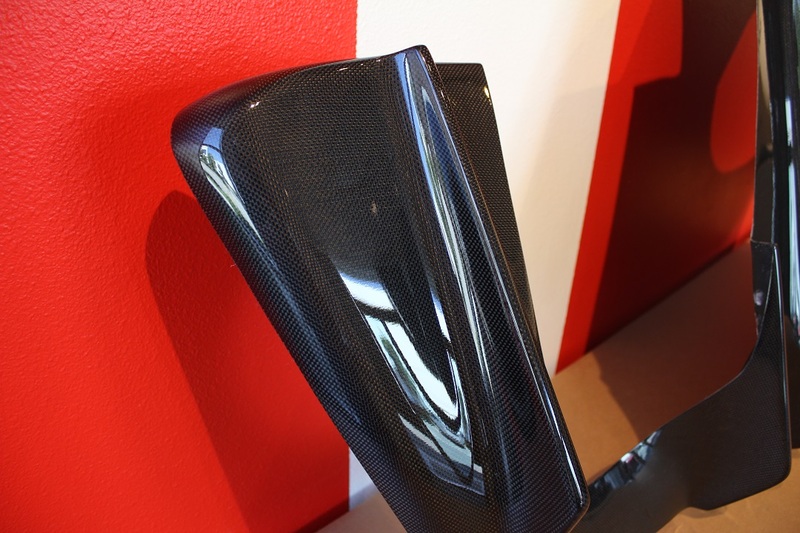 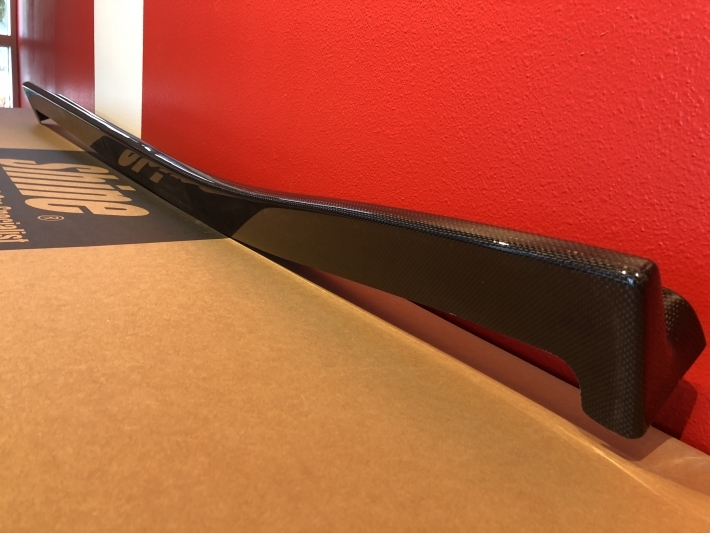 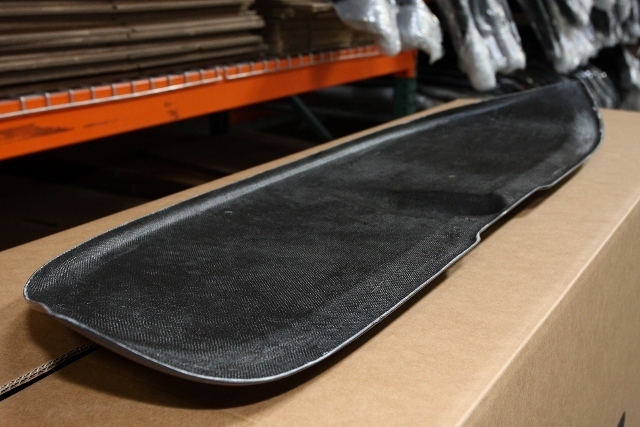 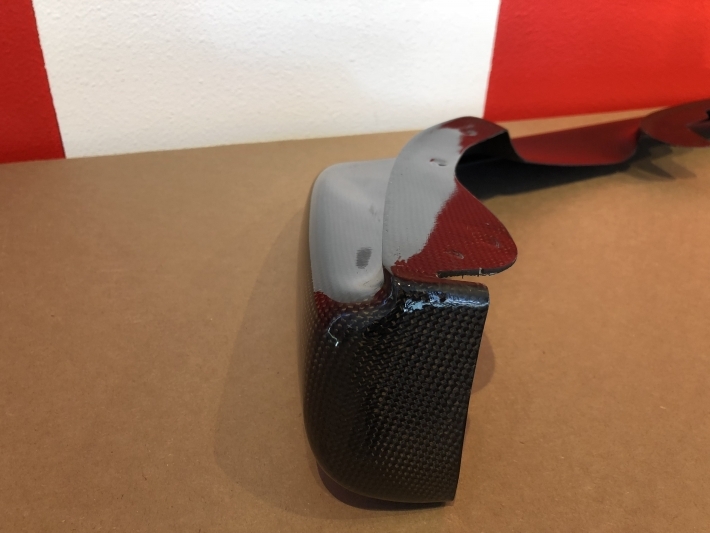 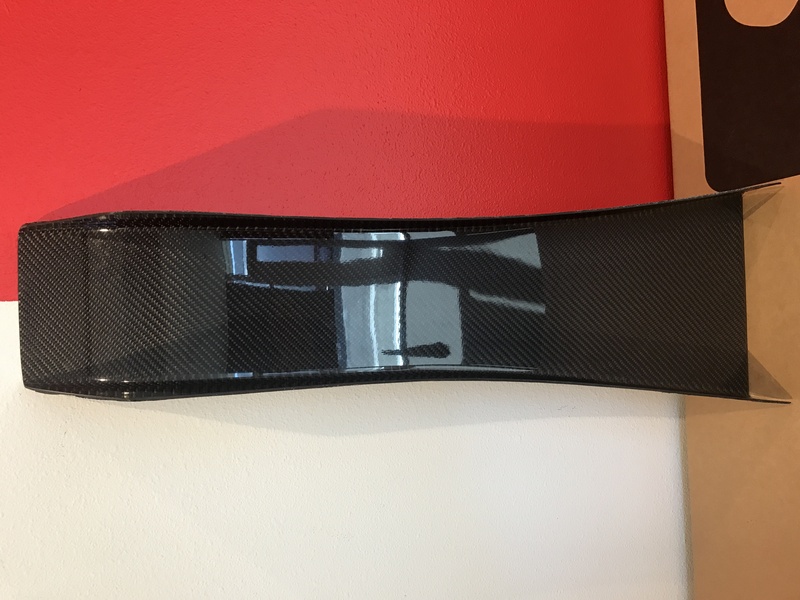 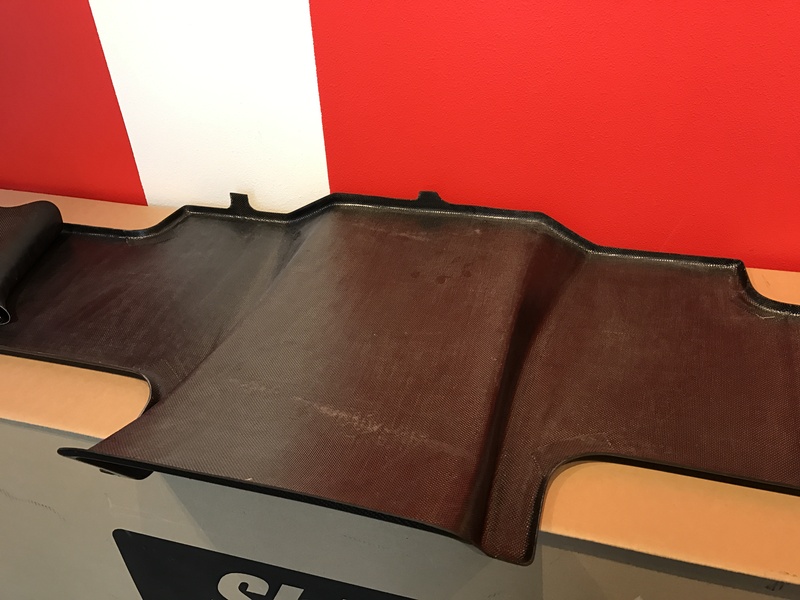 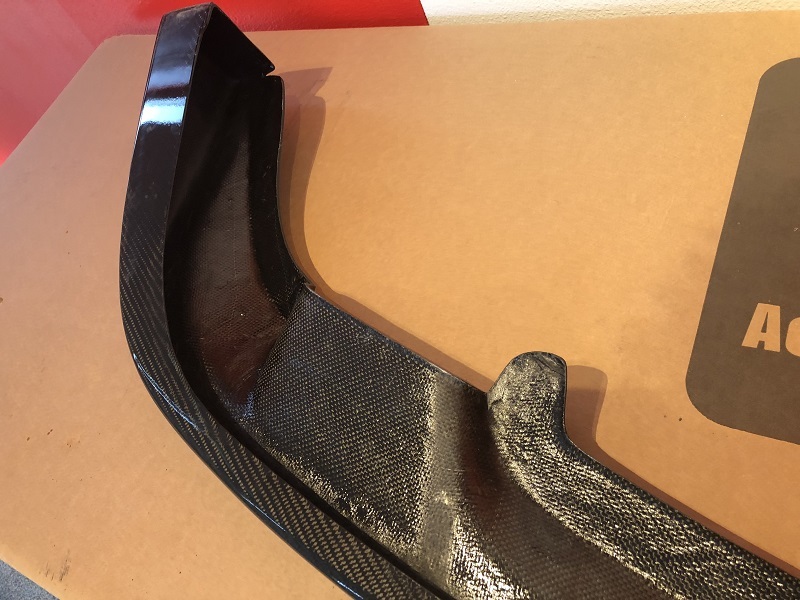 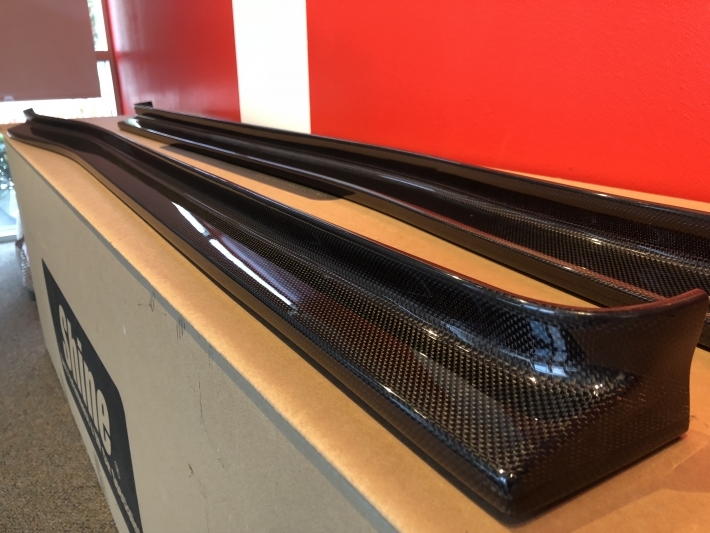 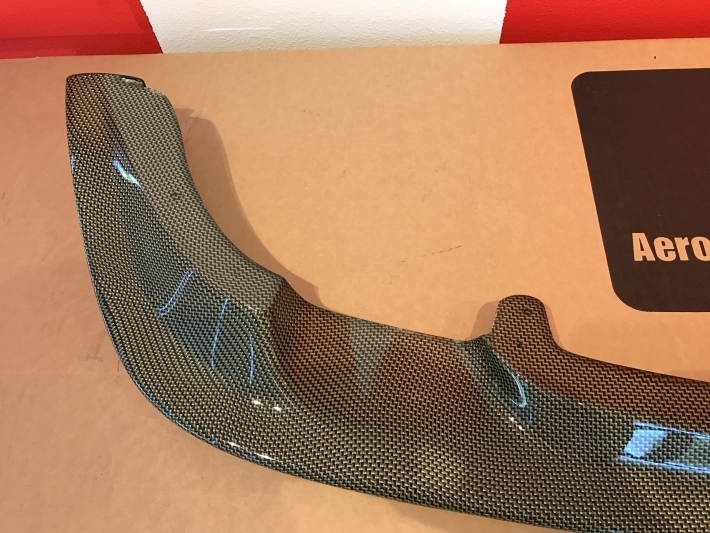 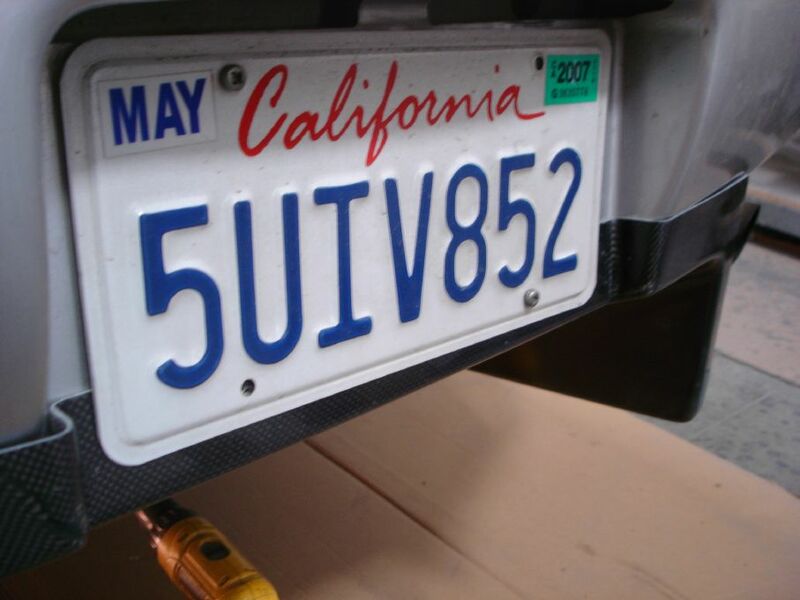 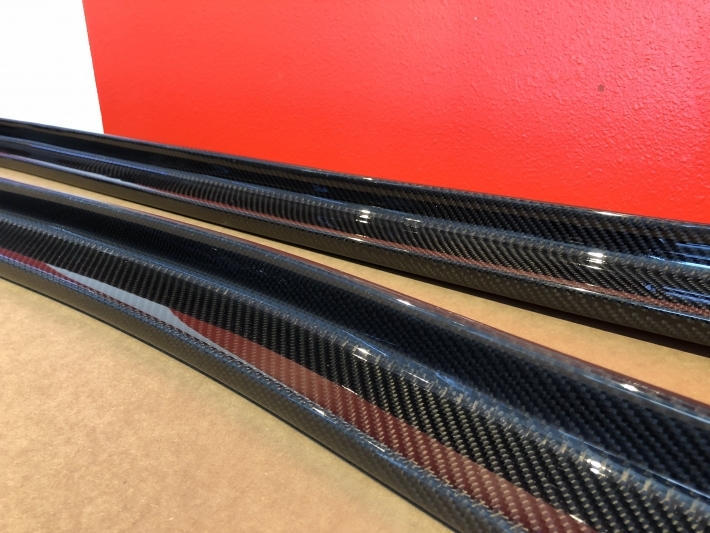 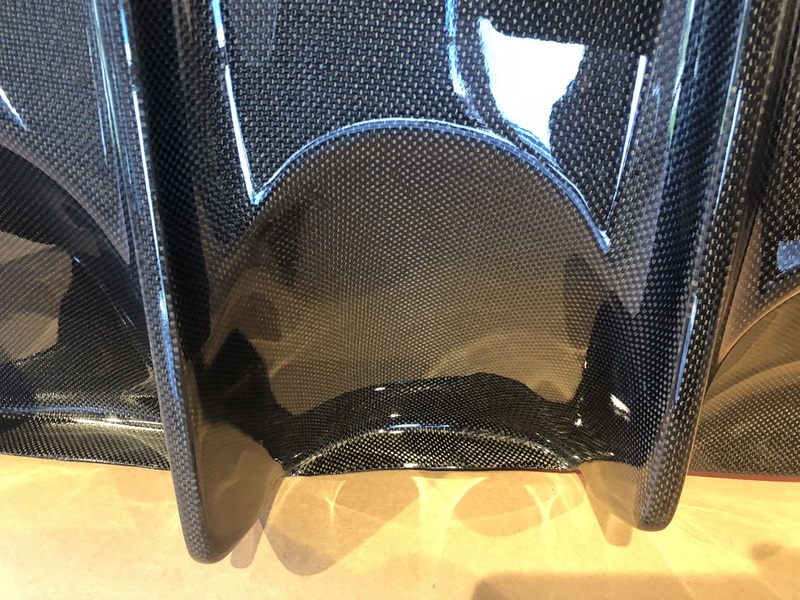 The extra carbon fiber backside reinforcement maintains a black finish unlike parts reinforced with fiberglass mat or fiberglass cloth, which tend to have a scuffy white finish. 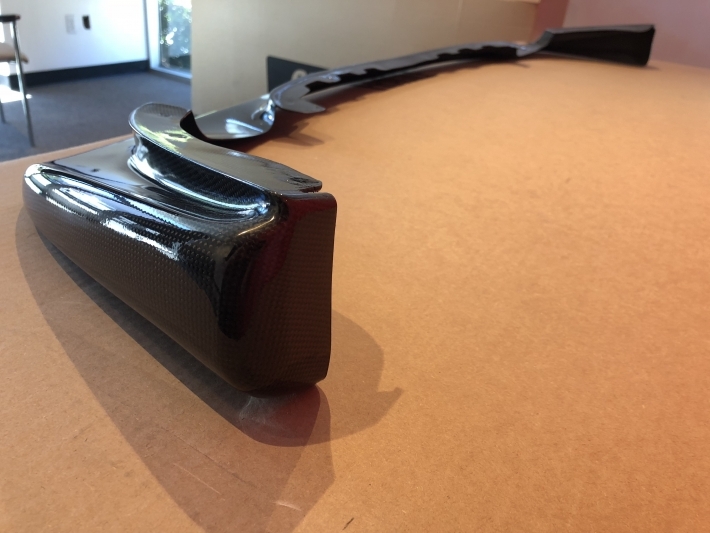 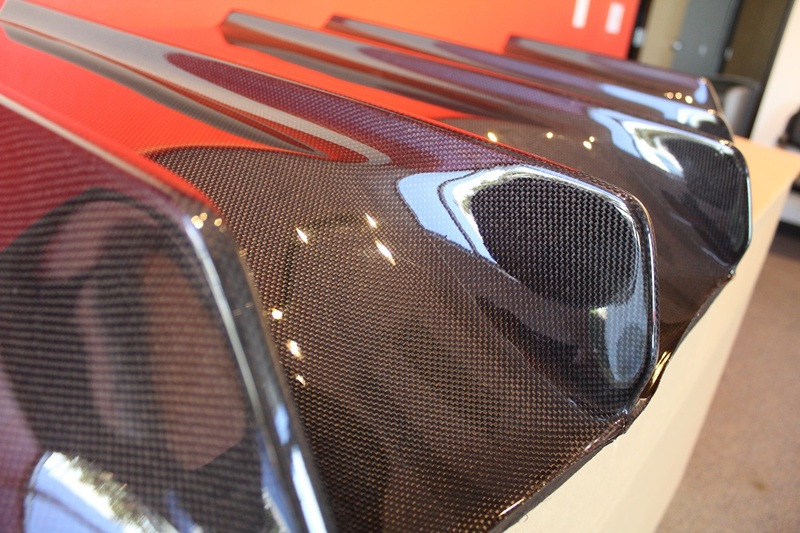 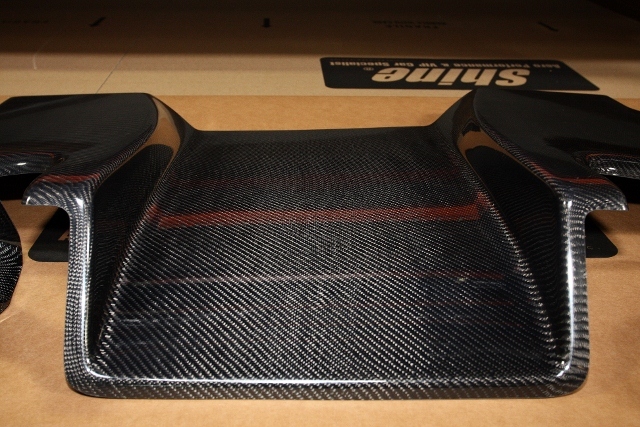 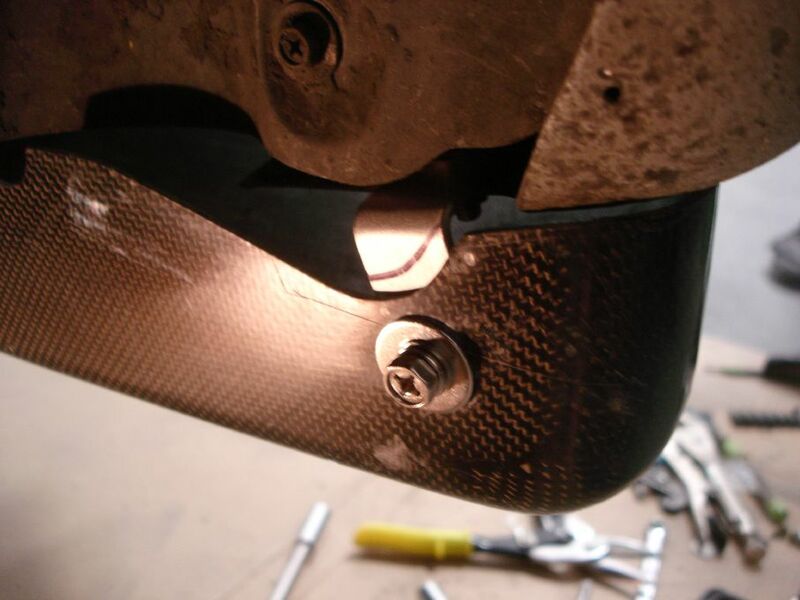 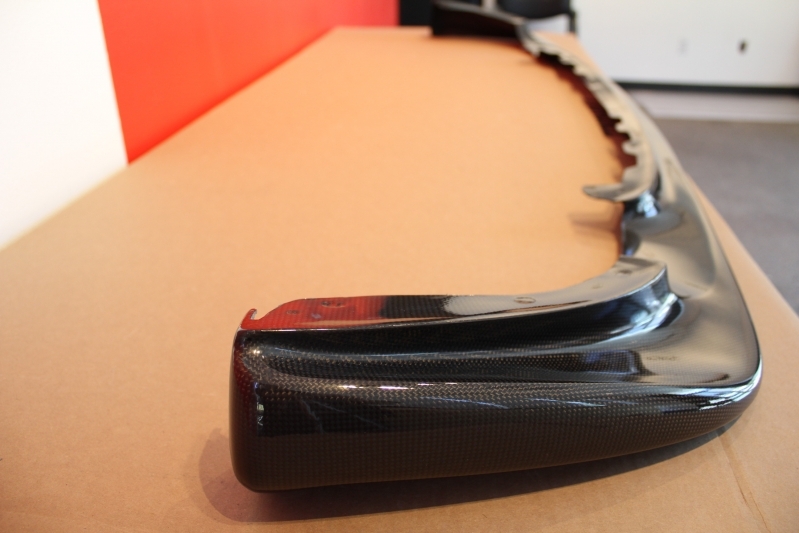 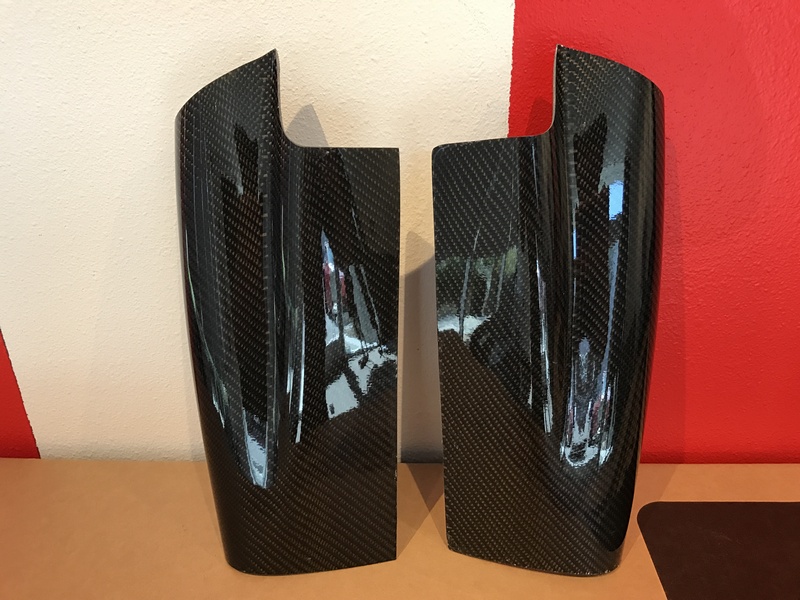 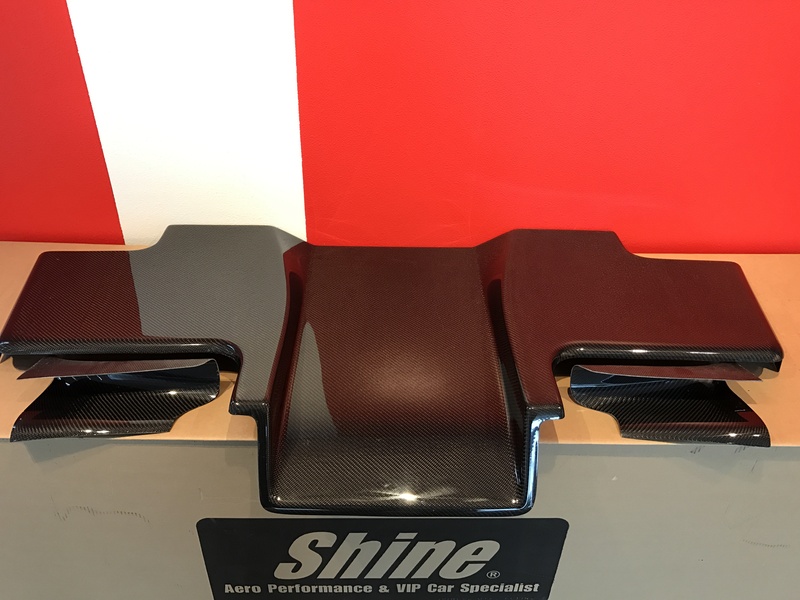 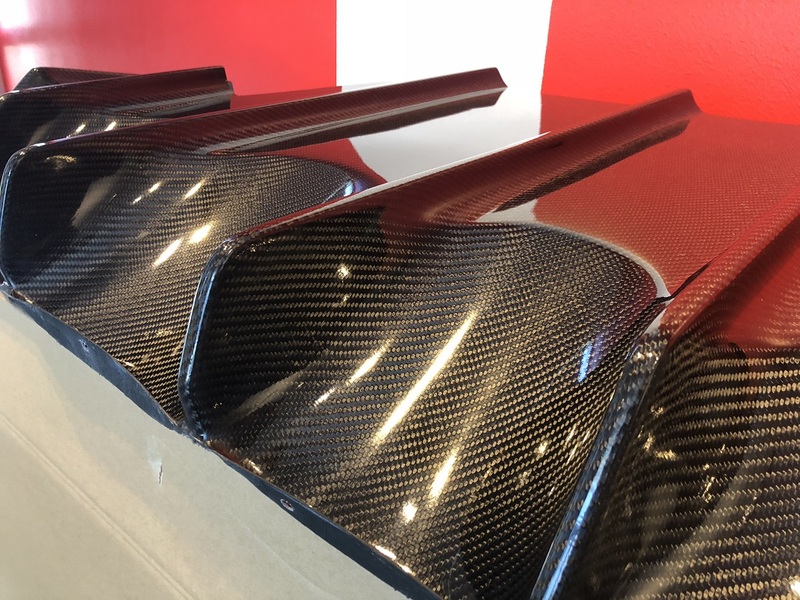 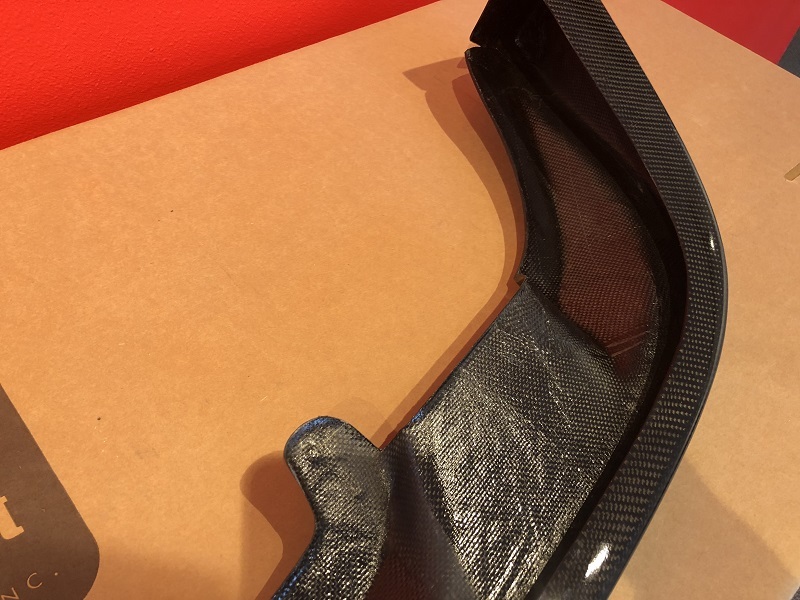 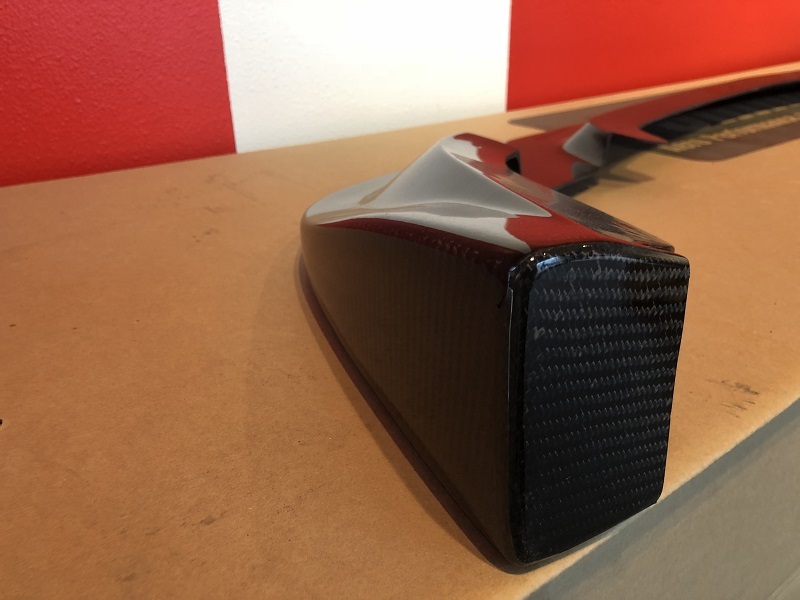 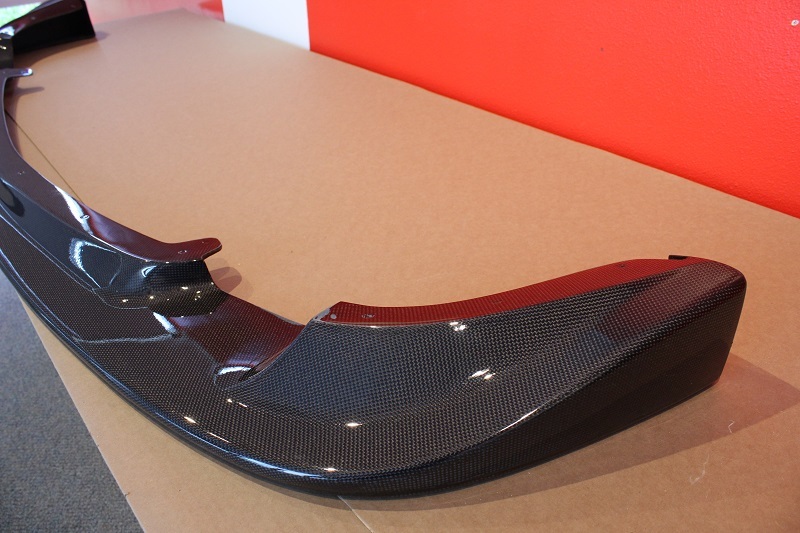 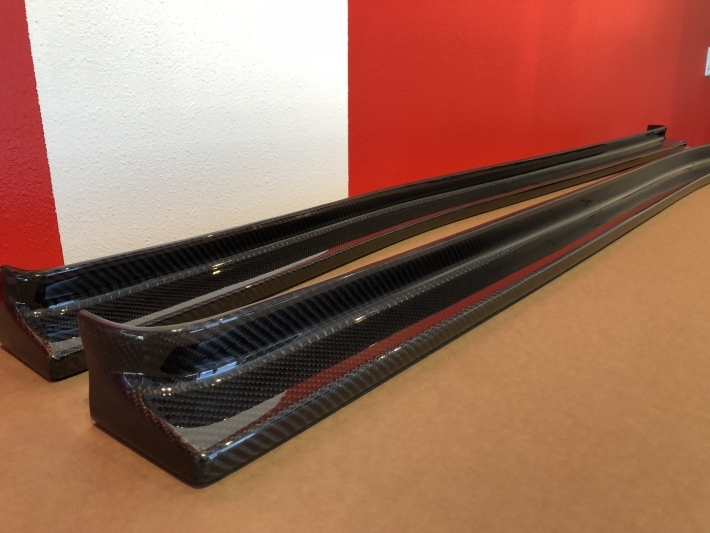 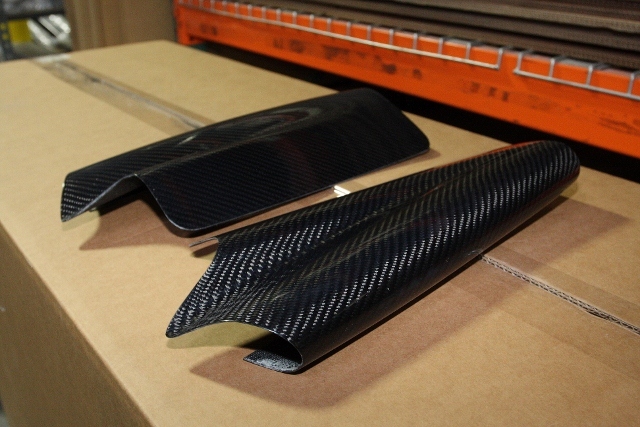 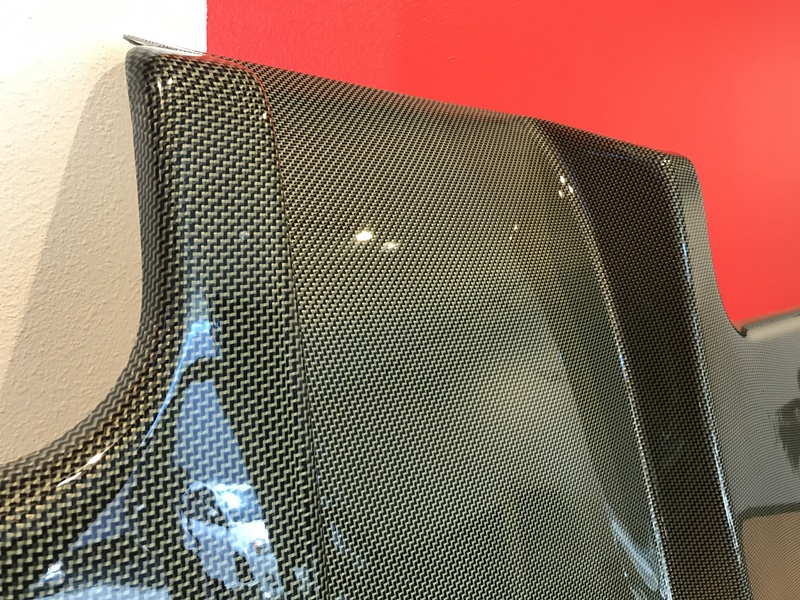 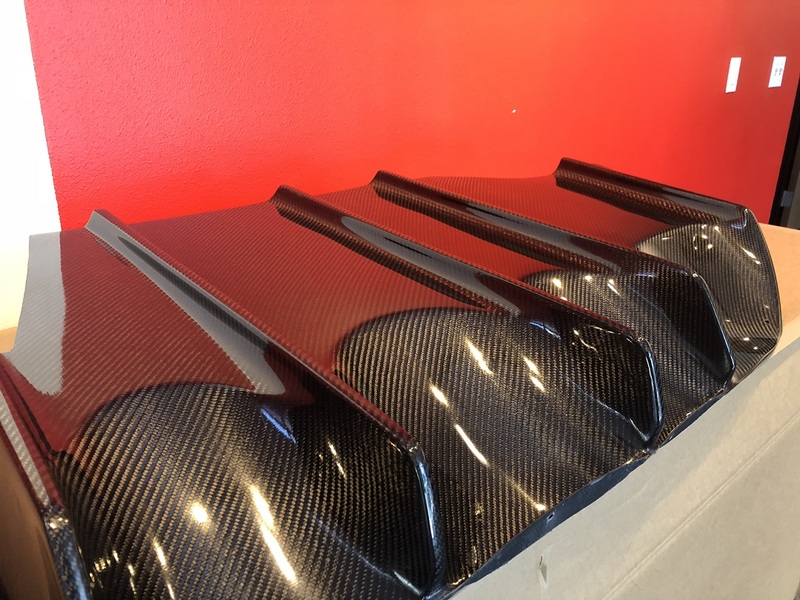 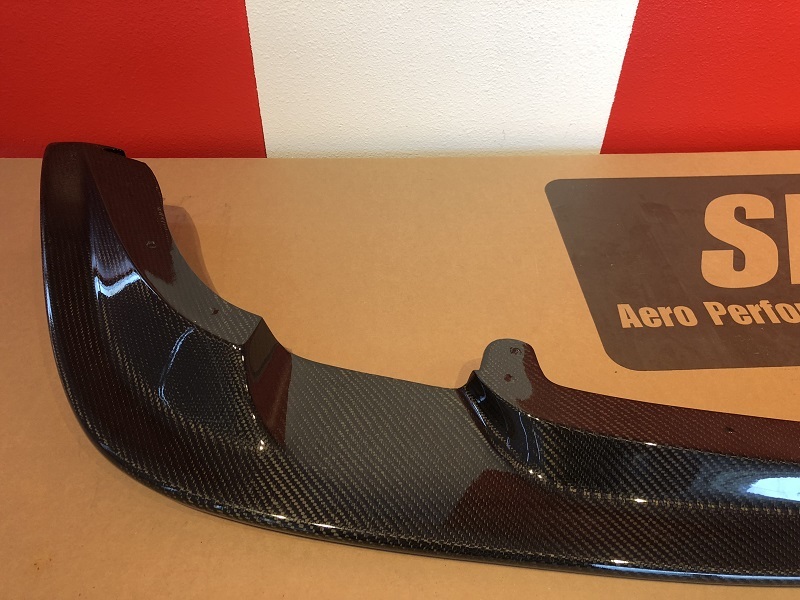 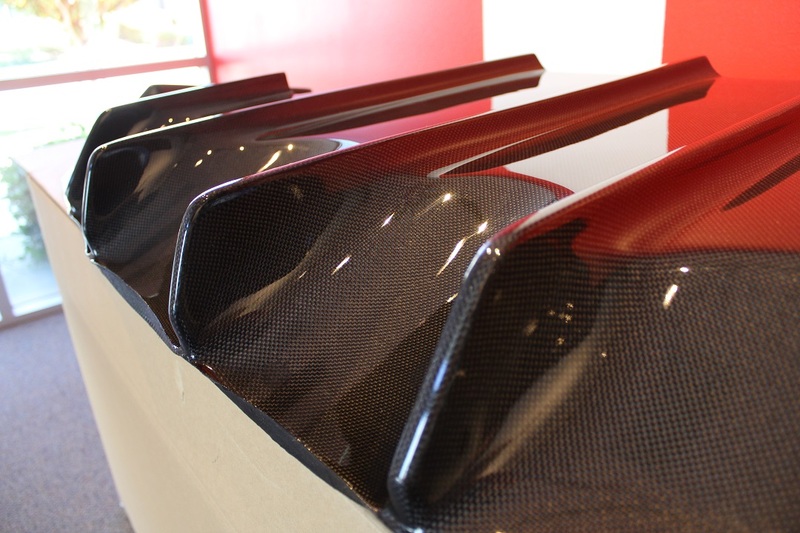 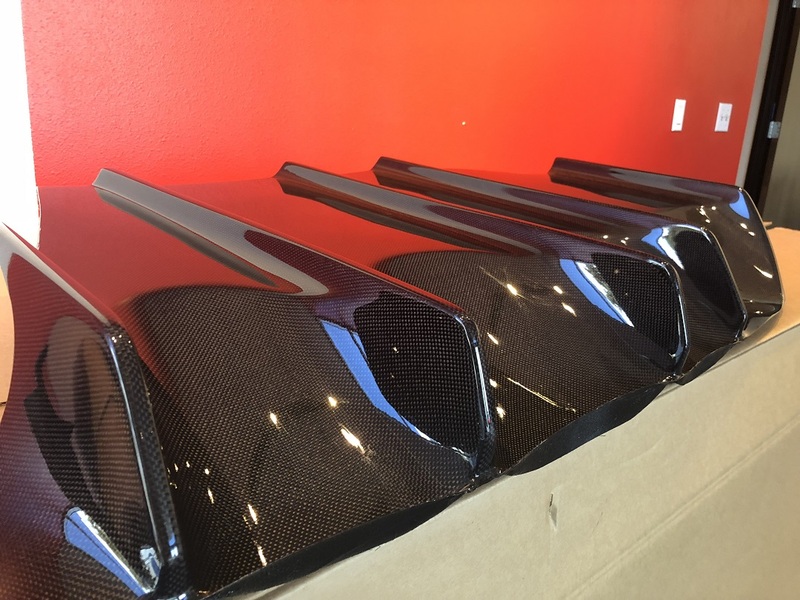 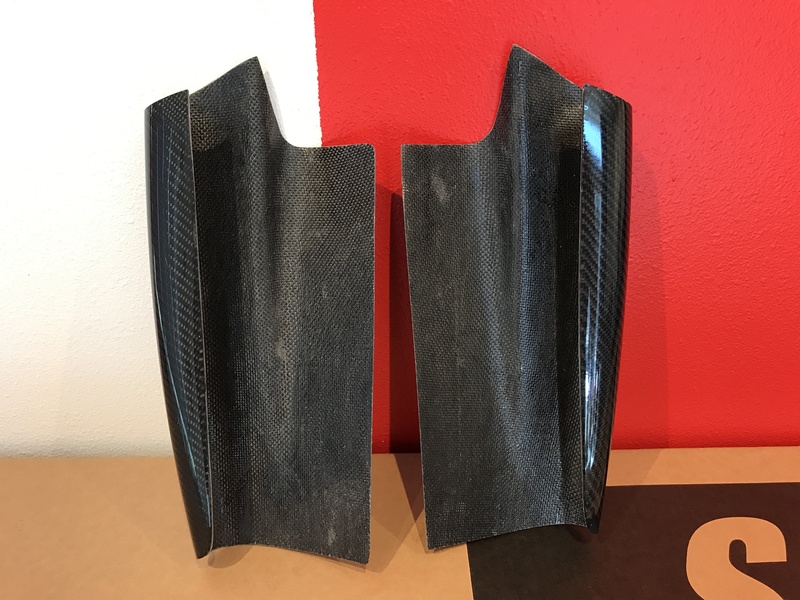 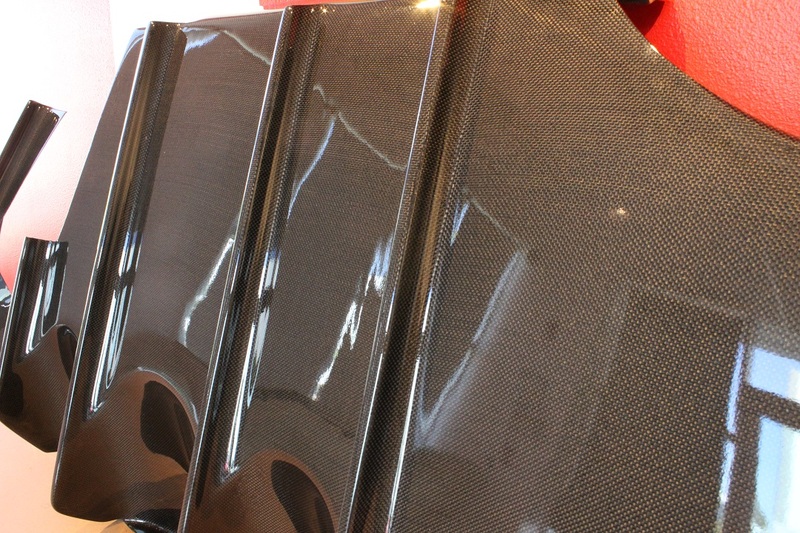 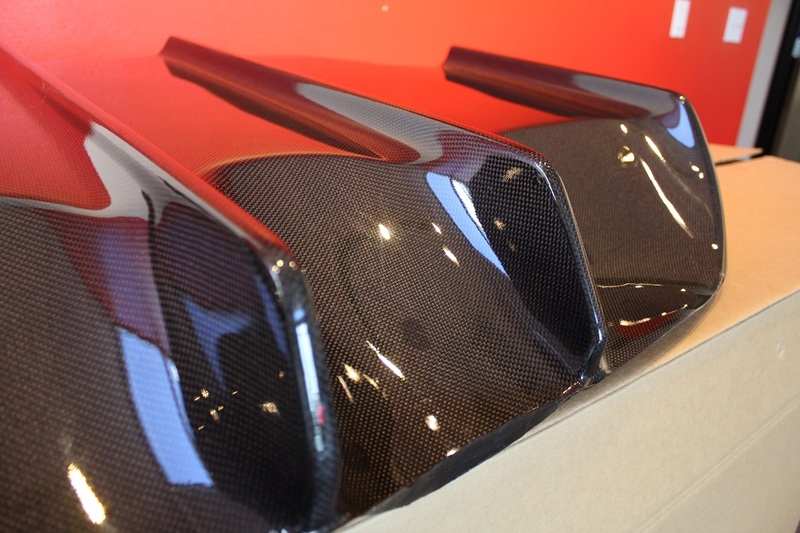 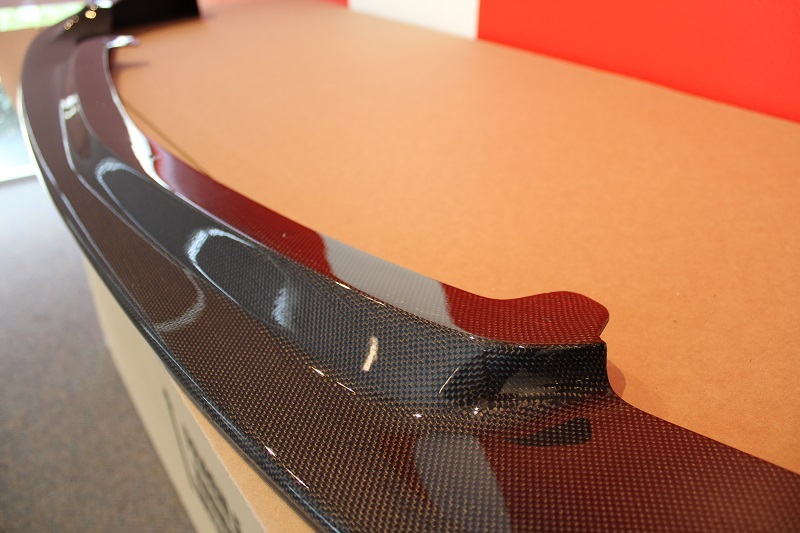 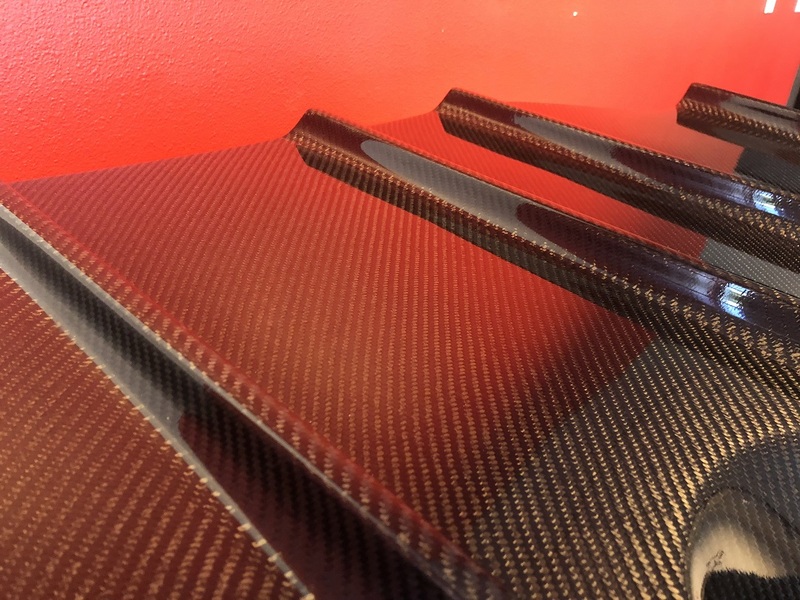 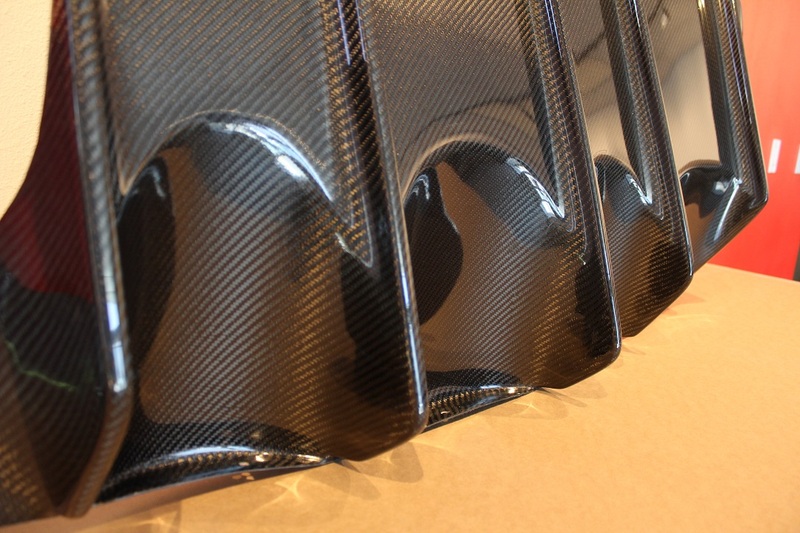 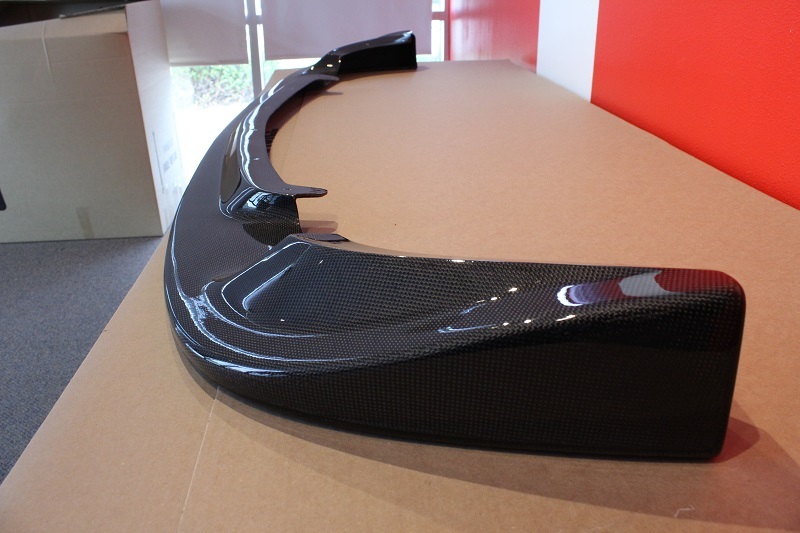 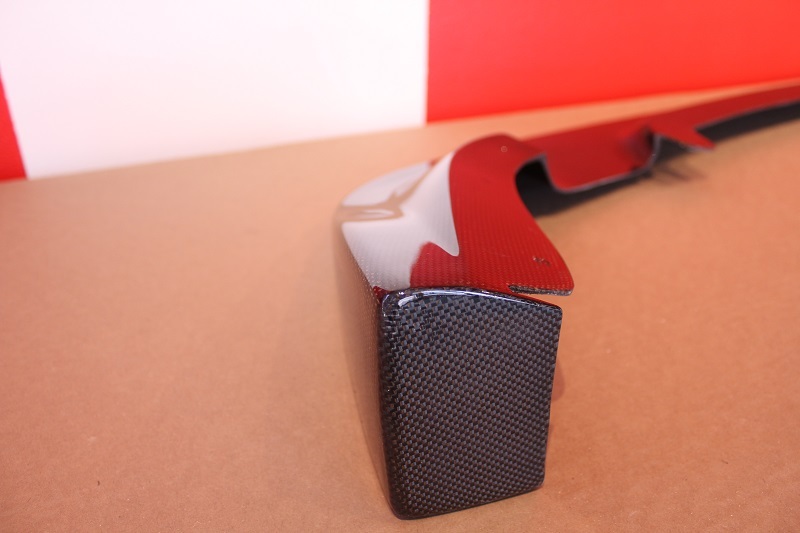 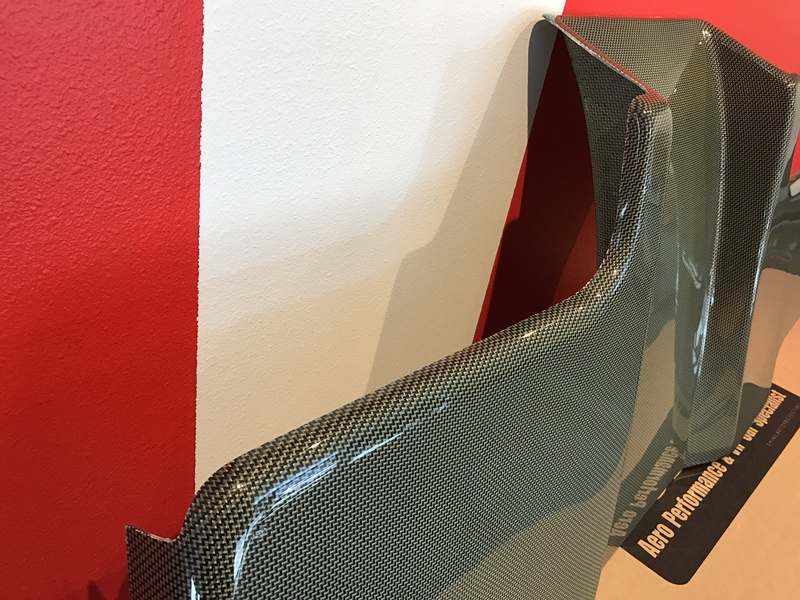 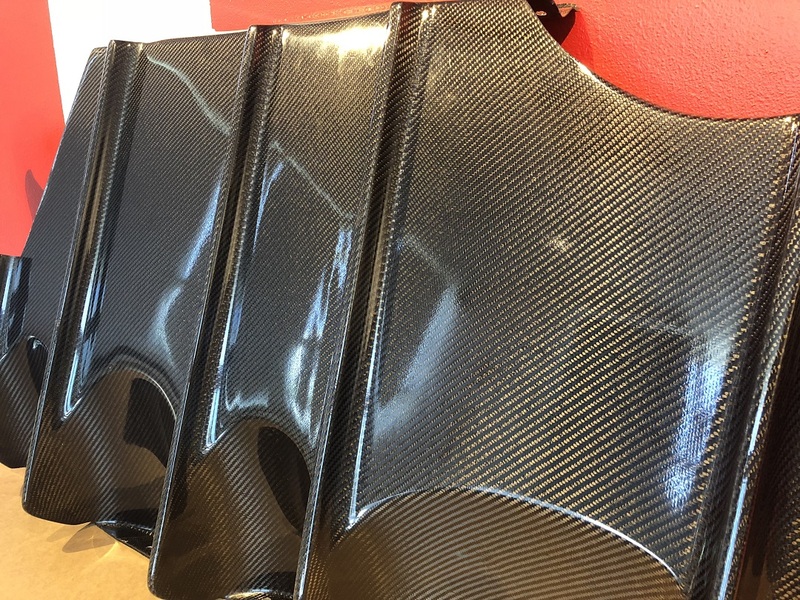 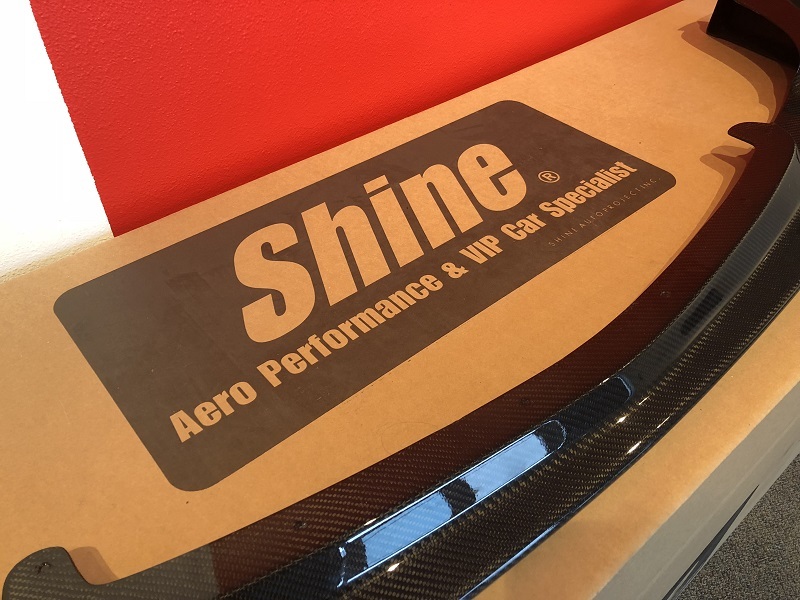 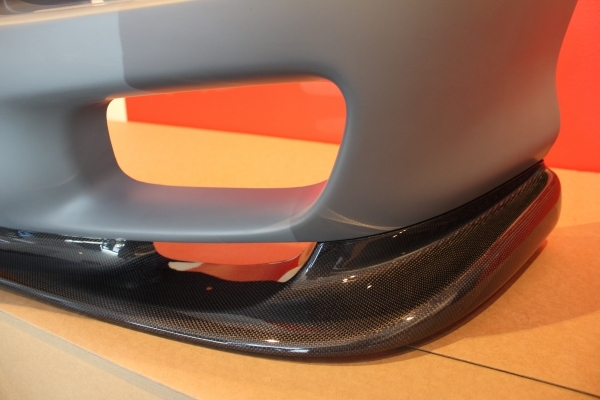 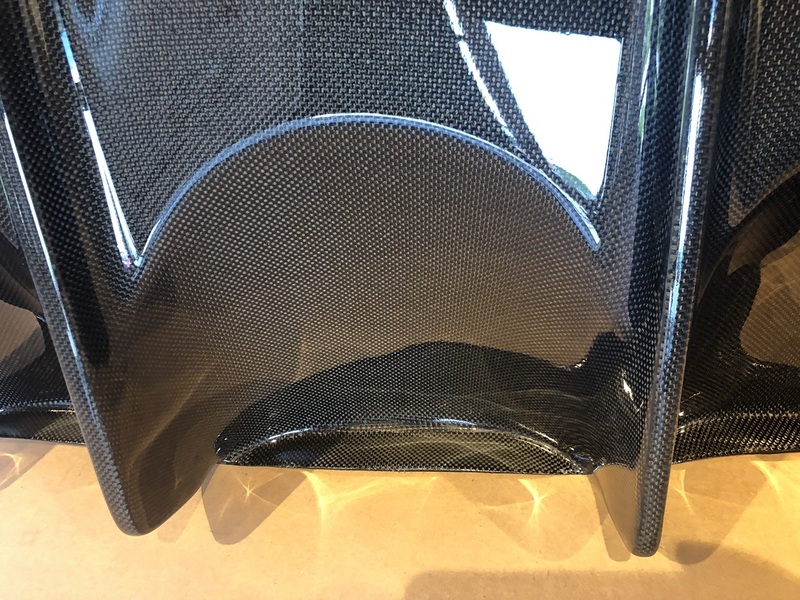 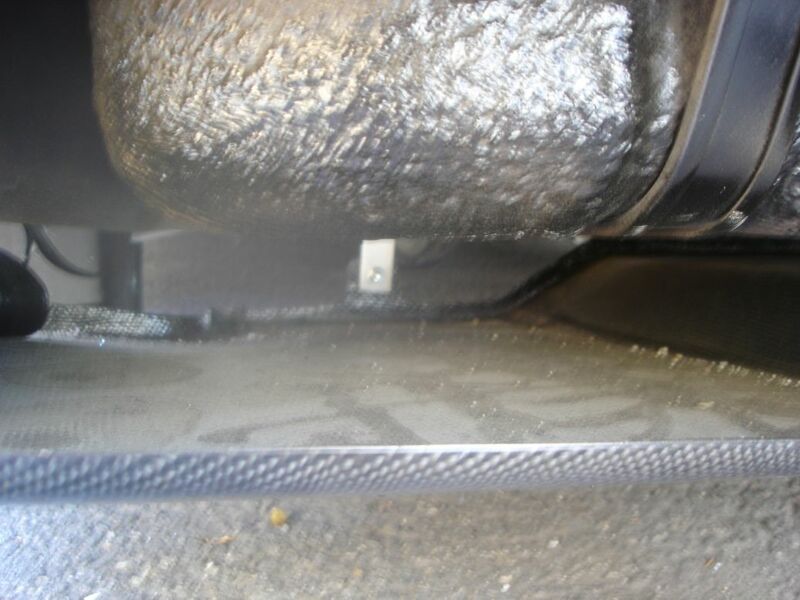 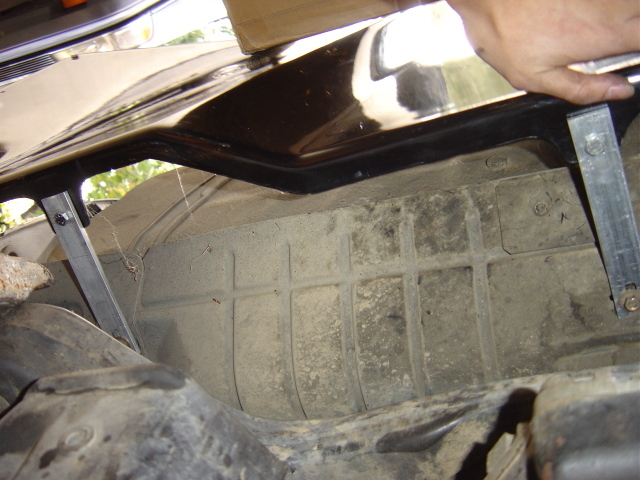 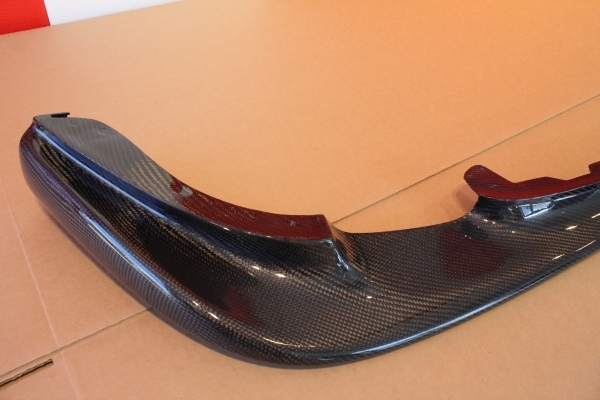 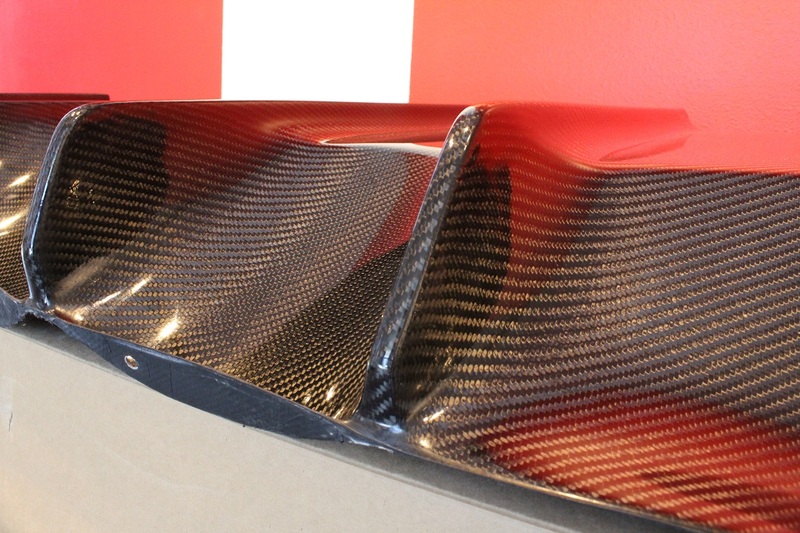 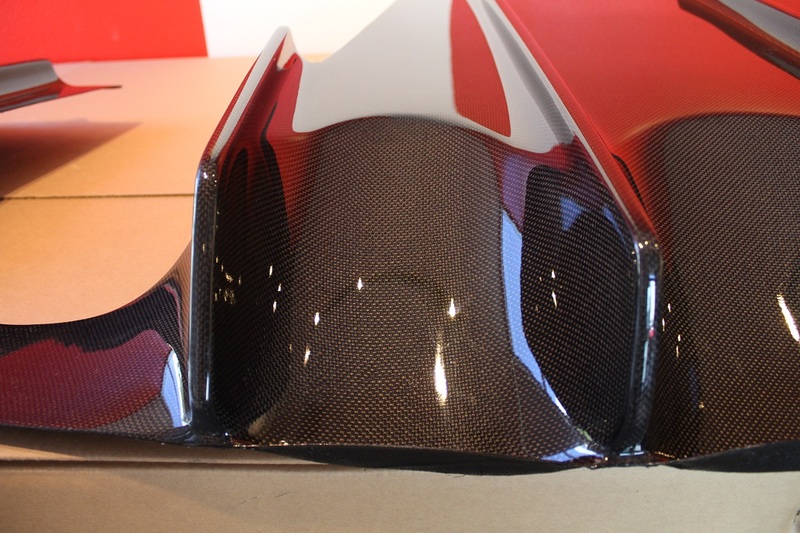 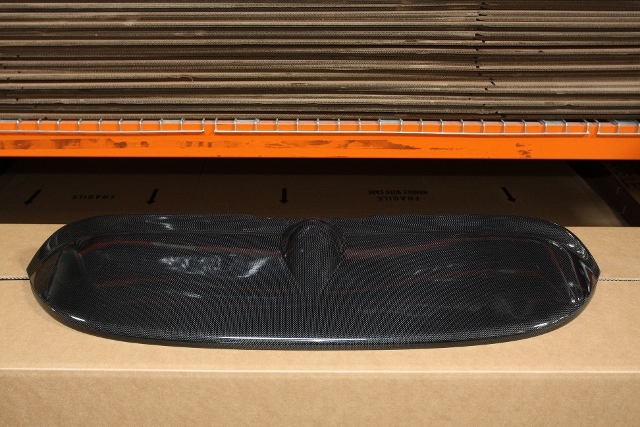 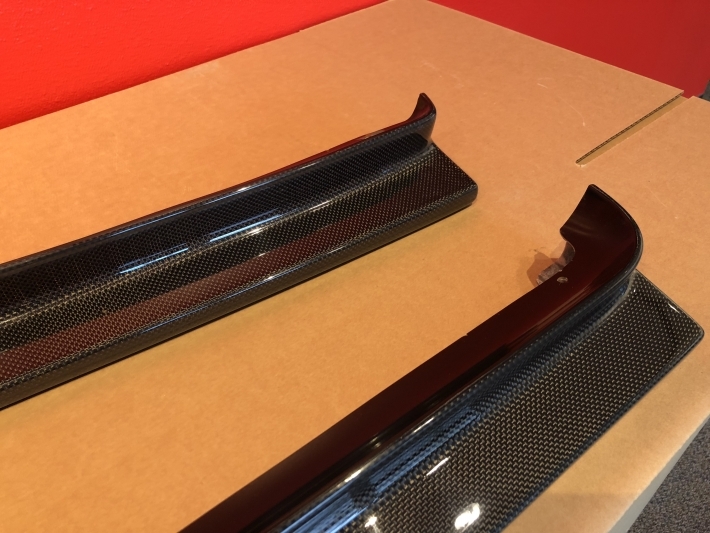 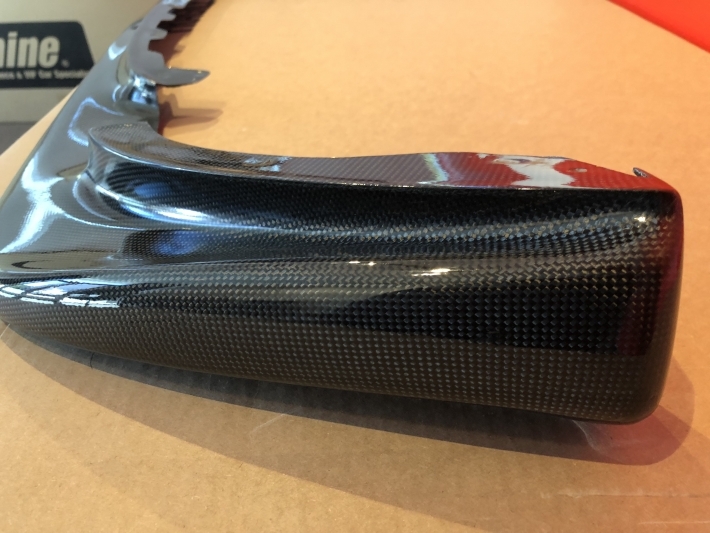 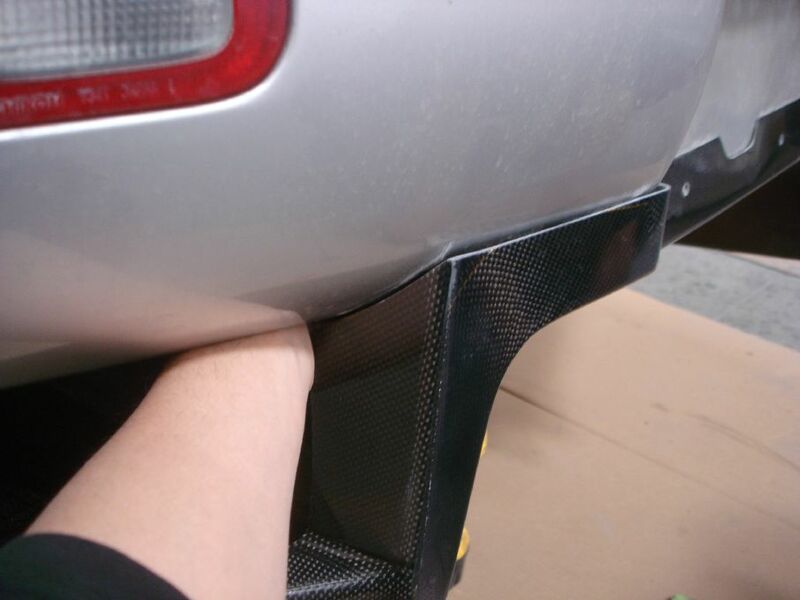 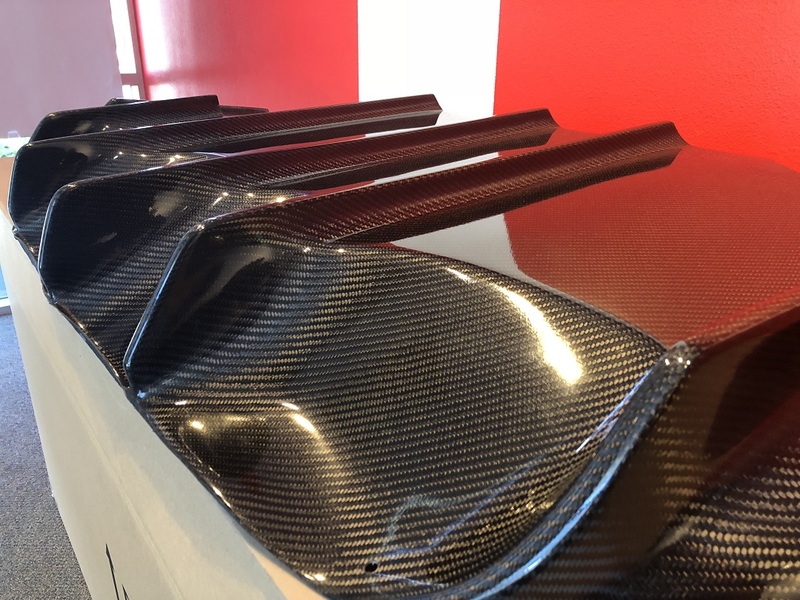 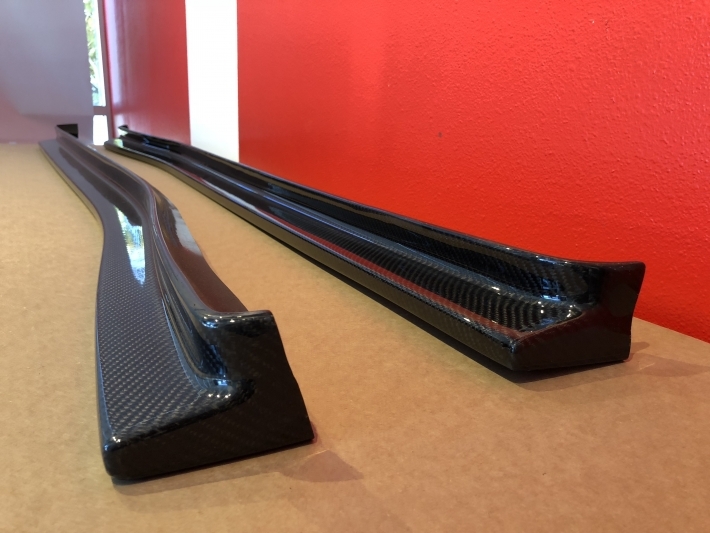 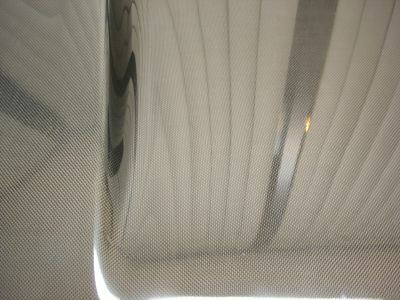 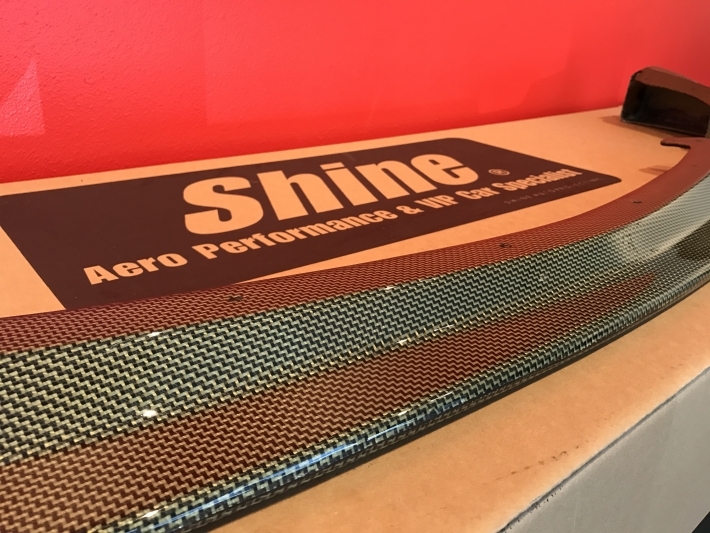 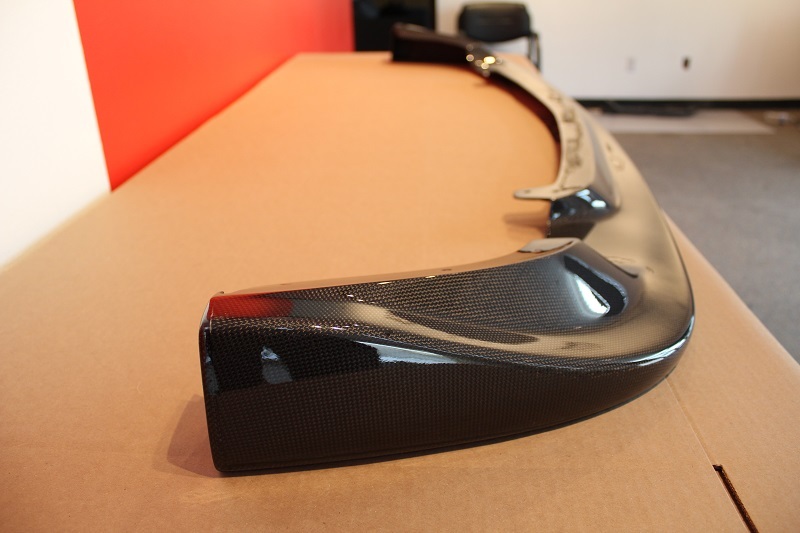 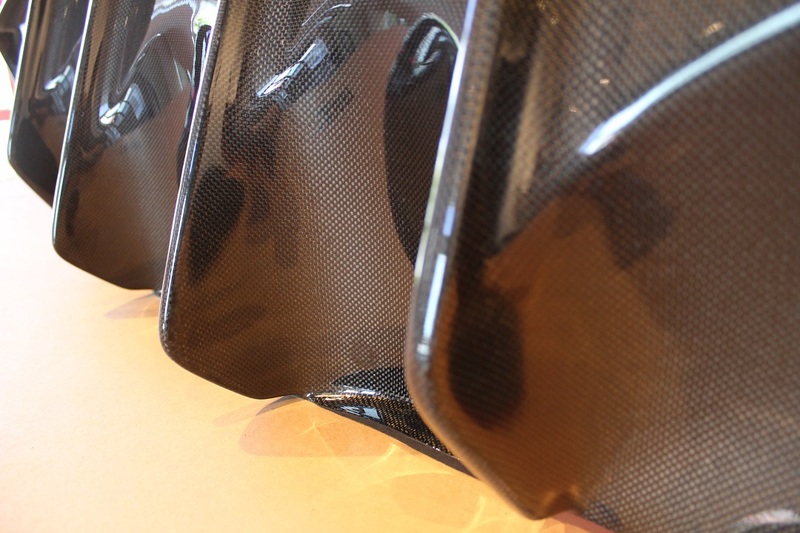 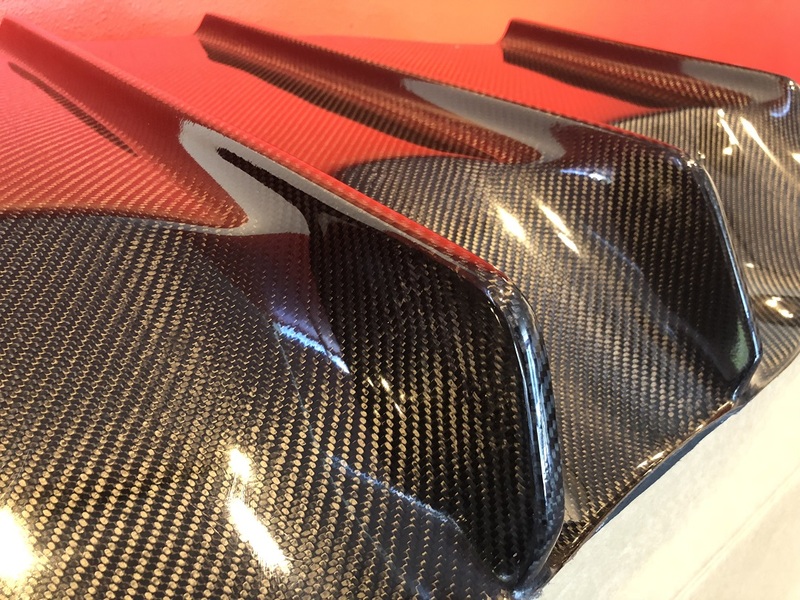 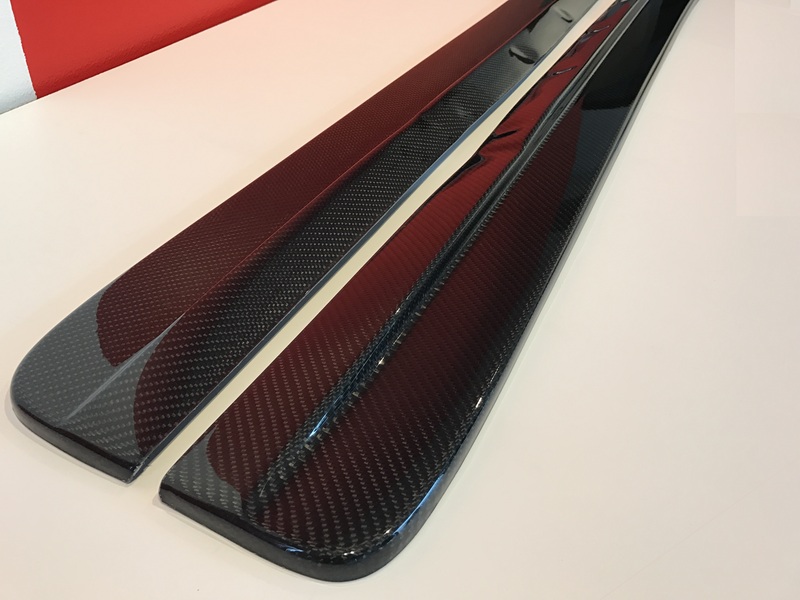 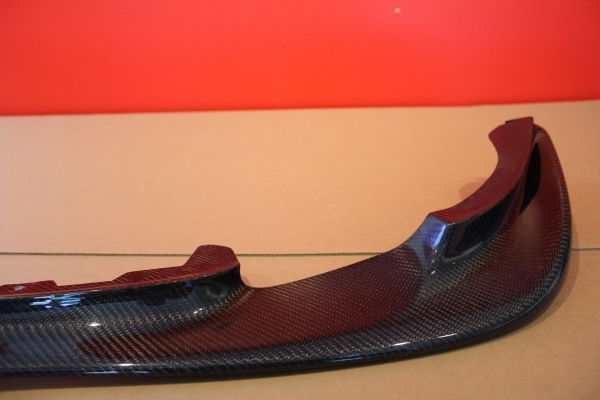 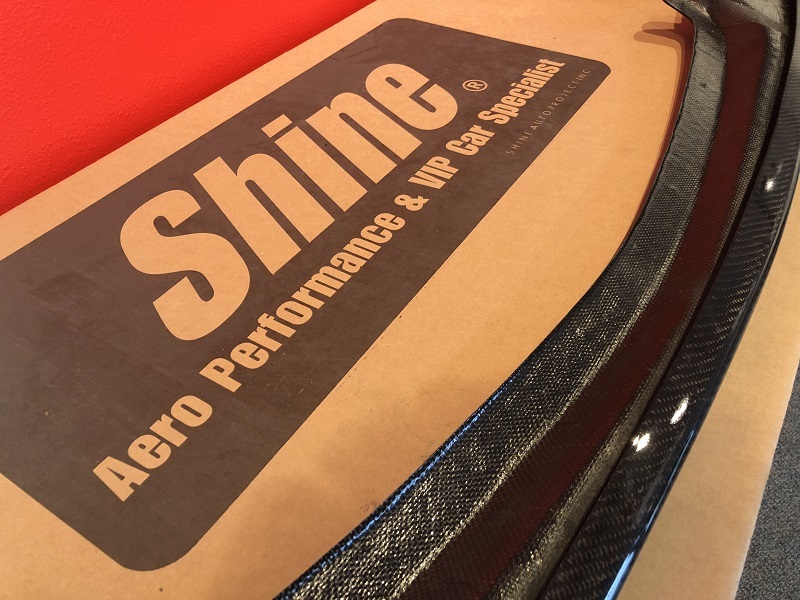 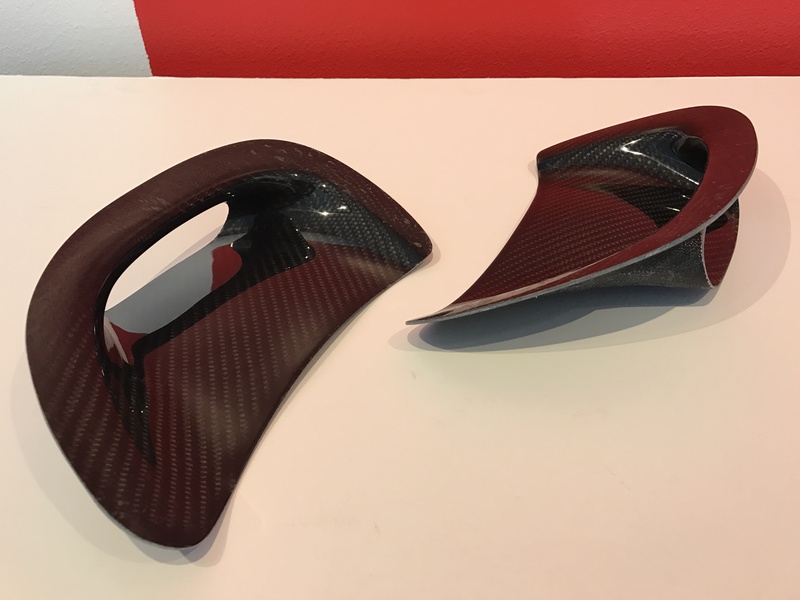 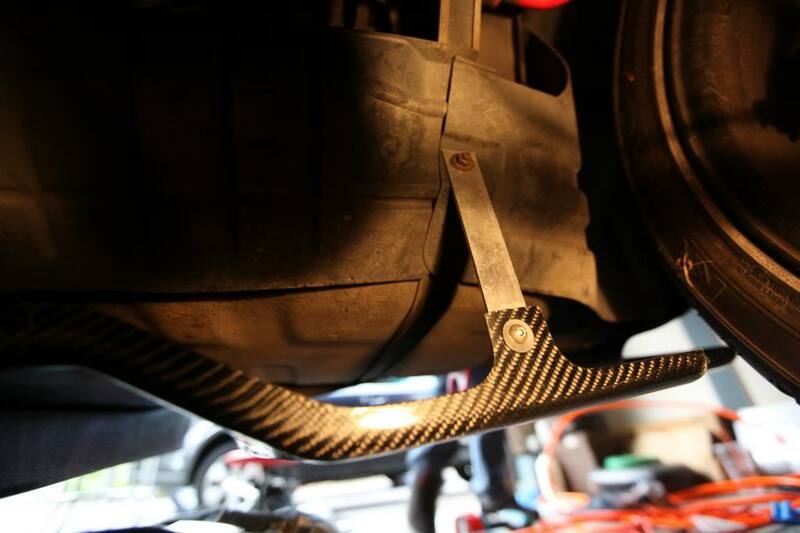 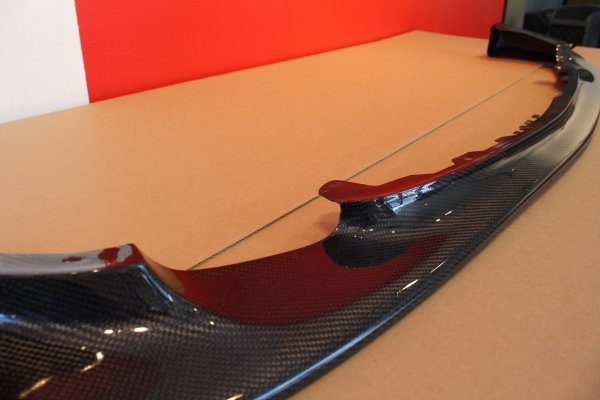 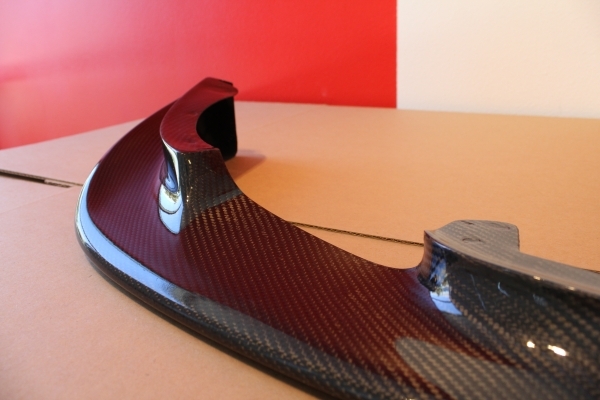 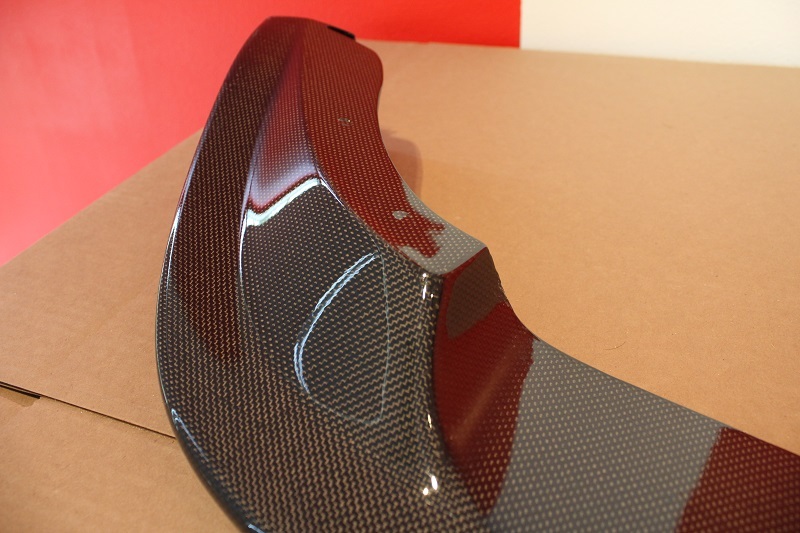 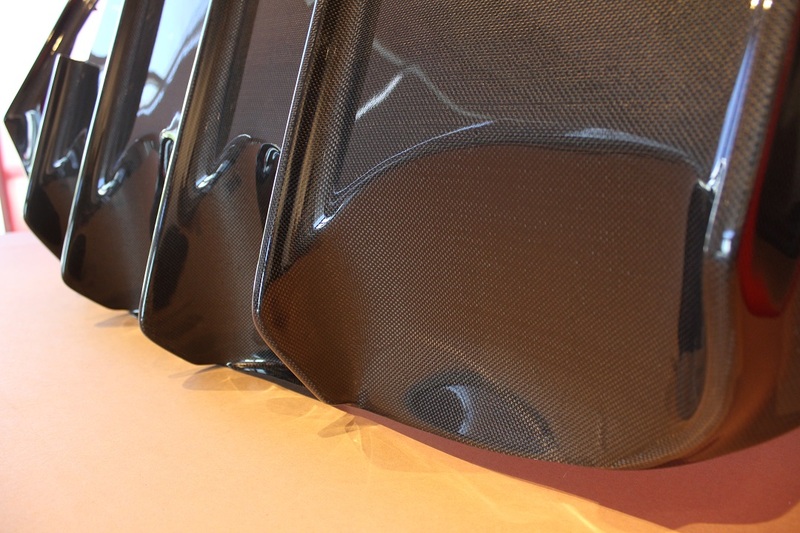 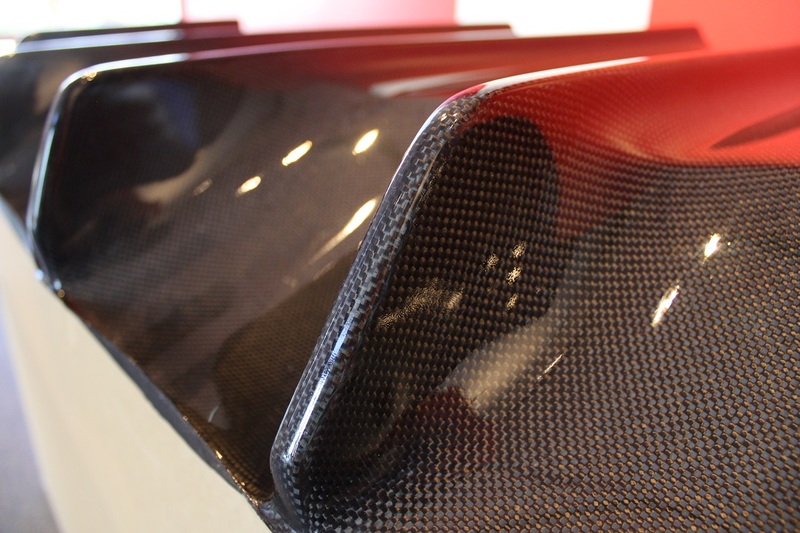 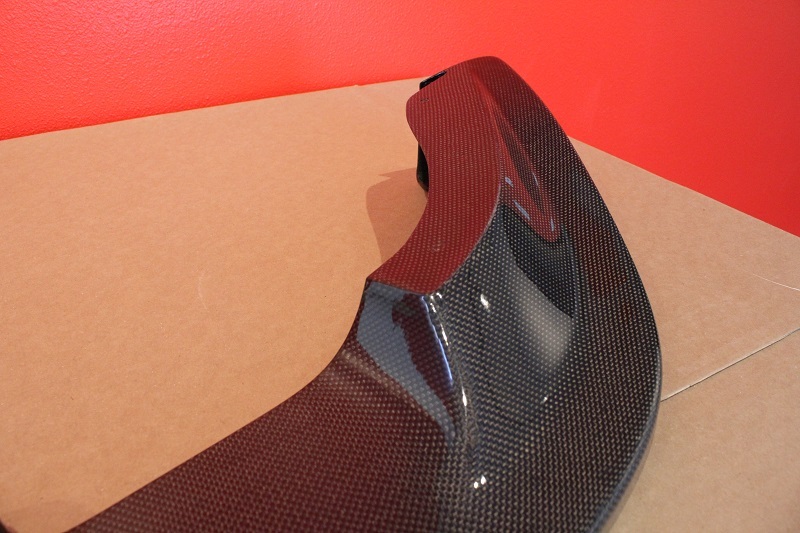 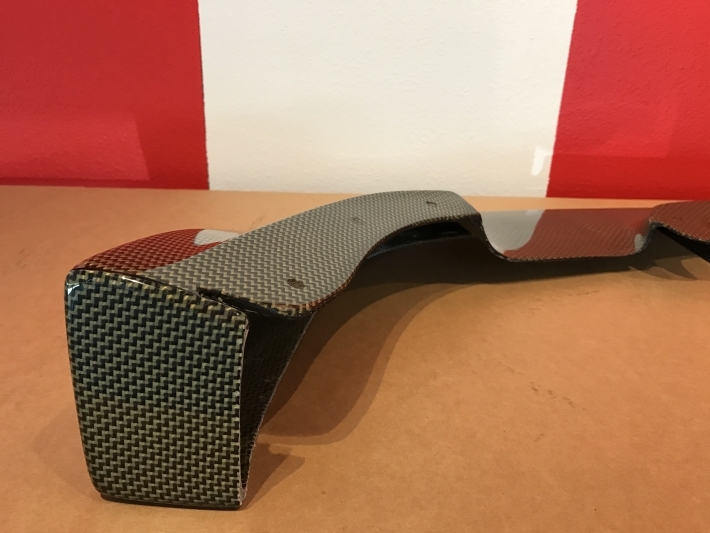 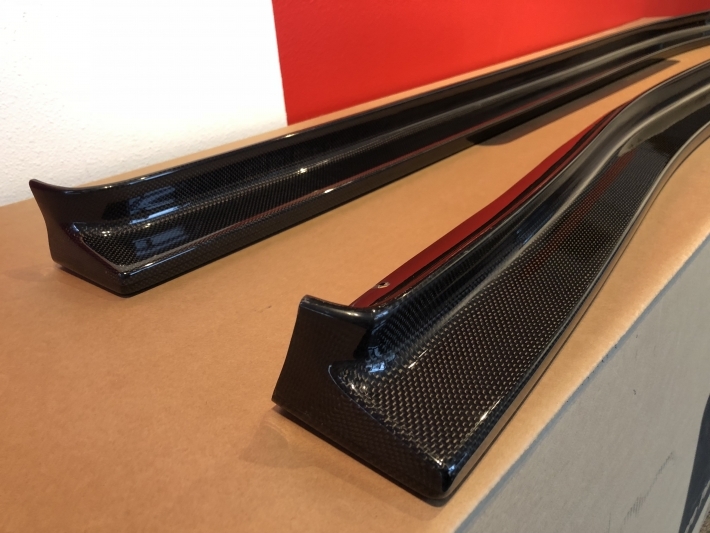 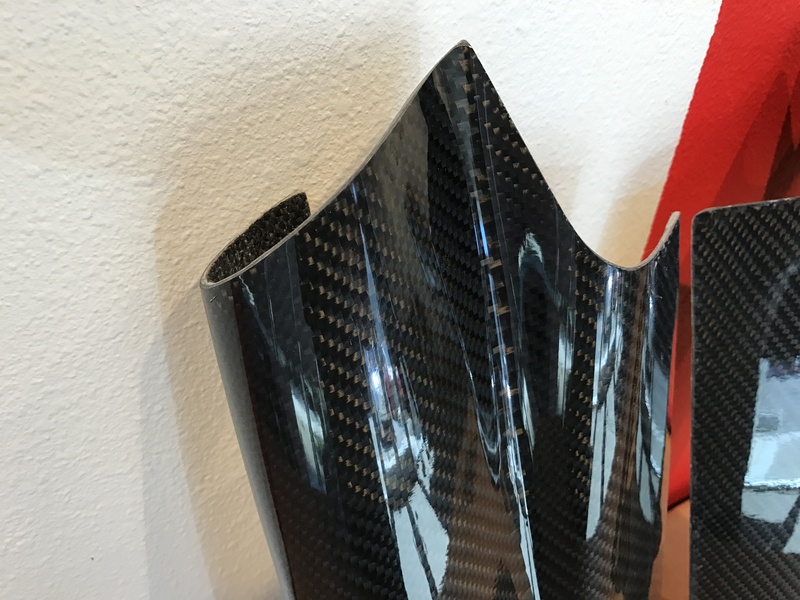 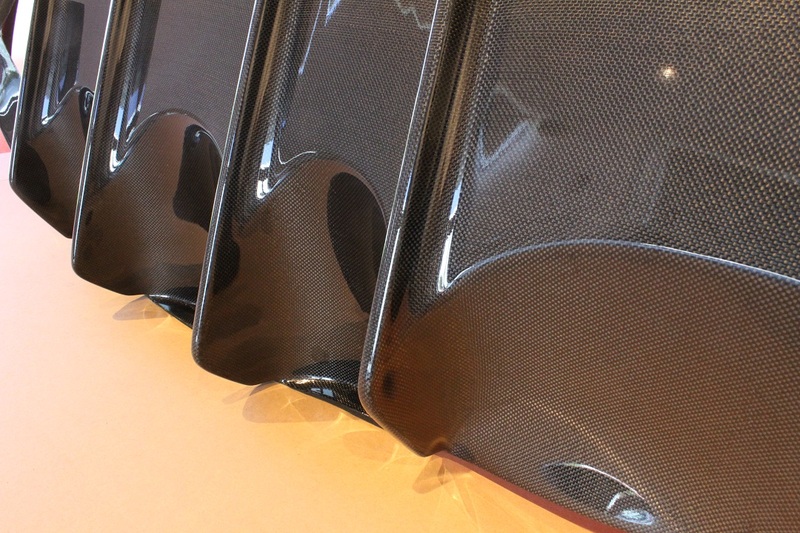 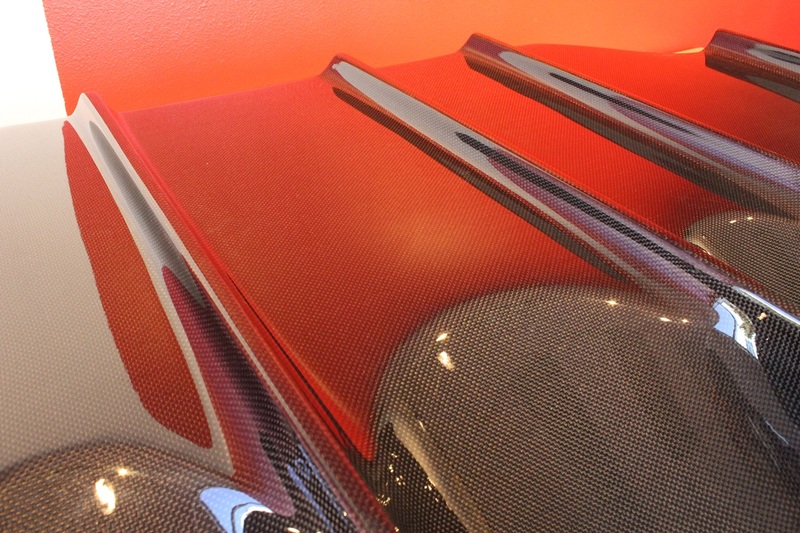 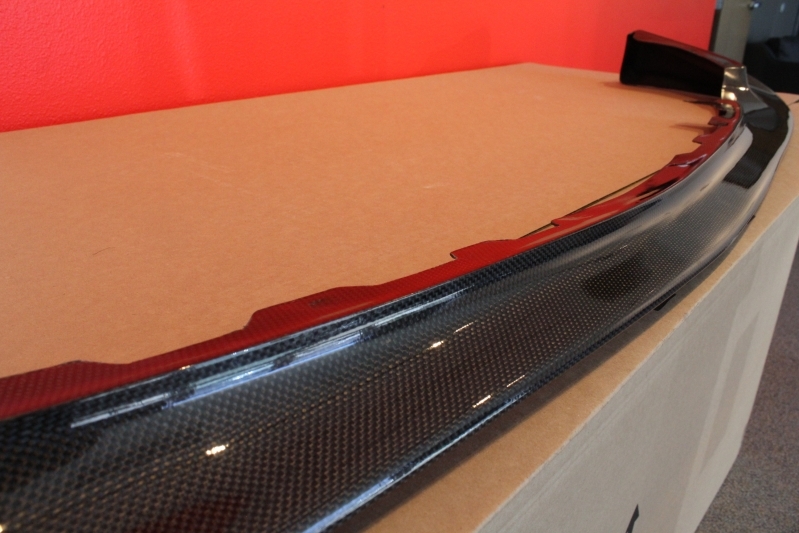 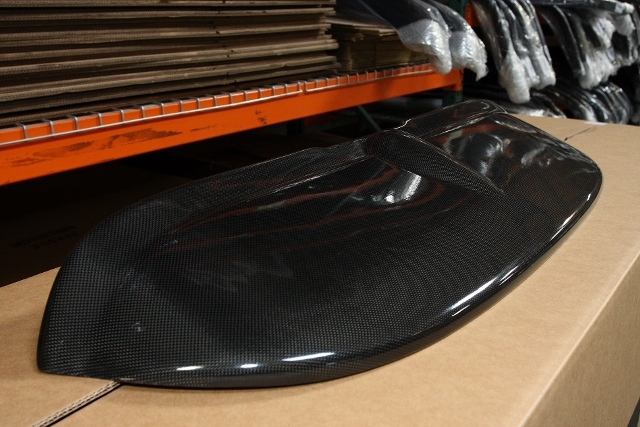 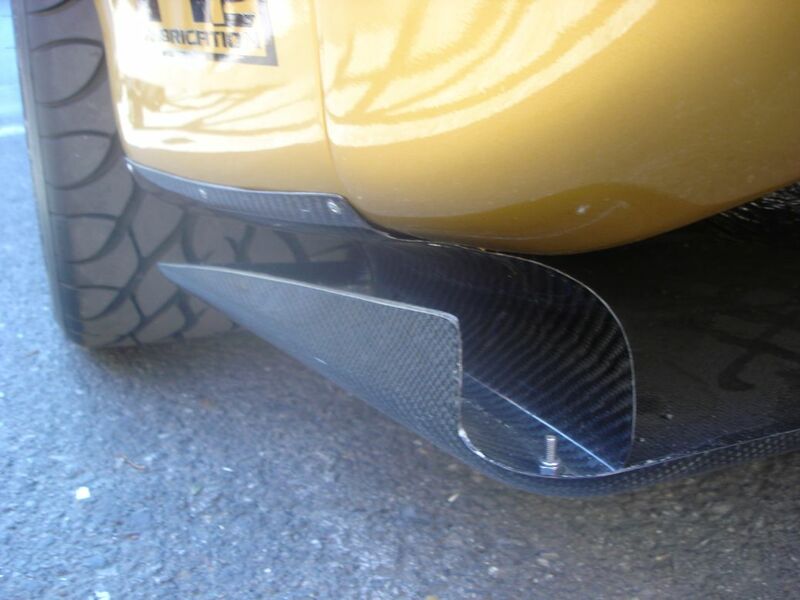 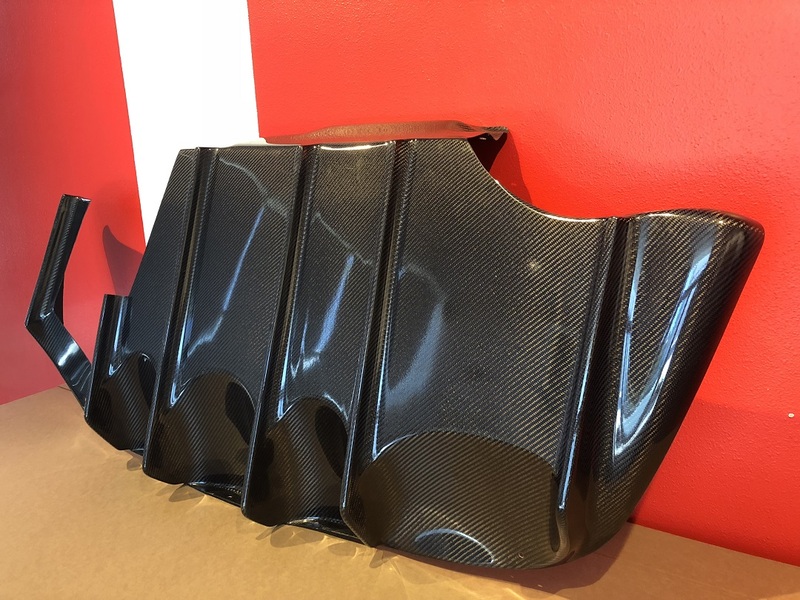 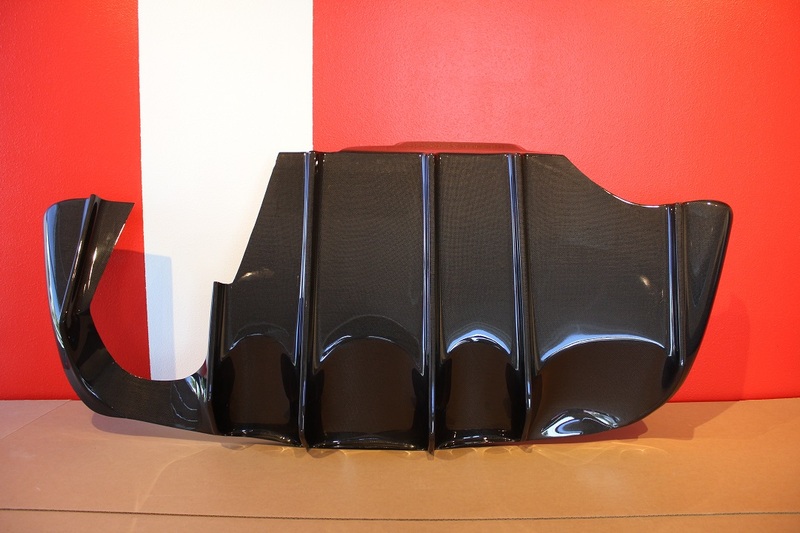 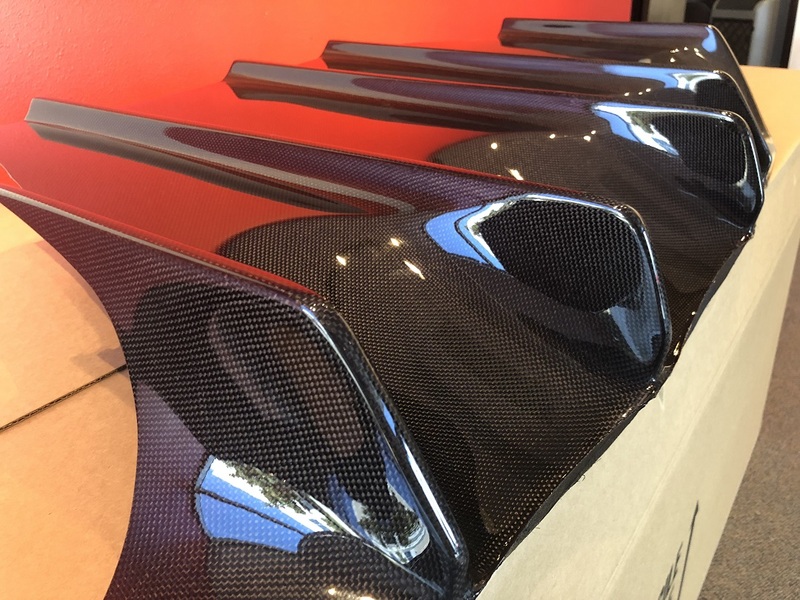 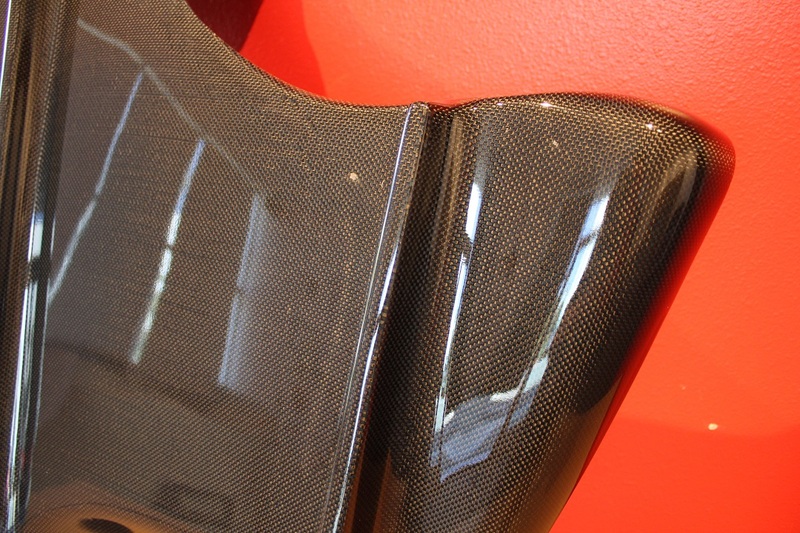 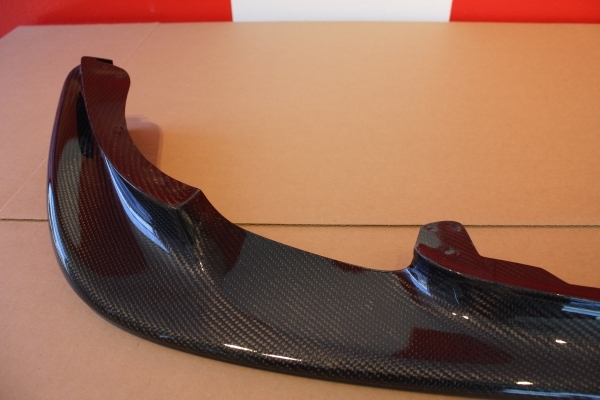 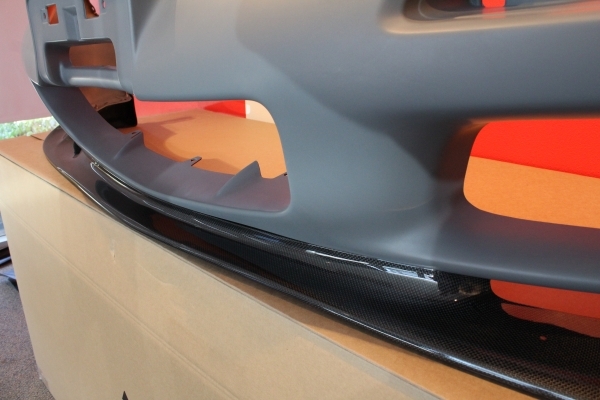 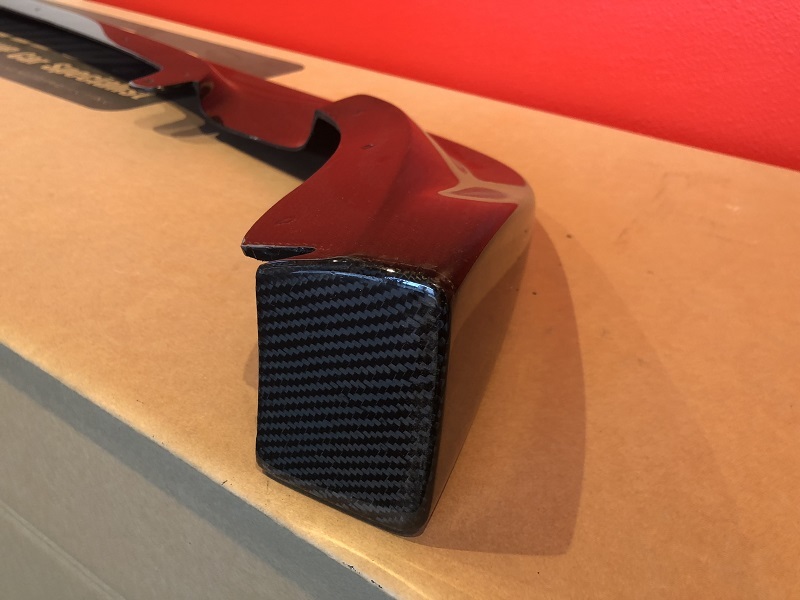 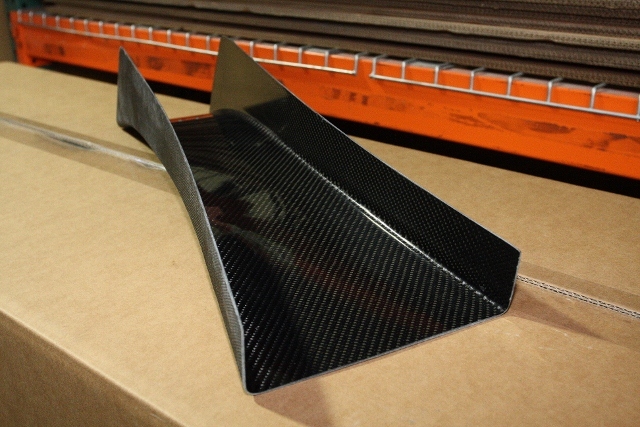 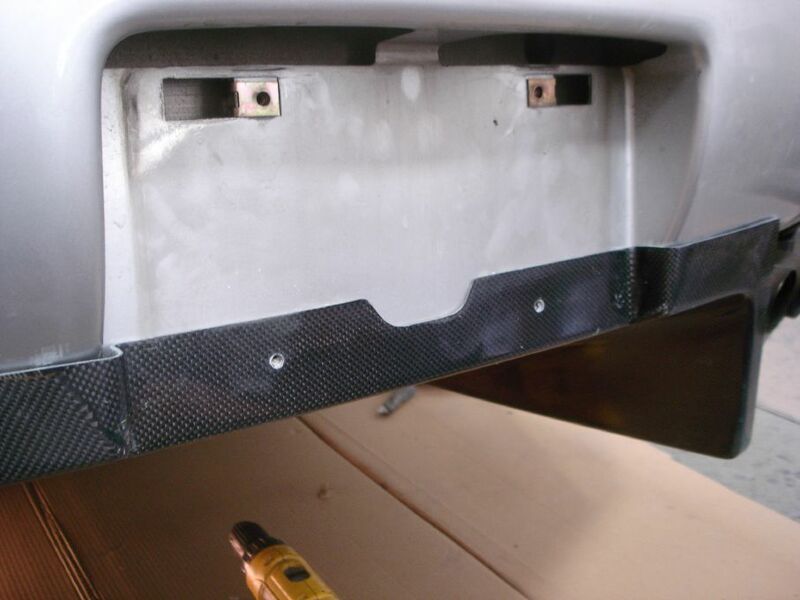 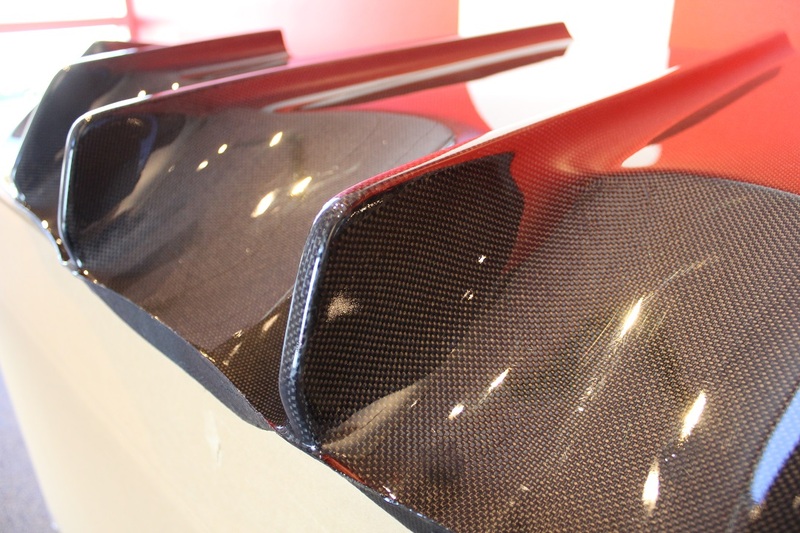 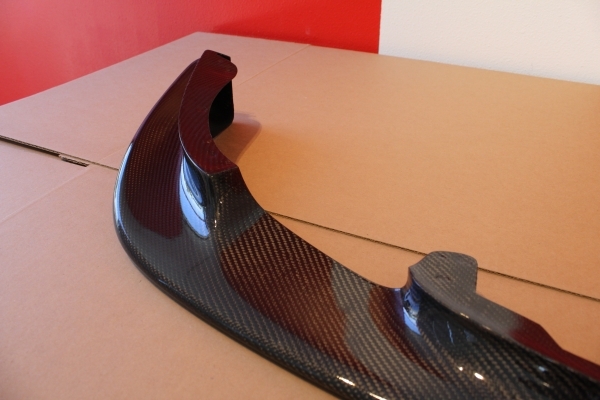 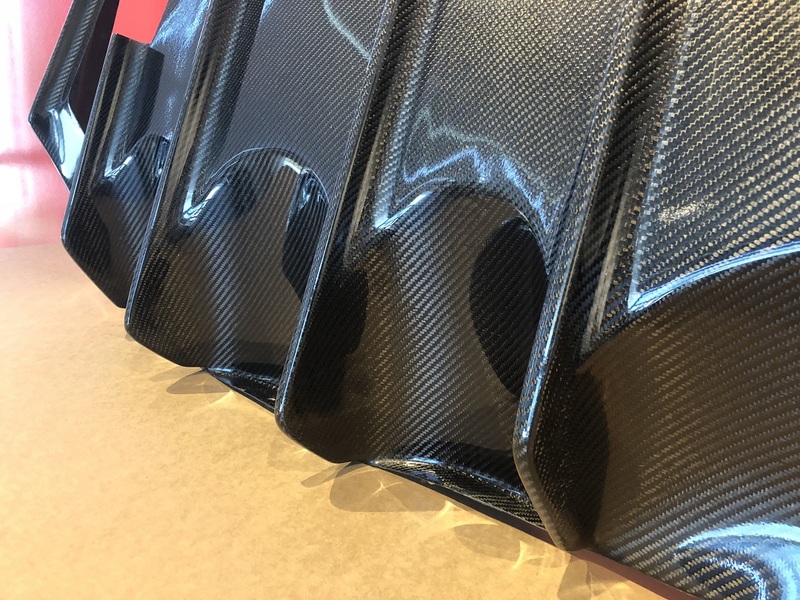 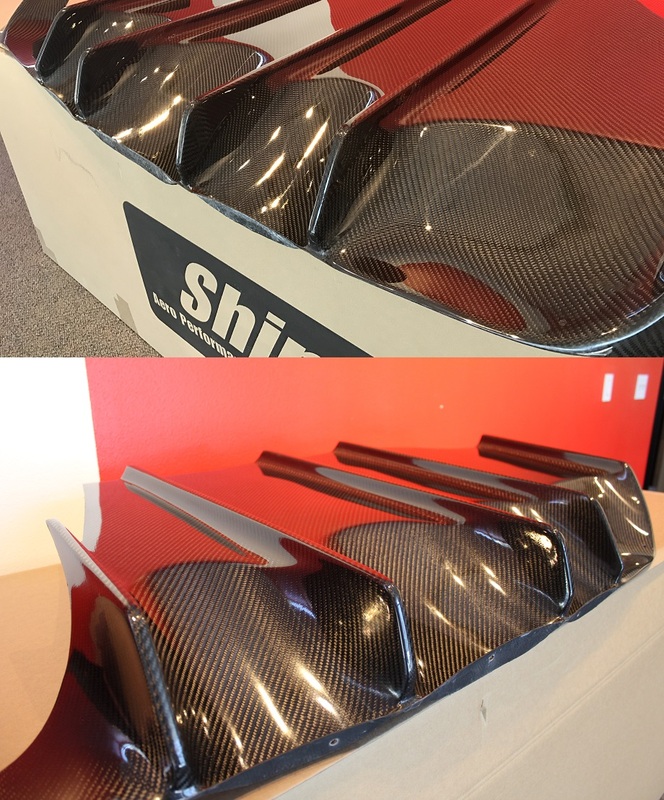 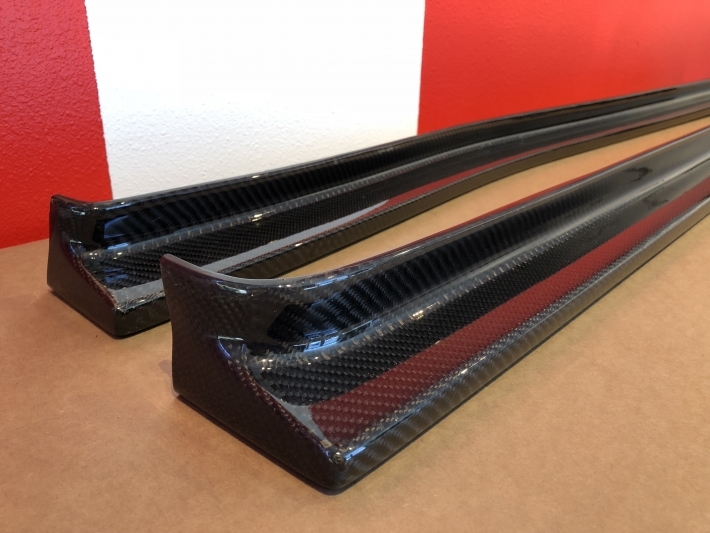 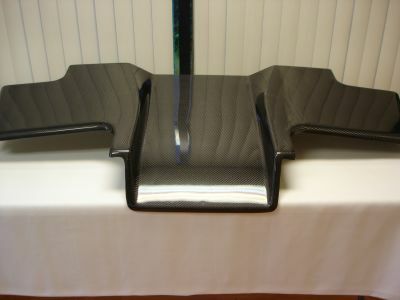 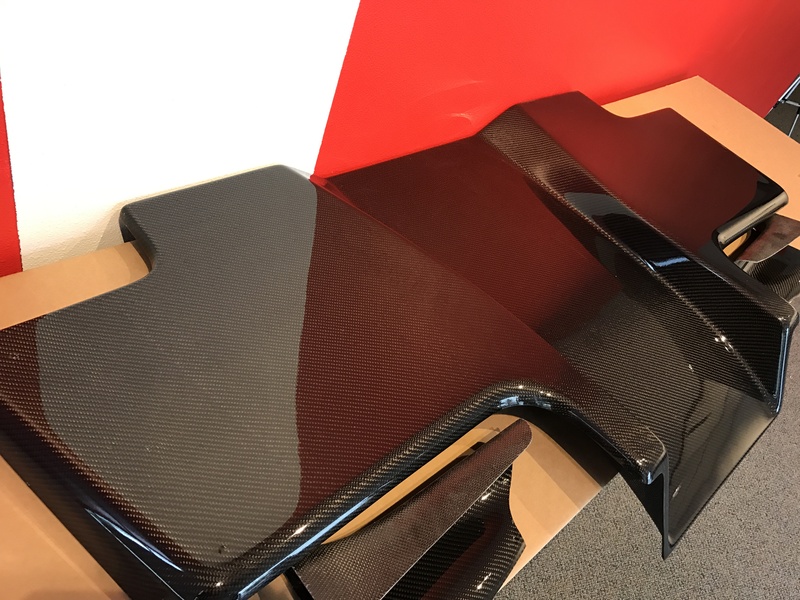 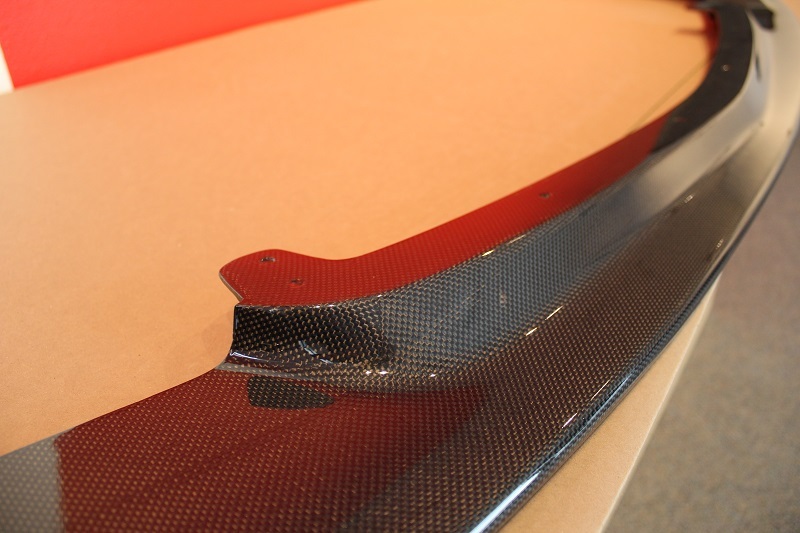 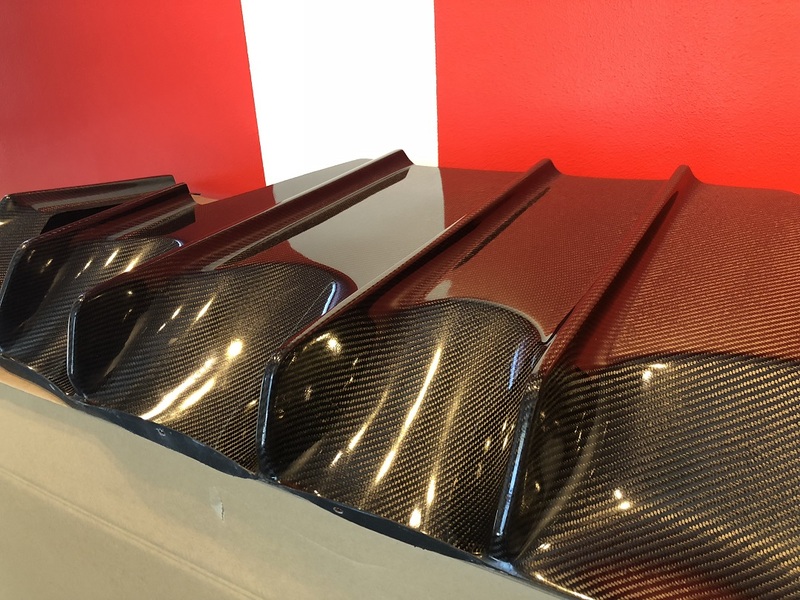 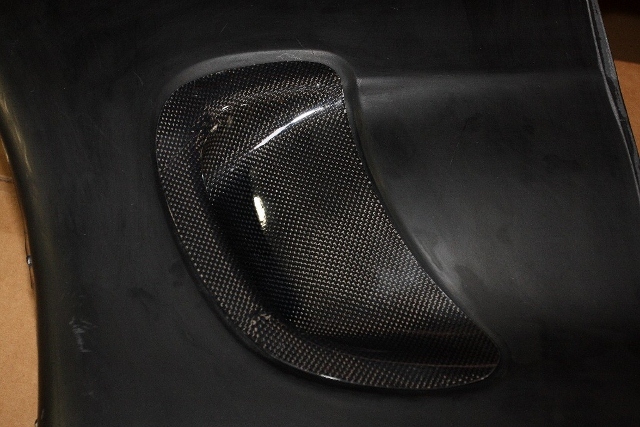 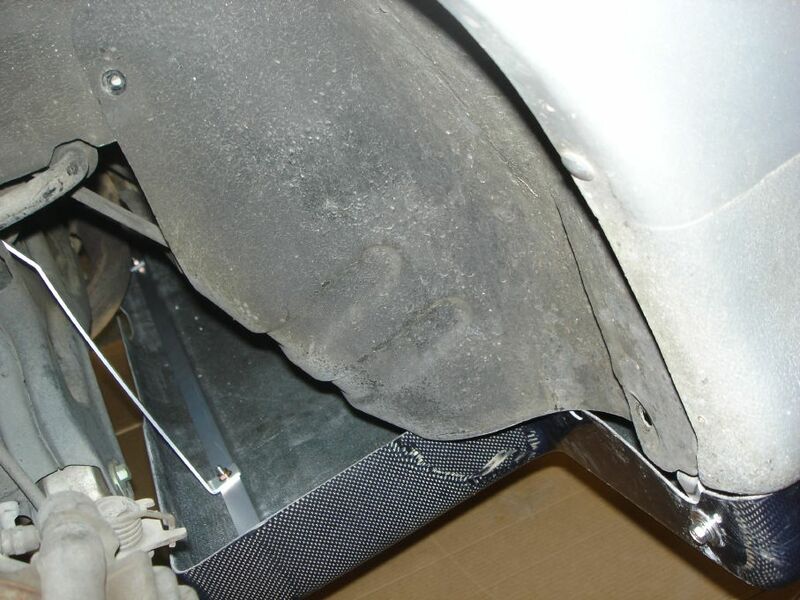 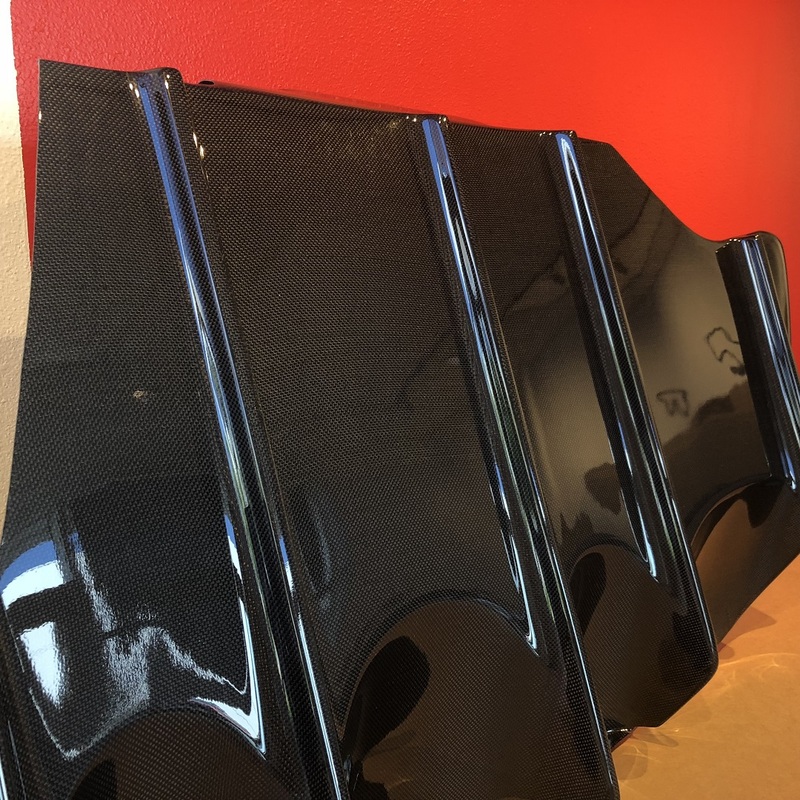 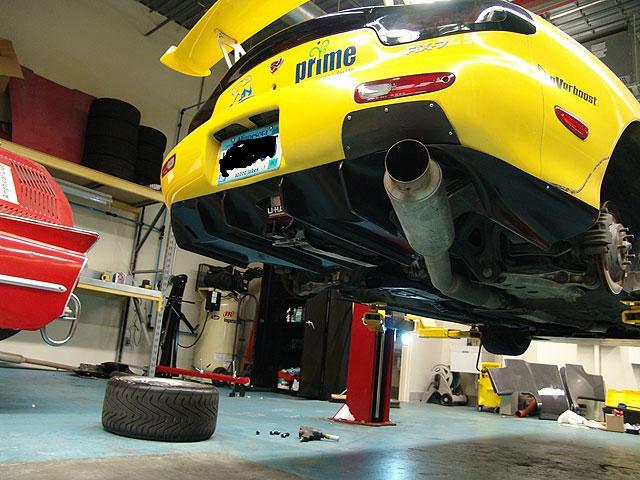 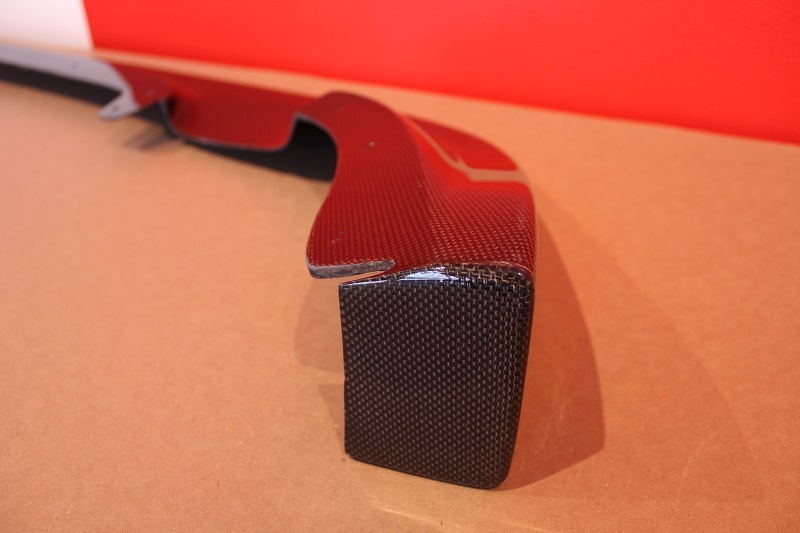 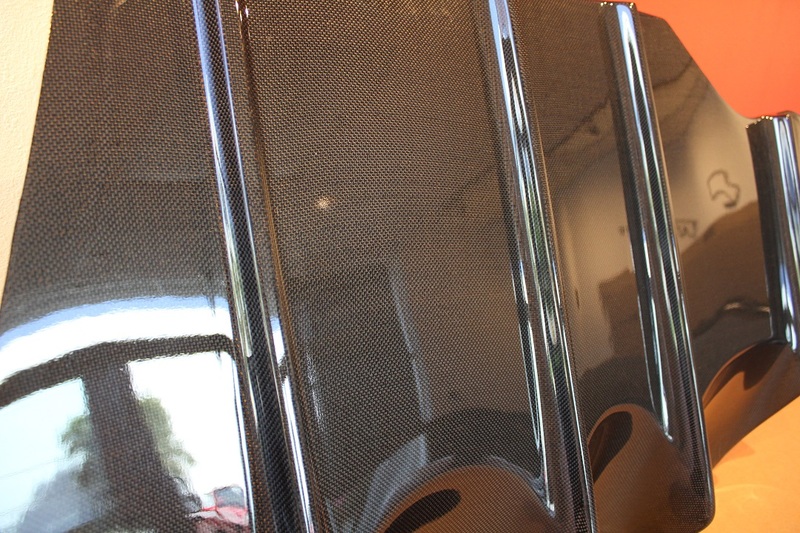 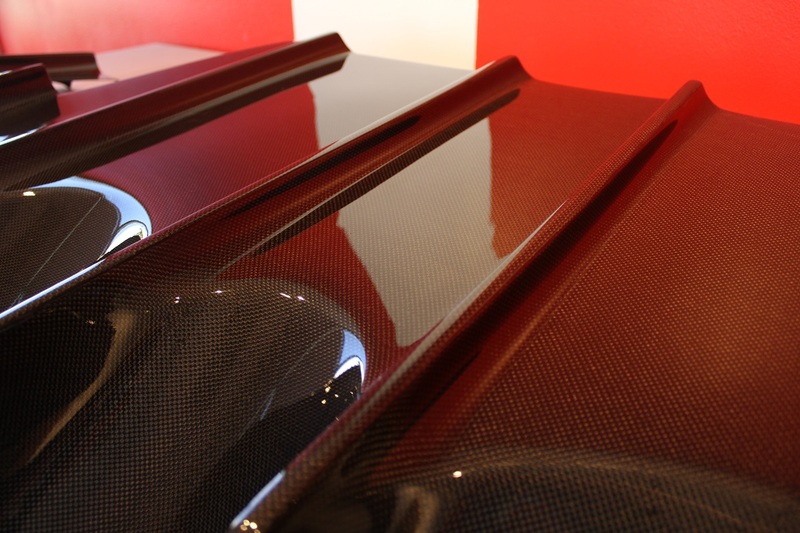 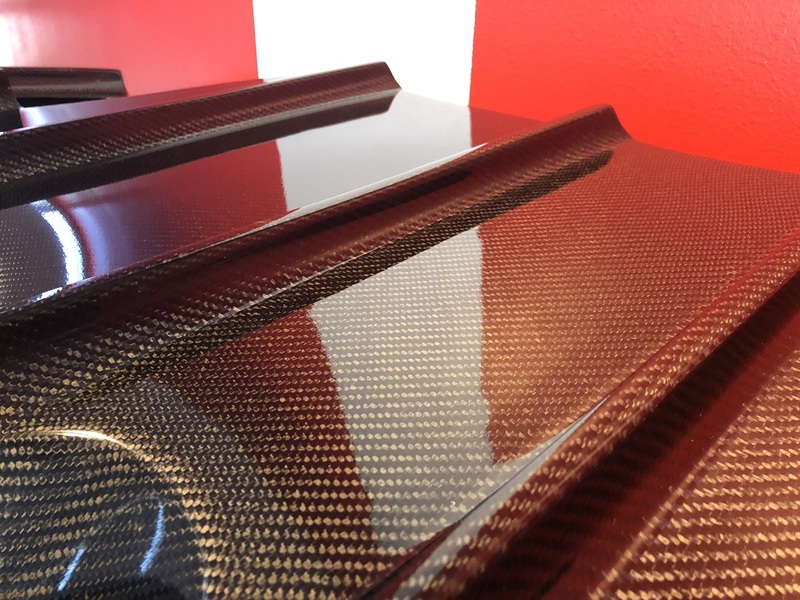 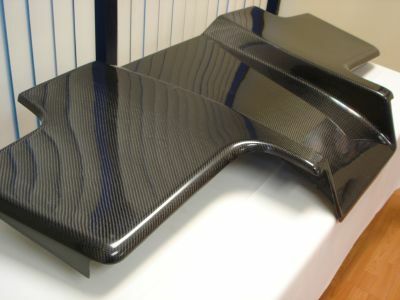 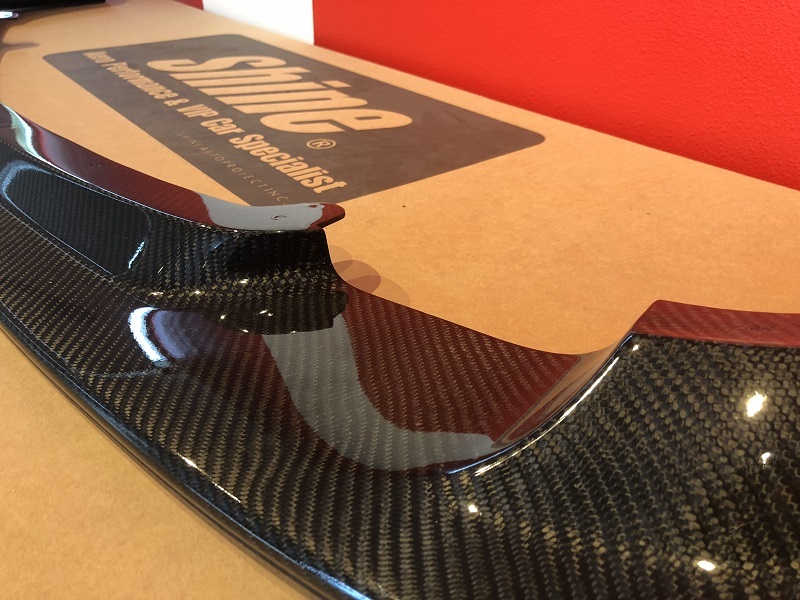 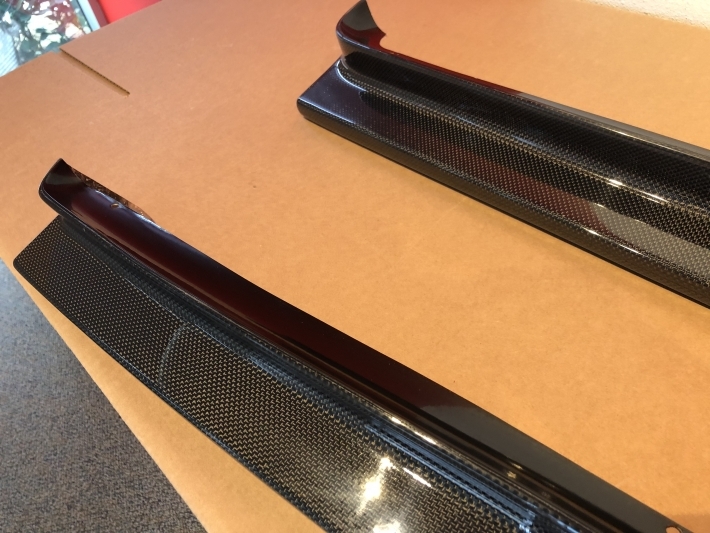 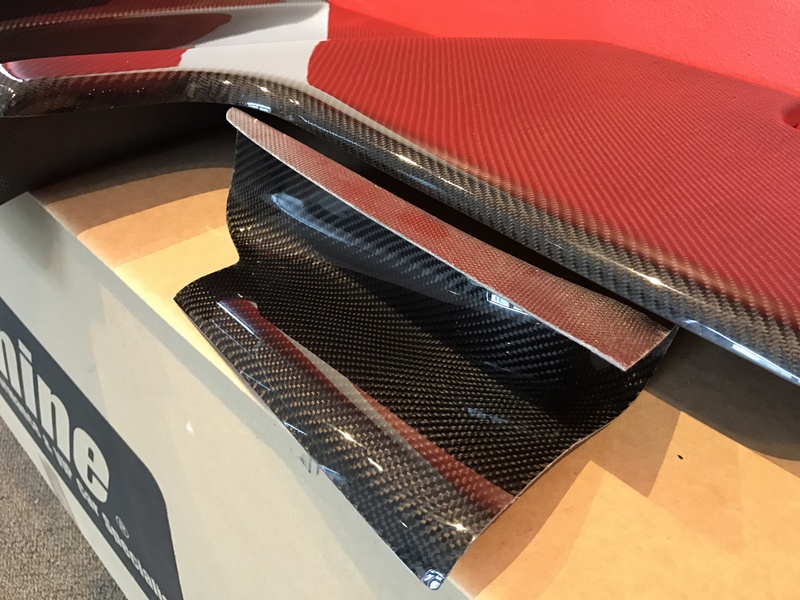 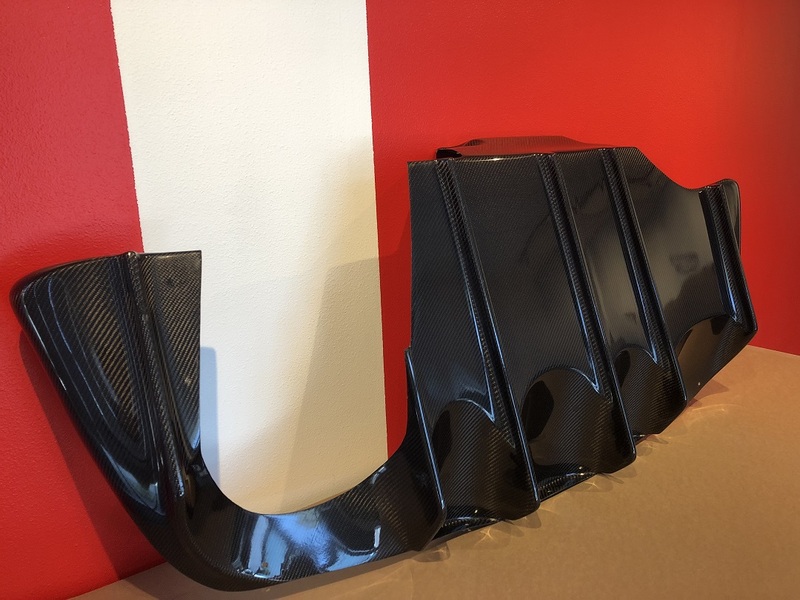 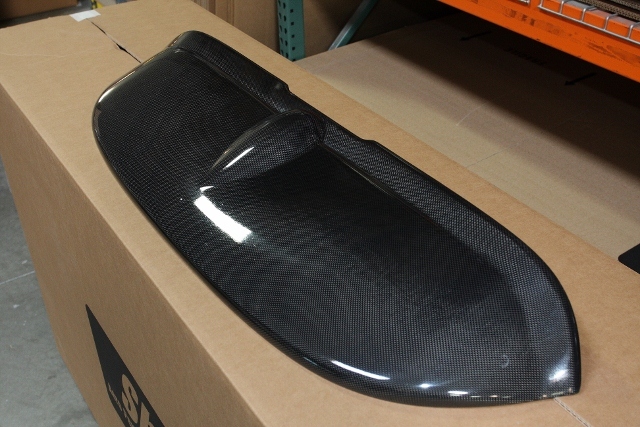 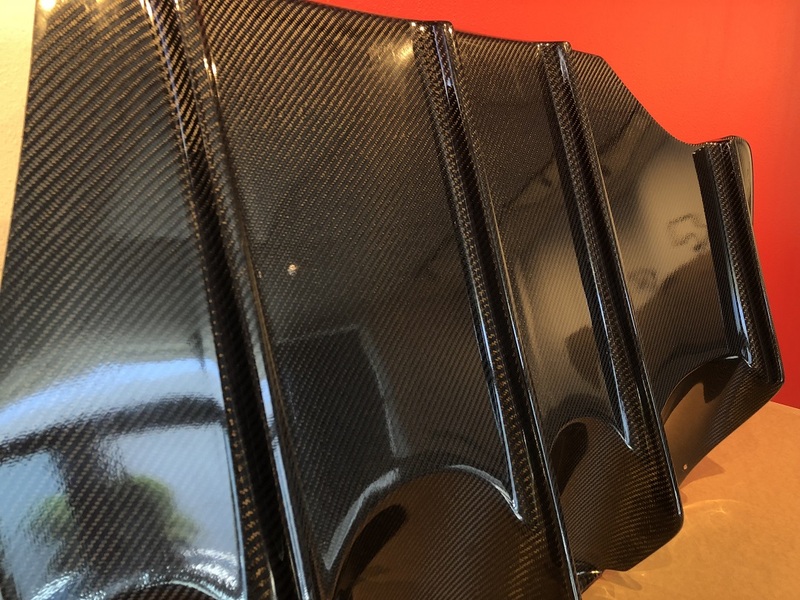 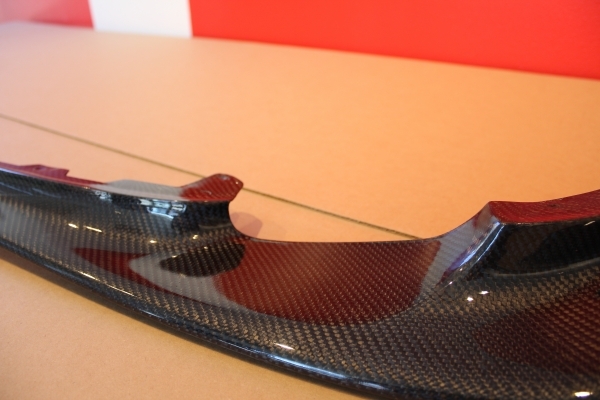 Carbon versions are reinforced (on the inside) with an additional layer of carbon fiber (total of 2 layers of carbon fiber) for high performance strength properties while also providing a more professional & higher-end appeal (inside/backside of diffuser can be seen looking down onto the diffuser when installed). 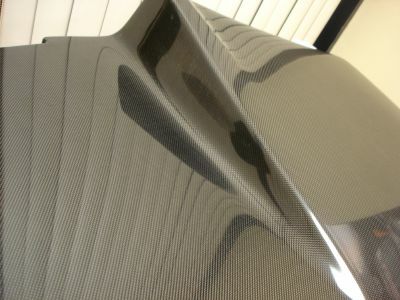 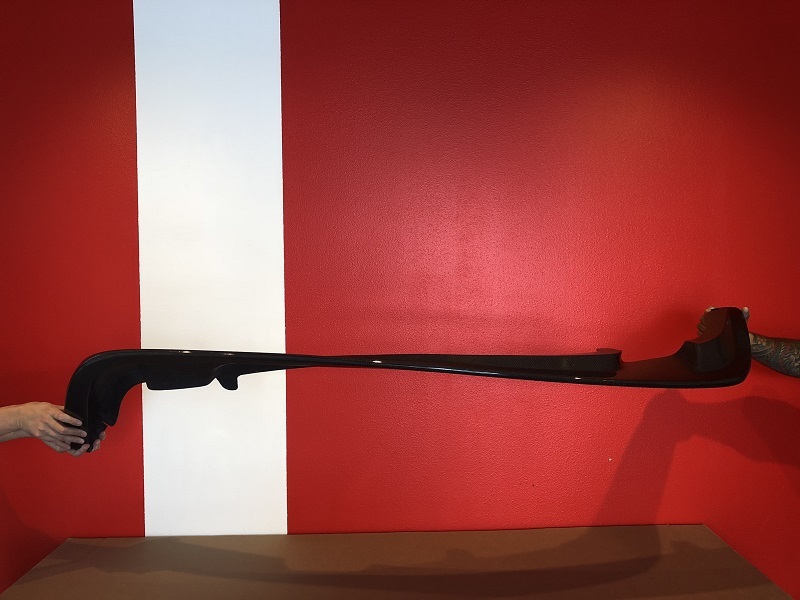 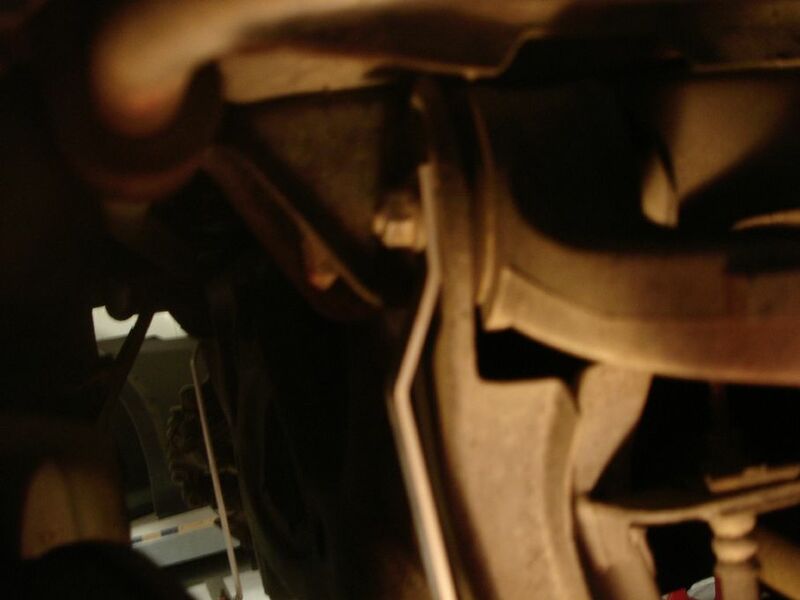 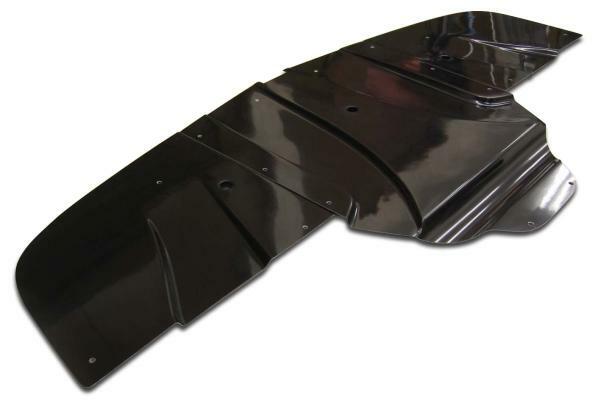 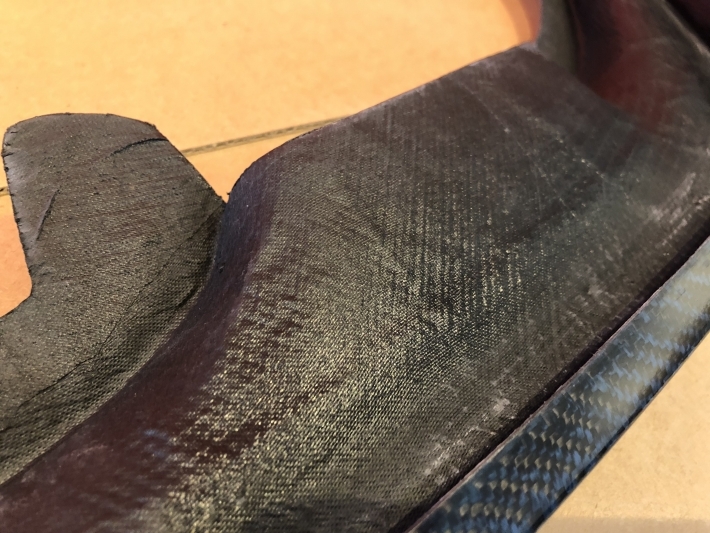 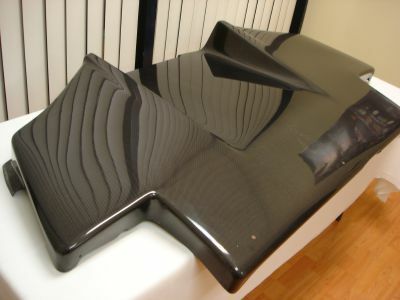 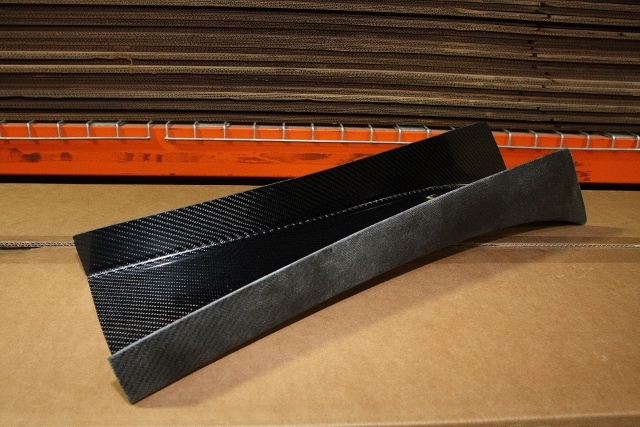 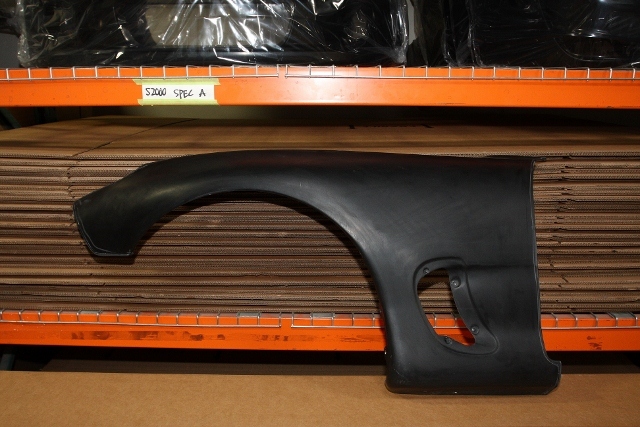 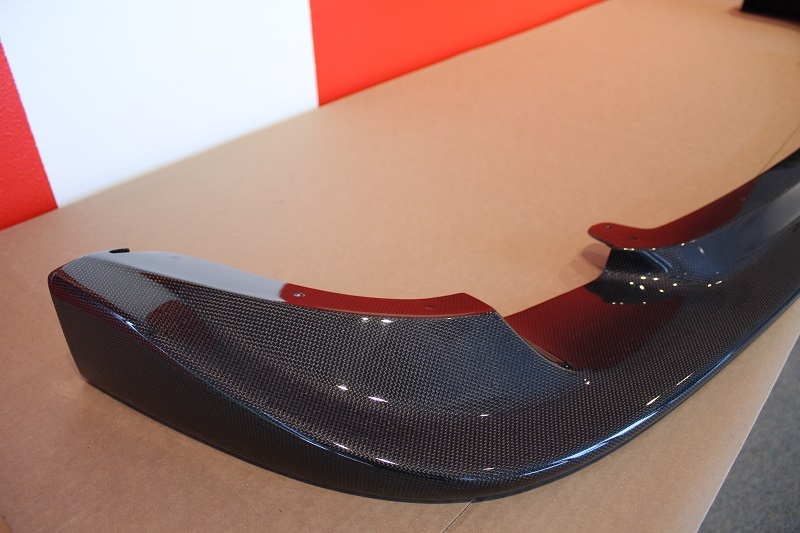 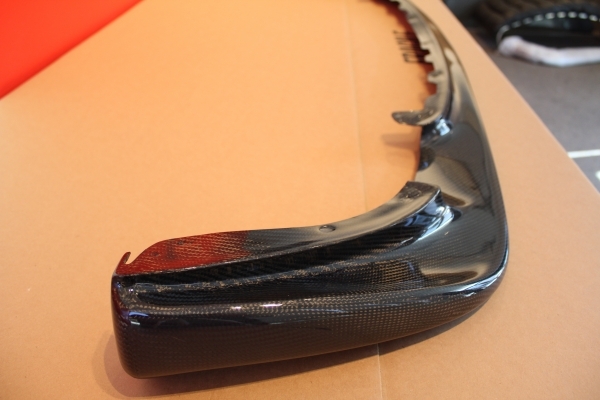 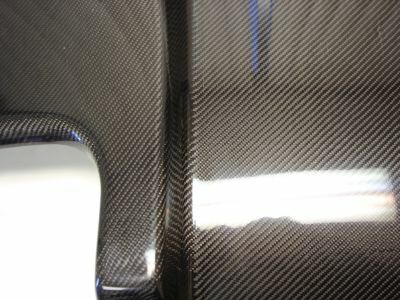 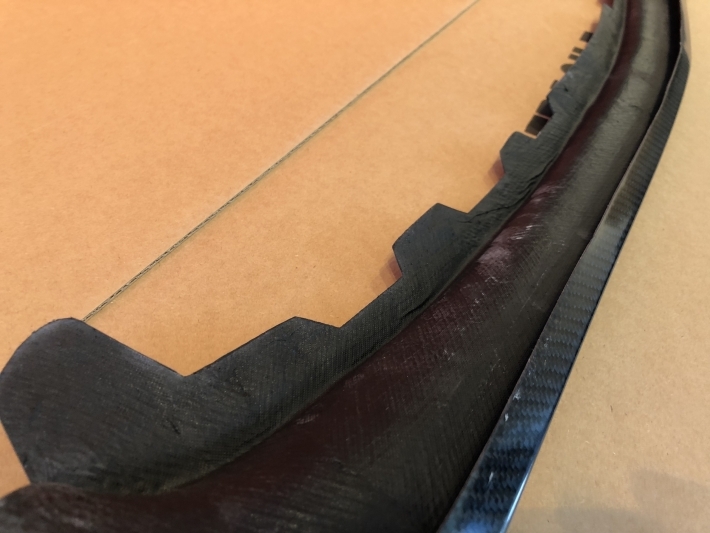 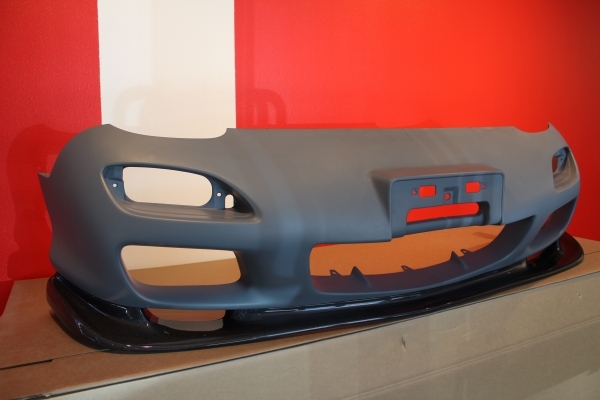 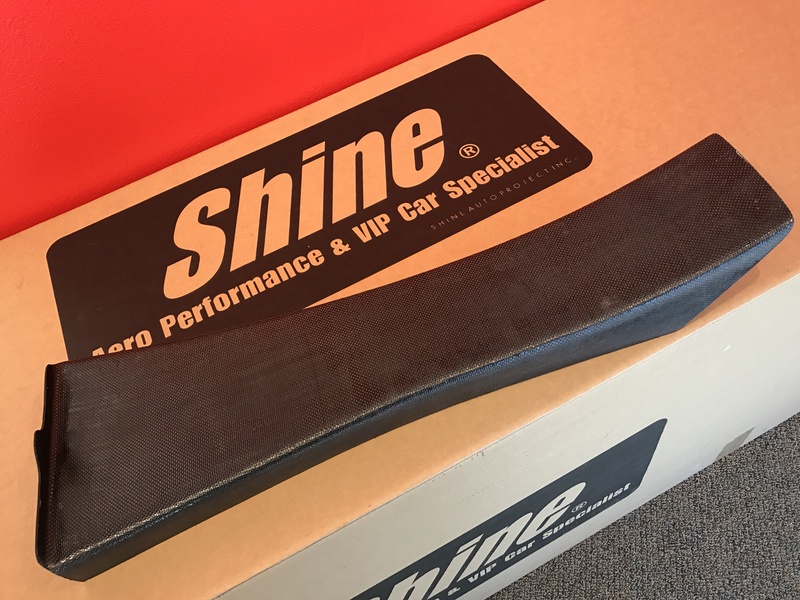 The added layer of carbon maintains a black finish unlike parts reinforced with fiberglass mat or fiberglass cloth, which tend to have a scuffy white finish, which can be seen from afar. 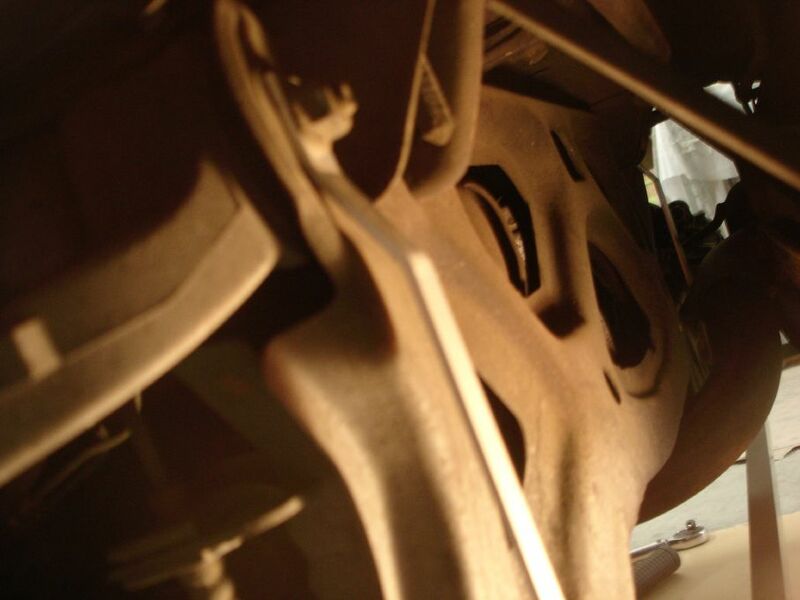 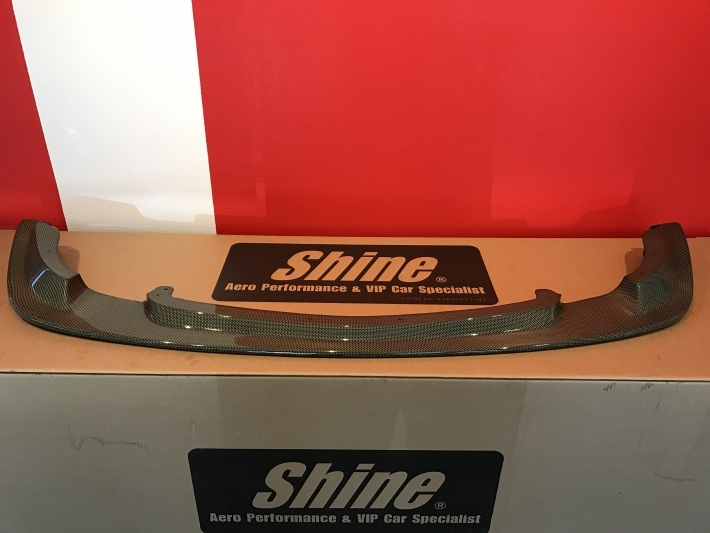 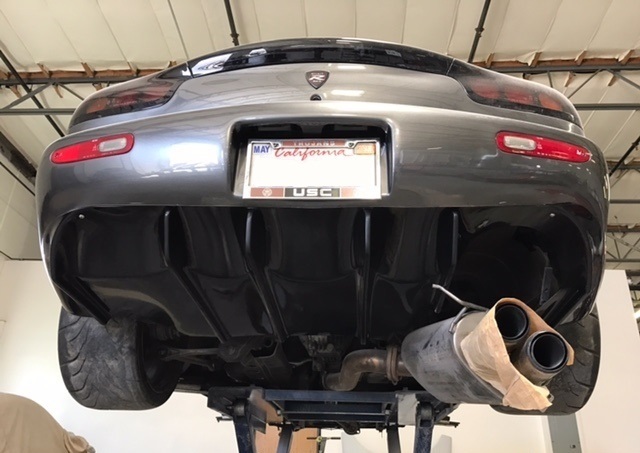 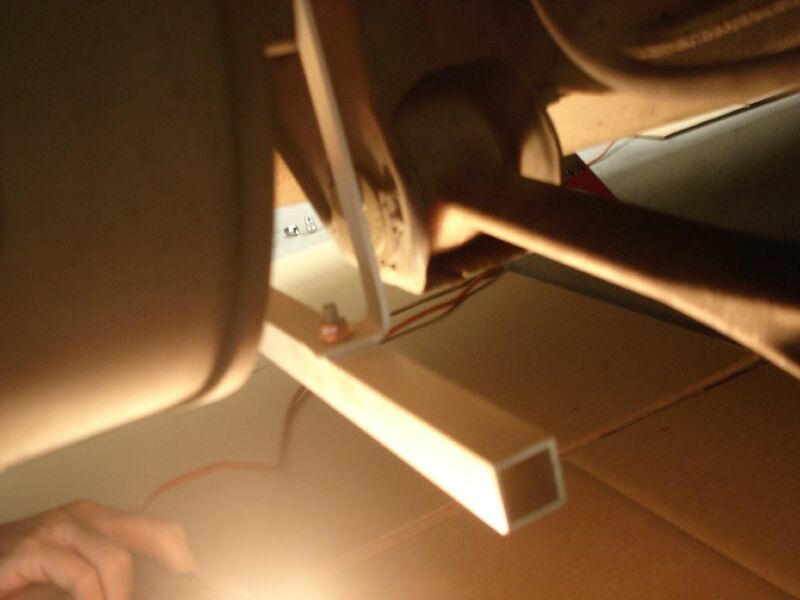 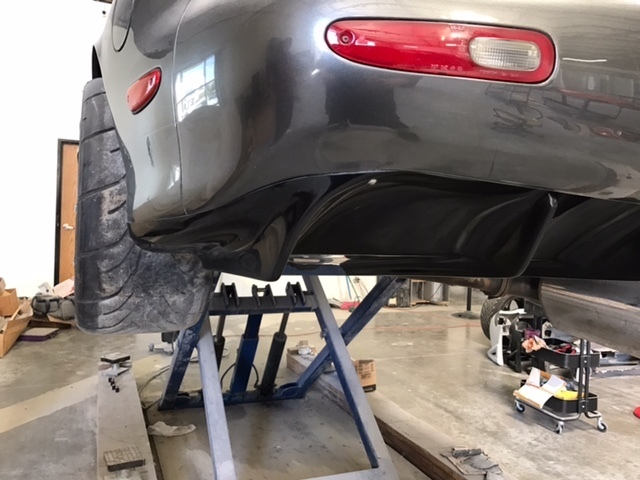 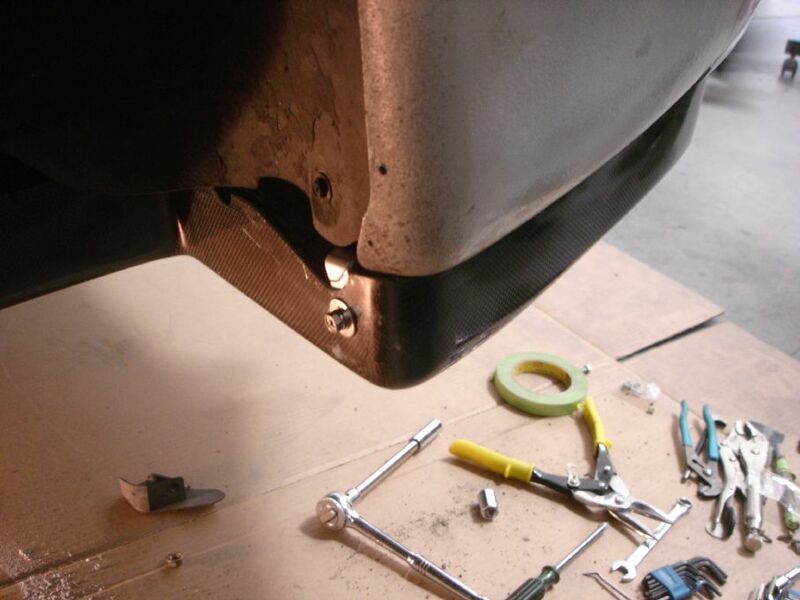 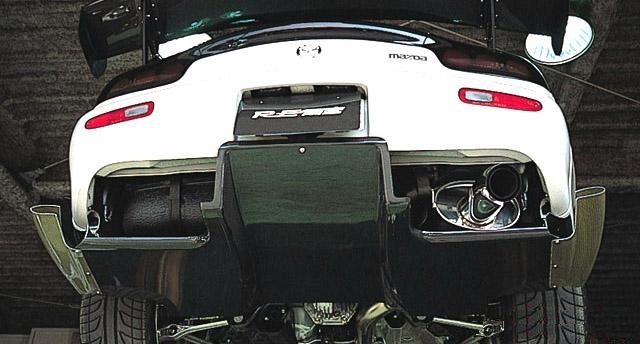 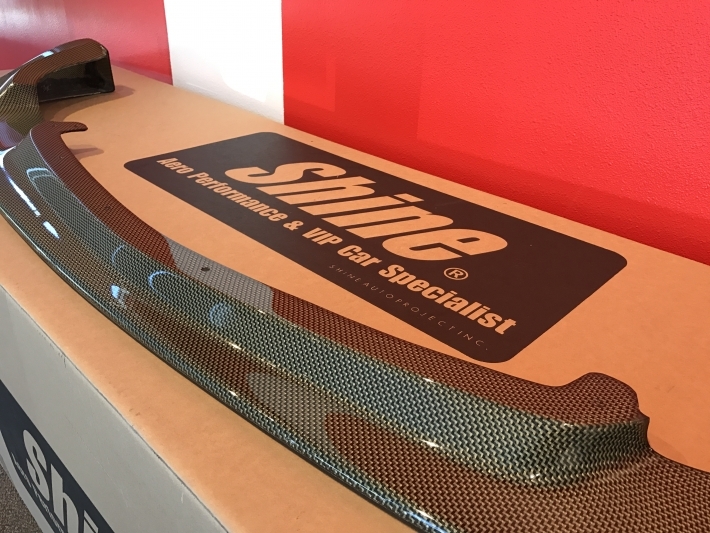 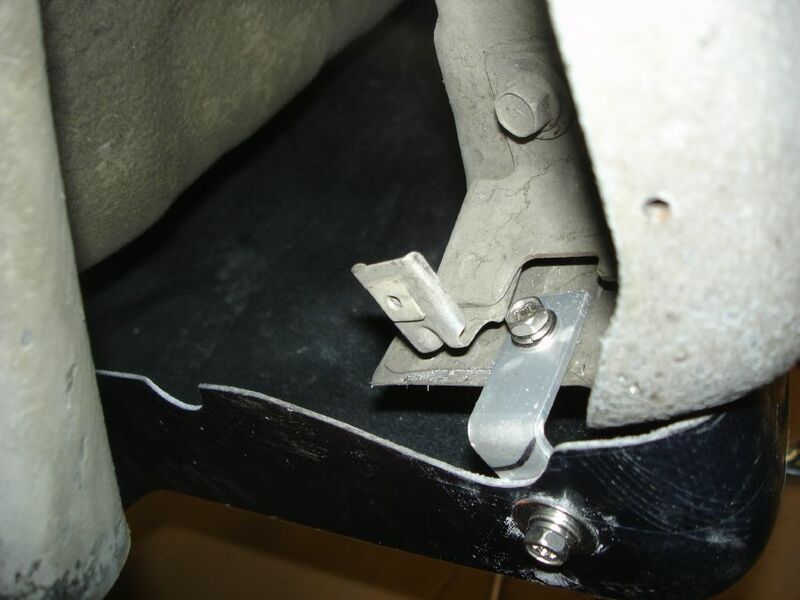 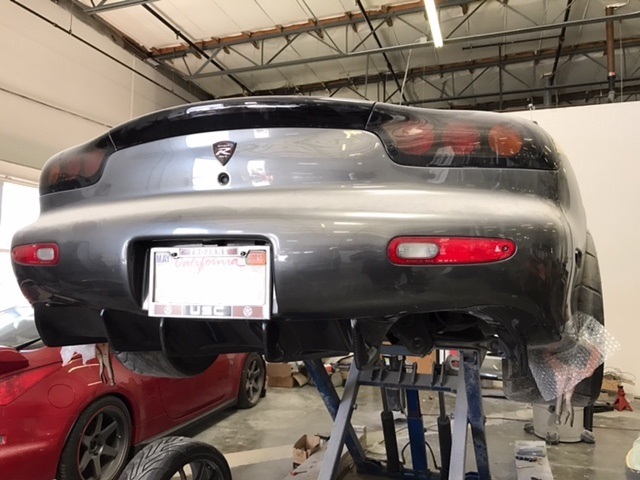 * Main rear diffuser, left & right side attachment pieces (composite brackets which mount to the lower rear), steel mounting brackets, and stainless steel nuts, washers & bolts. 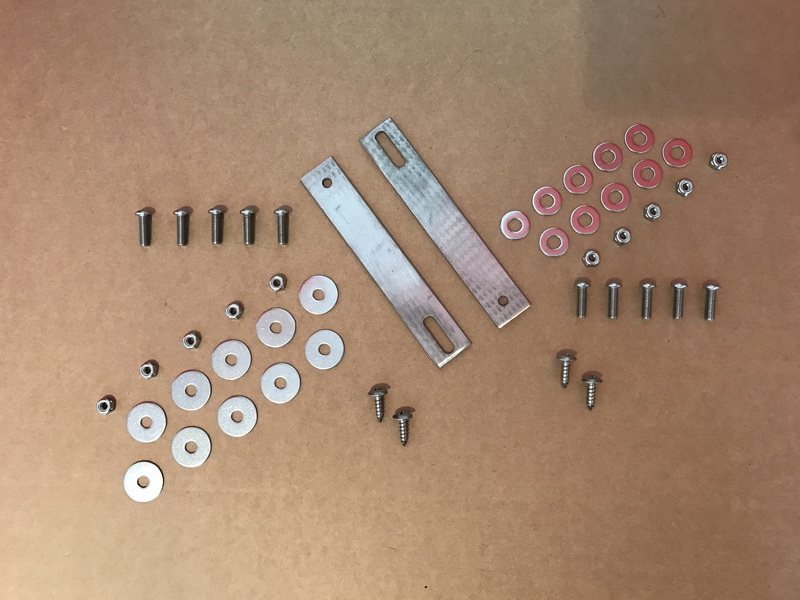 *Comes with custom made steel hardware for proper installation. 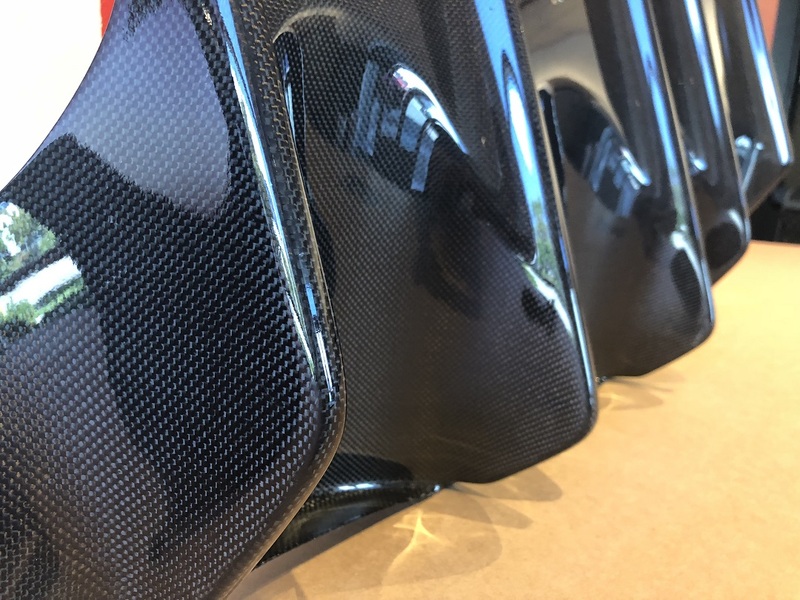 Carbon and Carbon-Kevlar versions are reinforced with an extra layer of carbon fiber for superior strength along with a cleaner looking backside finish. 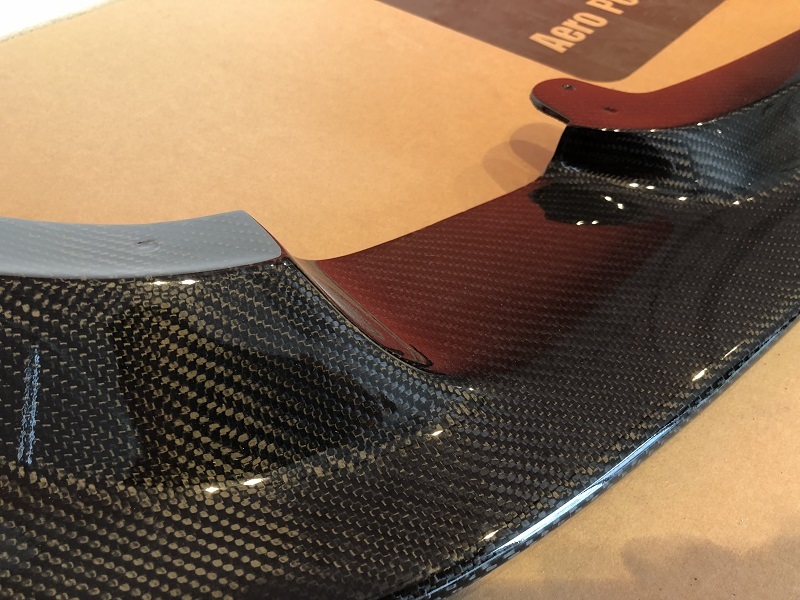 The extra carbon fiber backside reinforcement maintains a black finish unlike parts reinforced with fiberglass mat or fiberglass cloth, which tend to have a scuffy white finish. 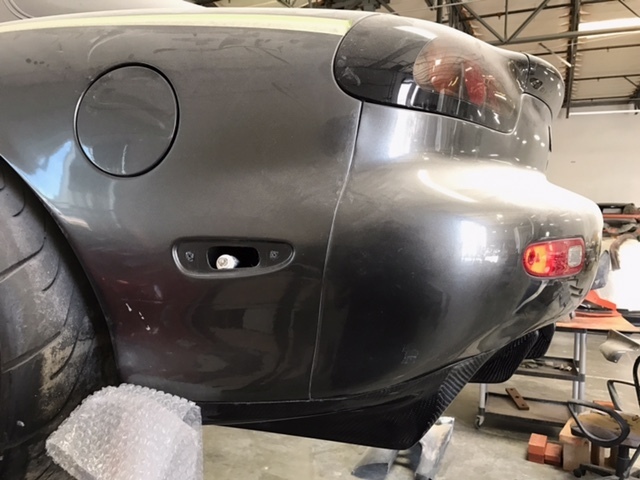 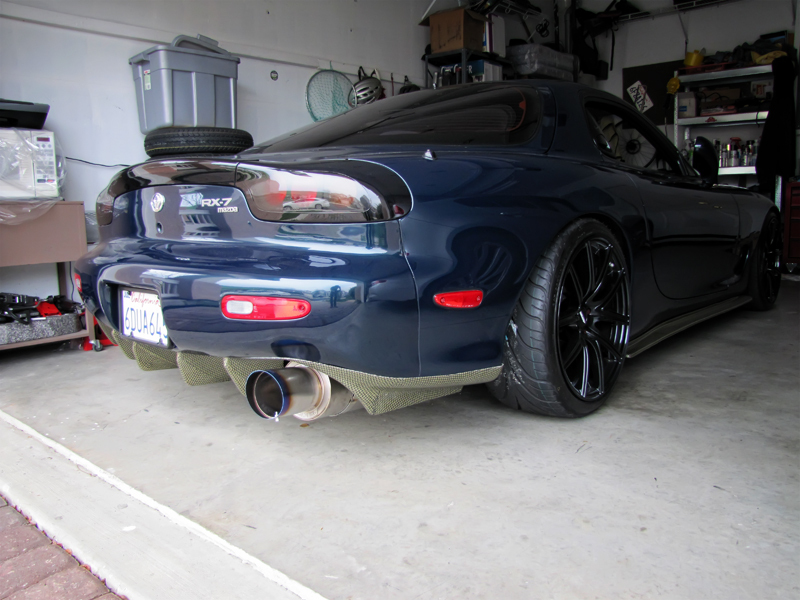 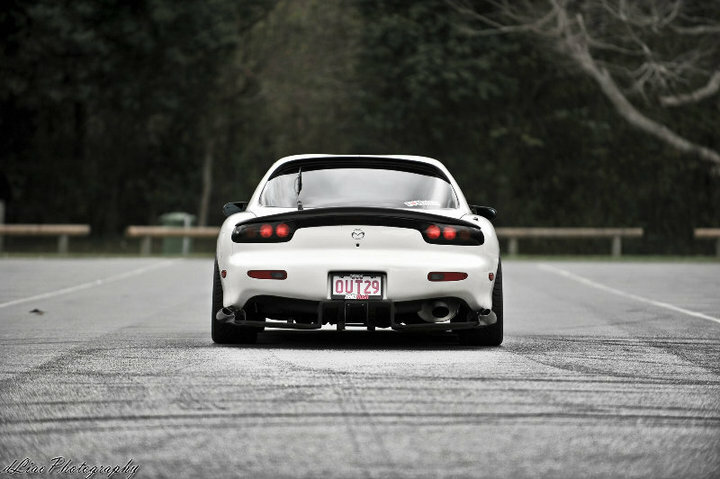 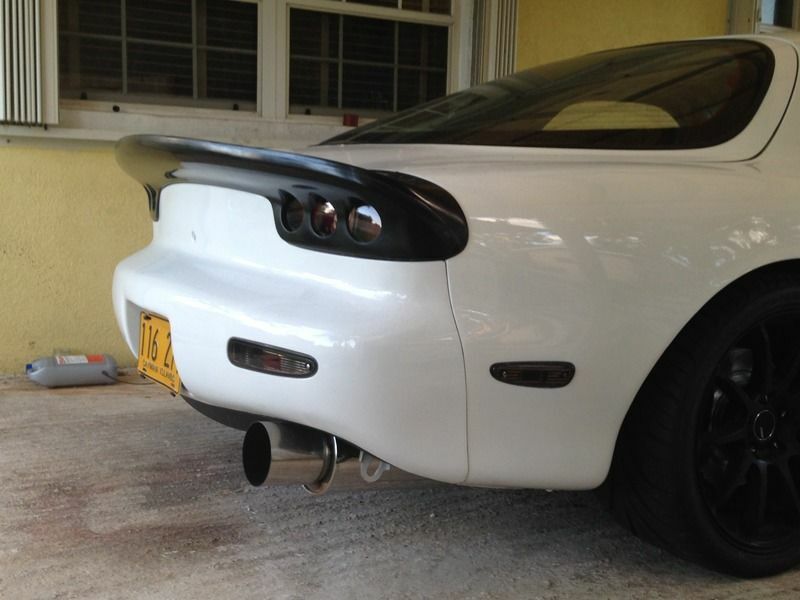 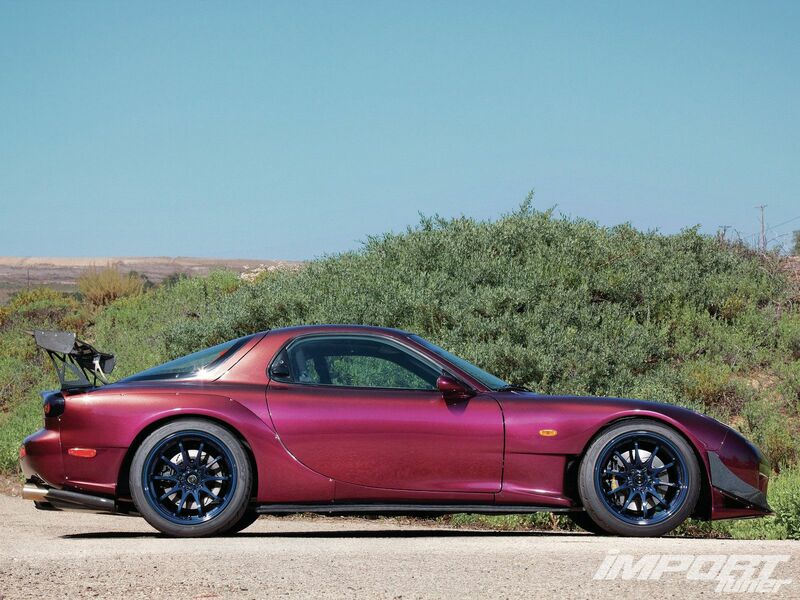 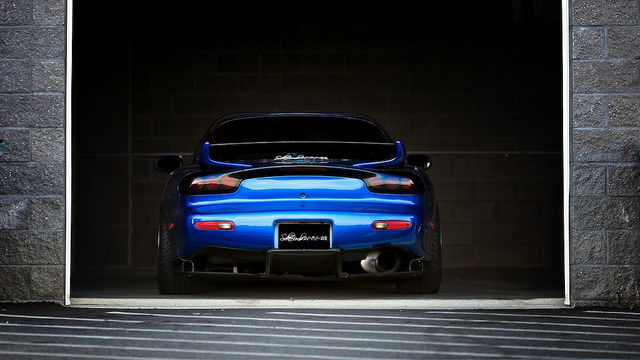 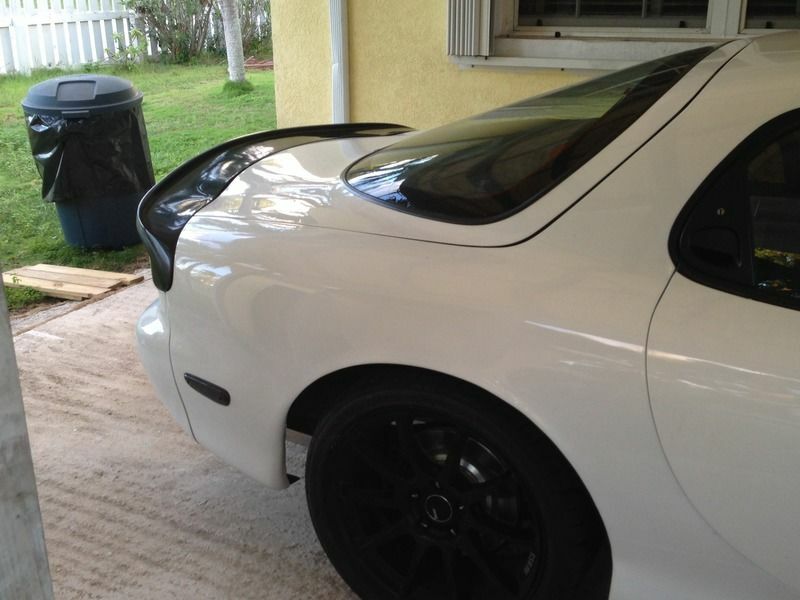 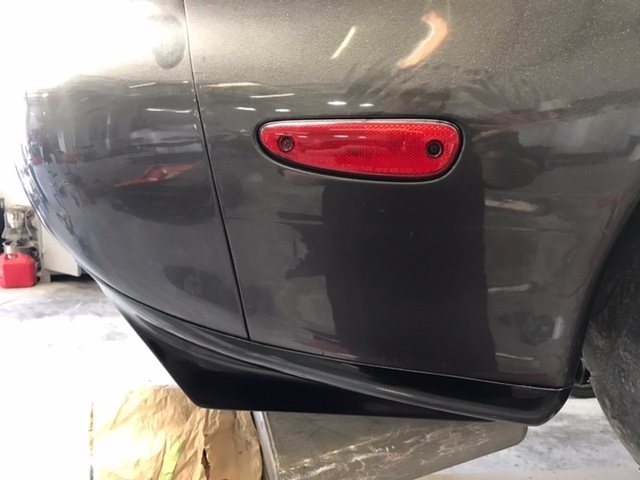 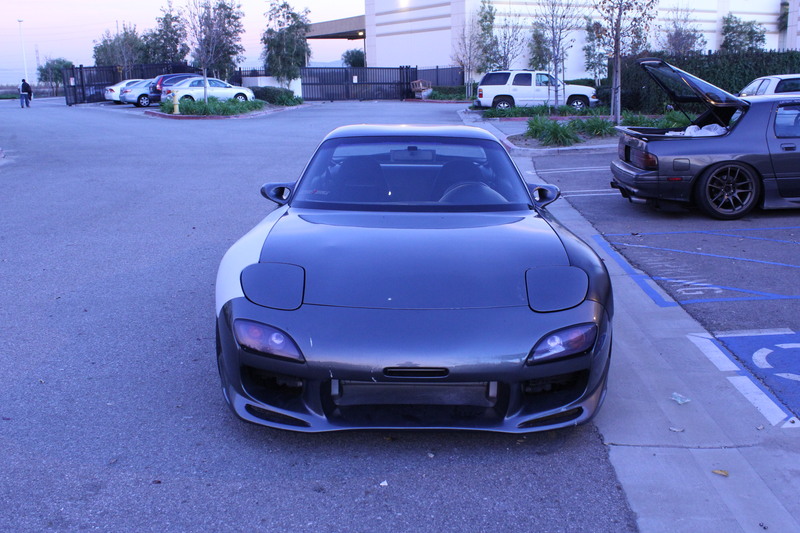 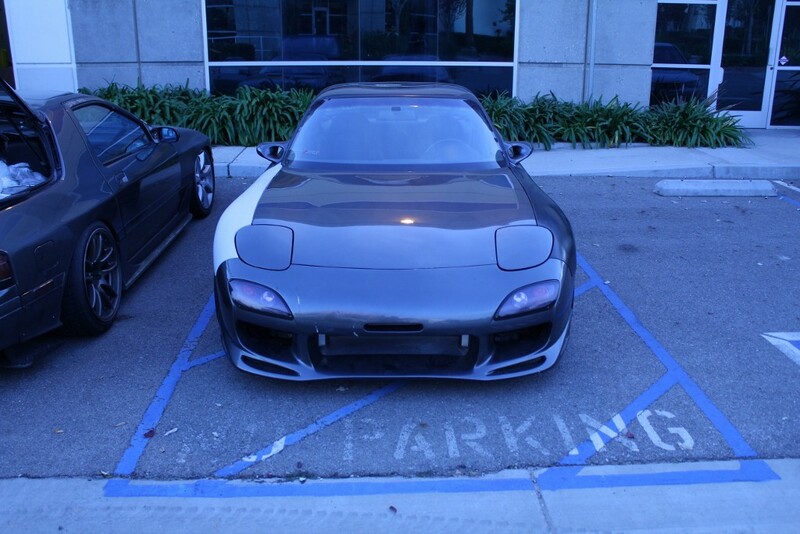 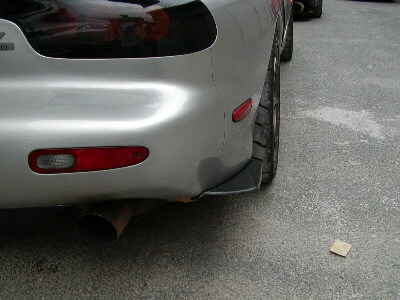 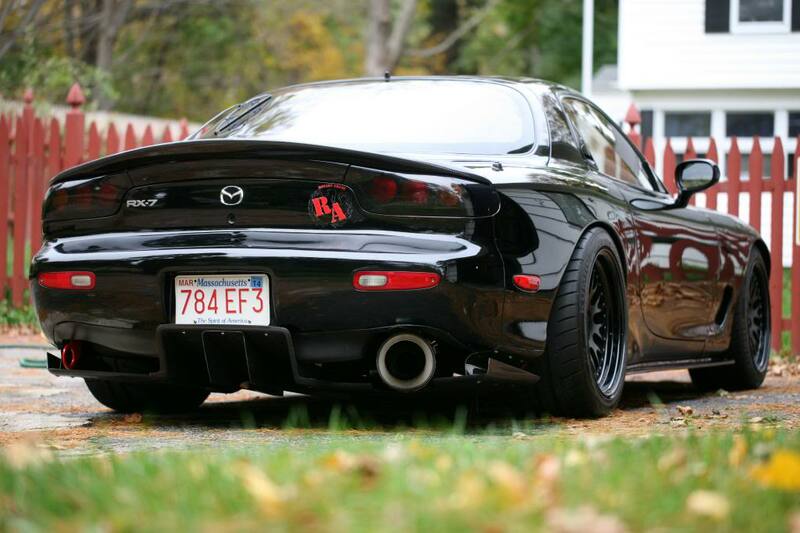 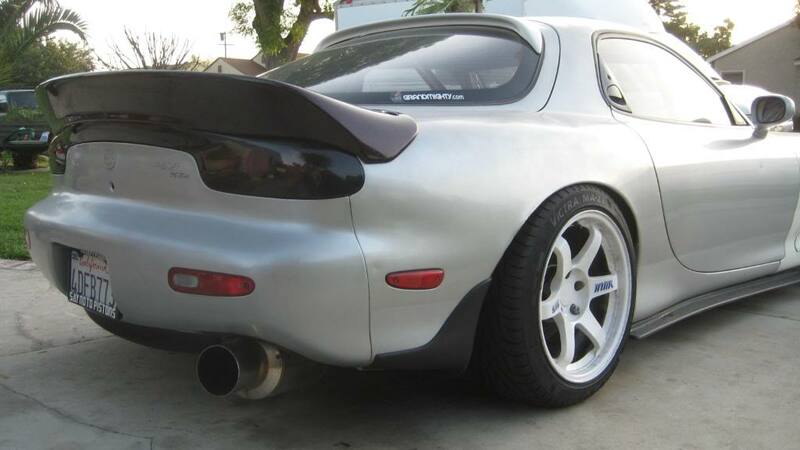 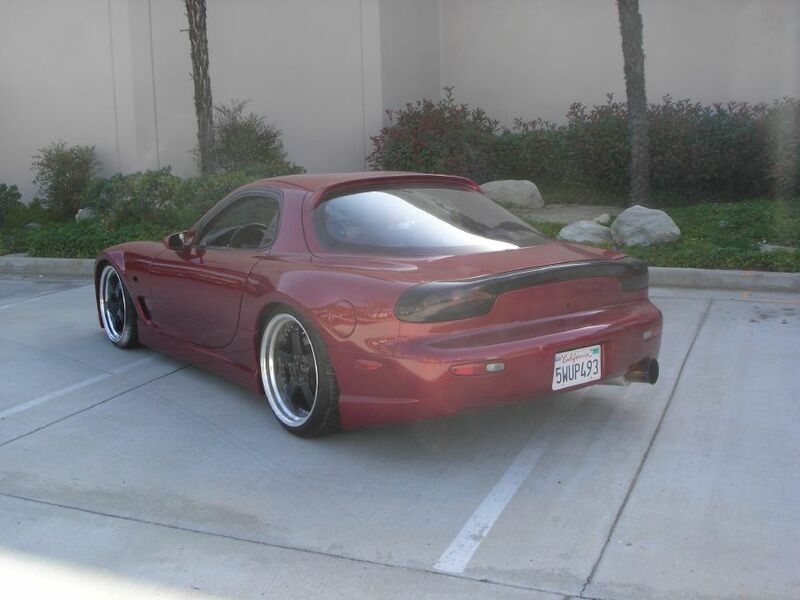 FD3S RX-7 Type-ES Rear Taillight Spoiler/Cover. 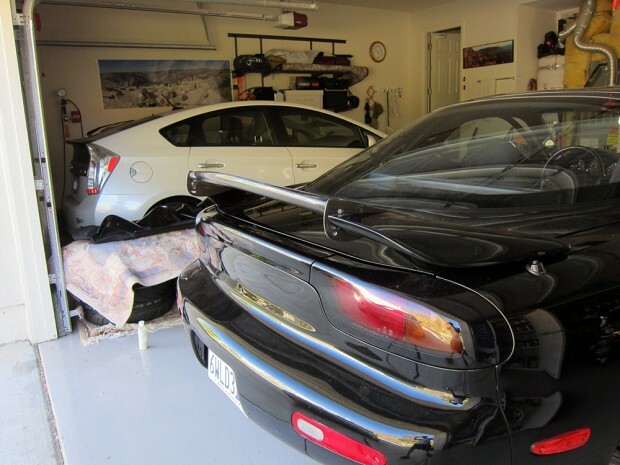 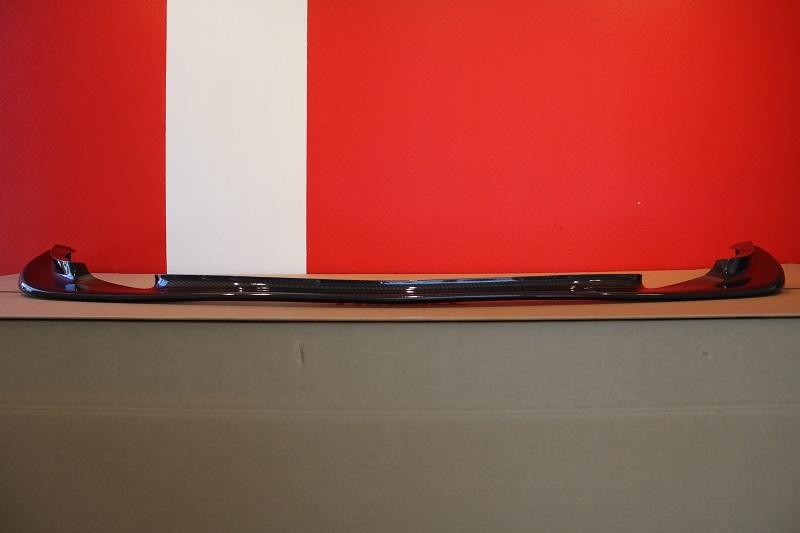 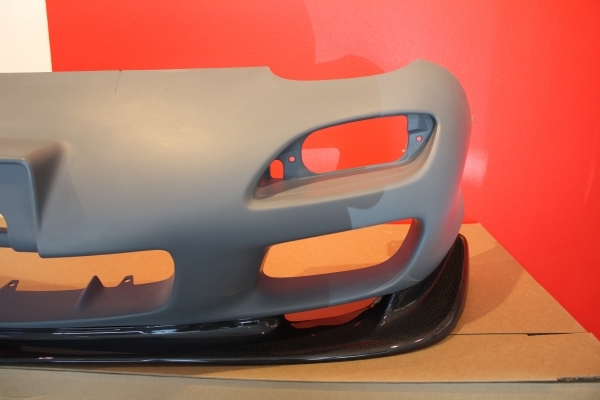 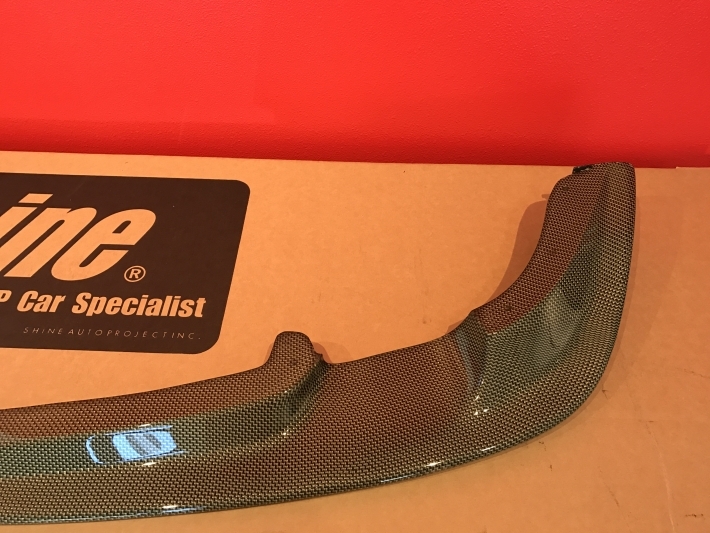 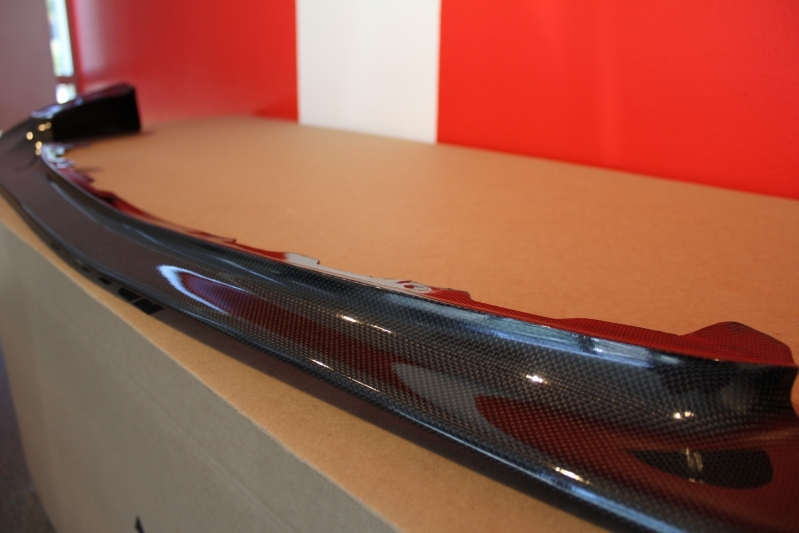 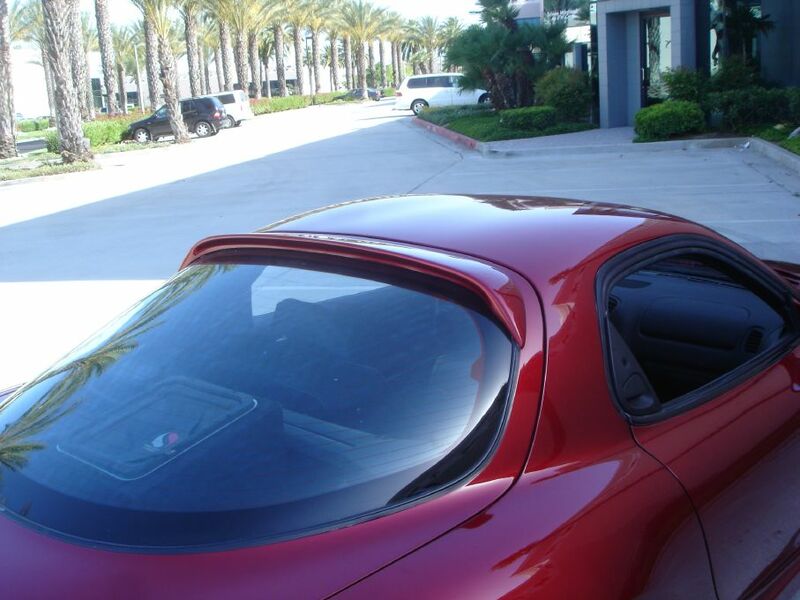 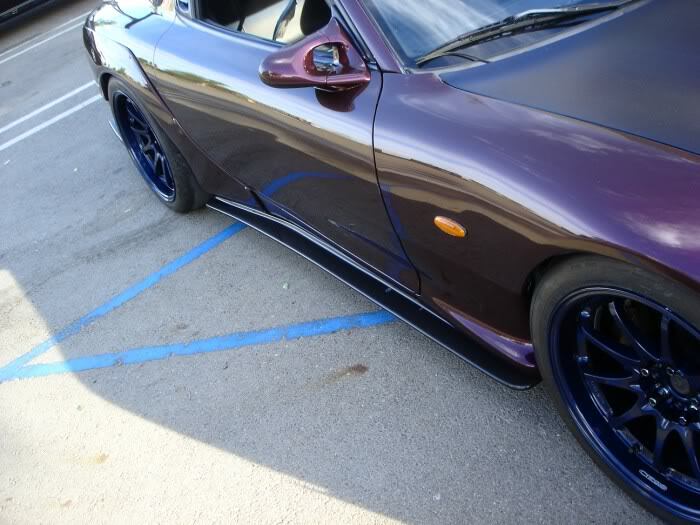 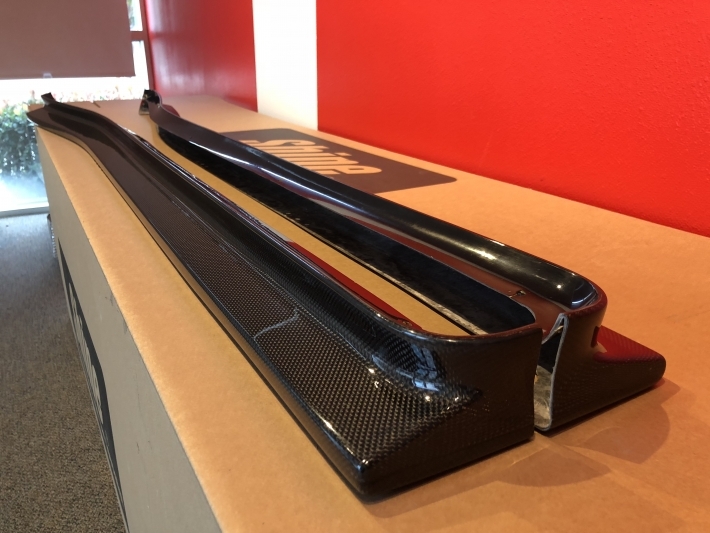 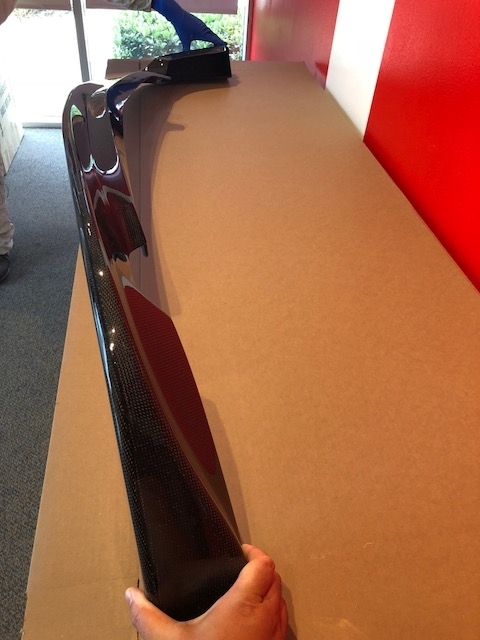 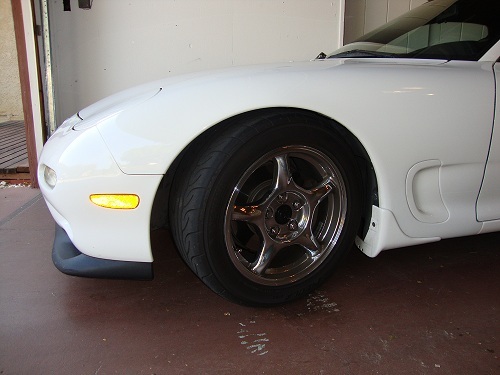 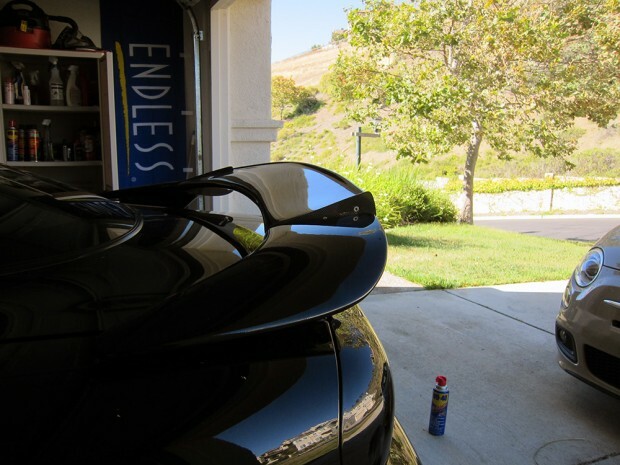 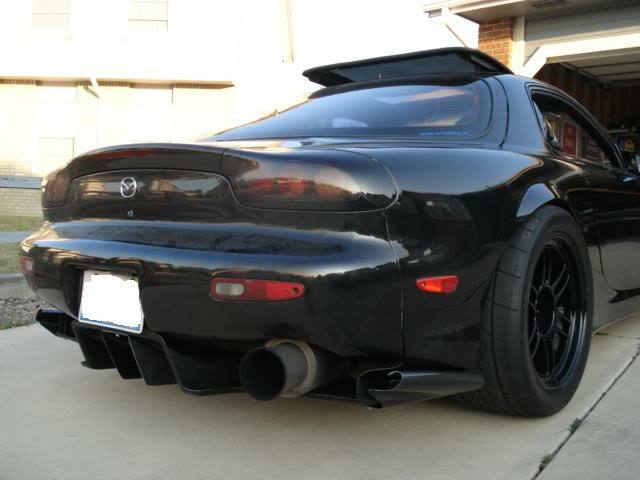 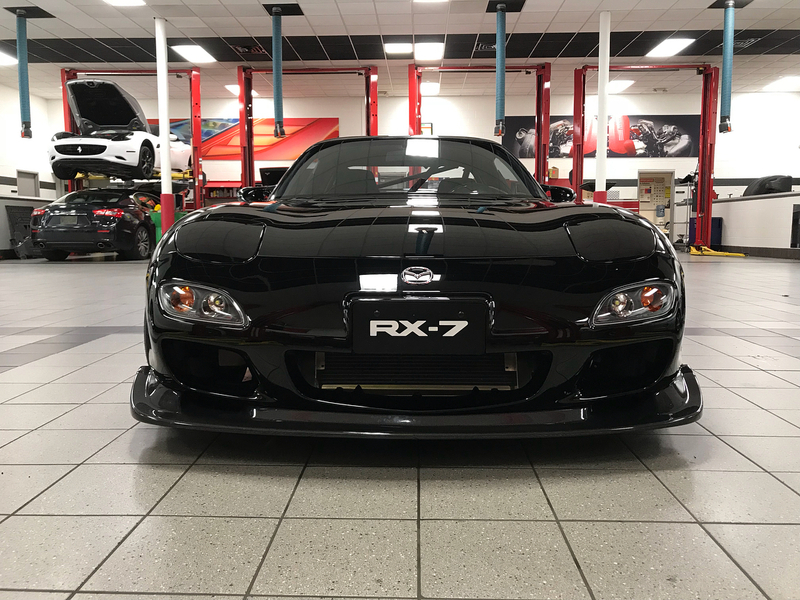 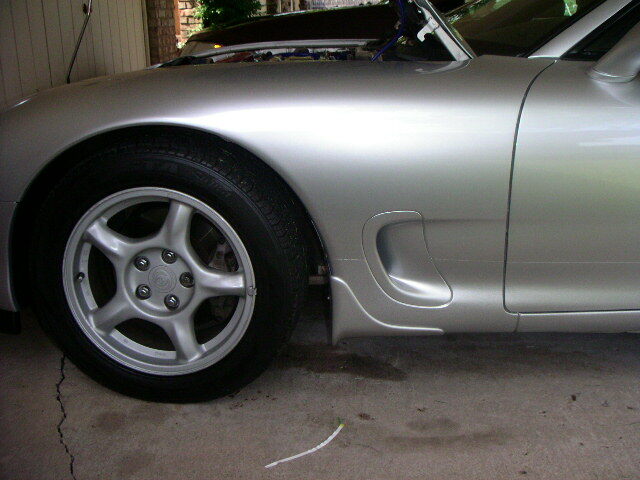 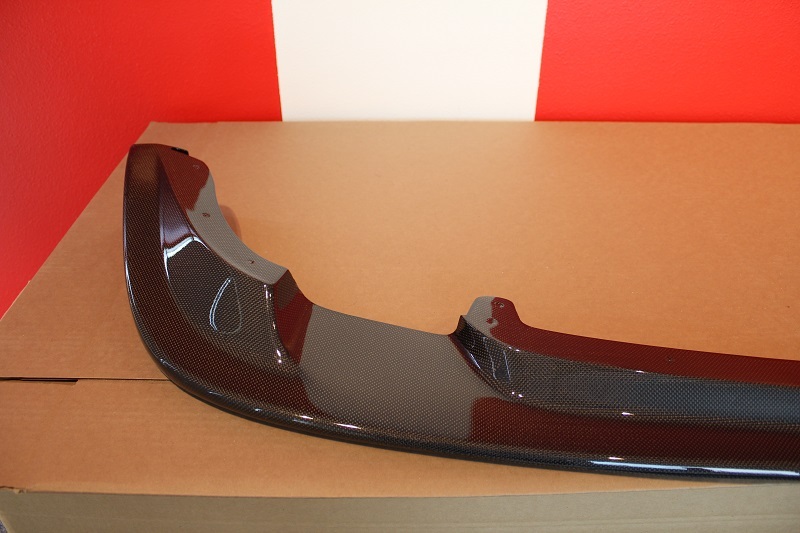 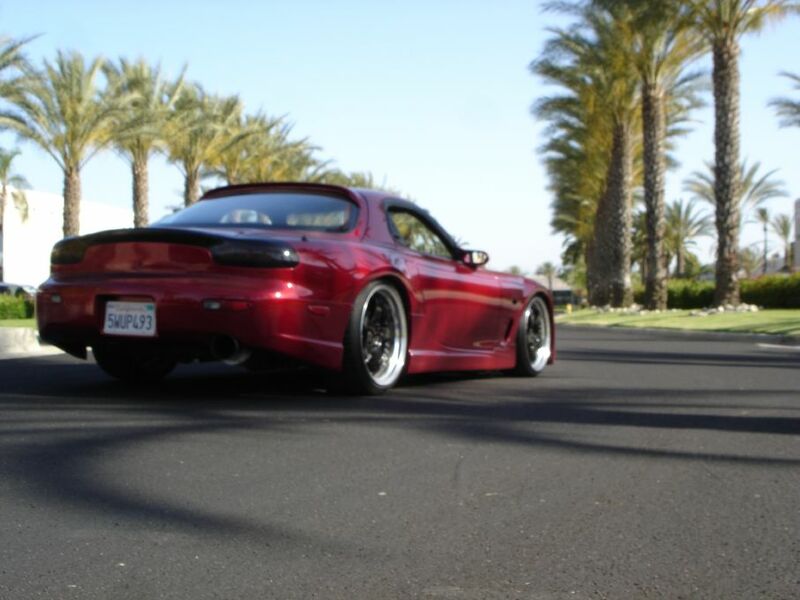 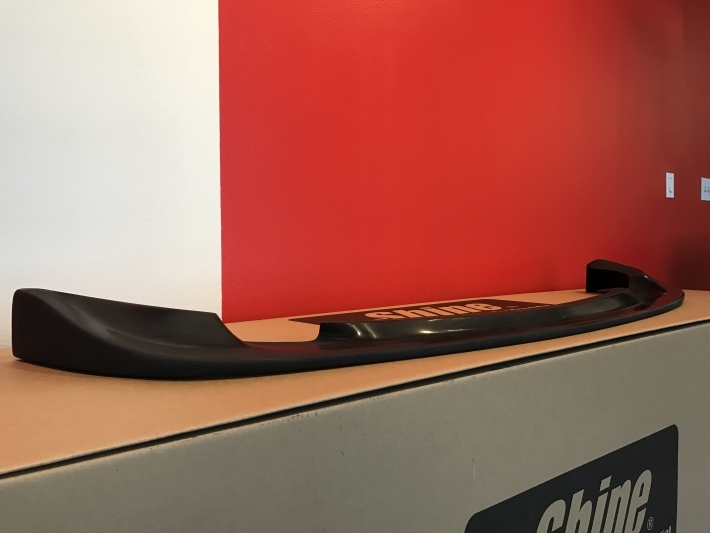 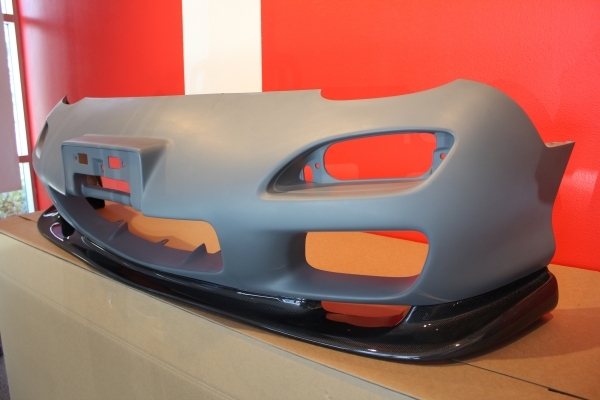 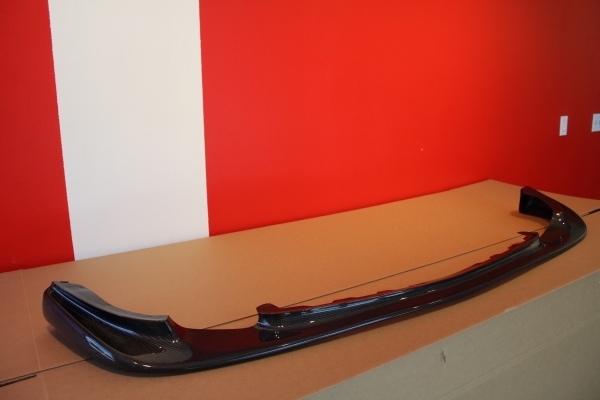 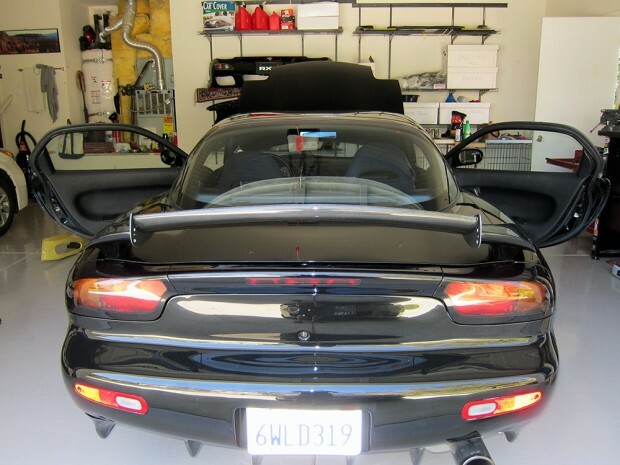 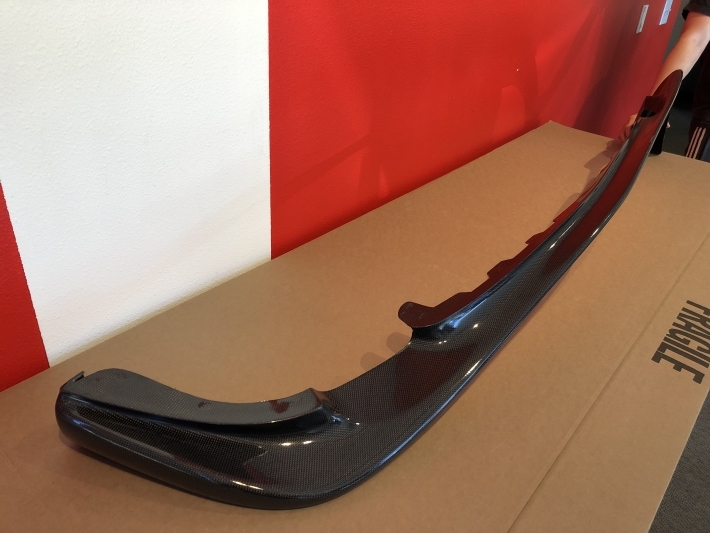 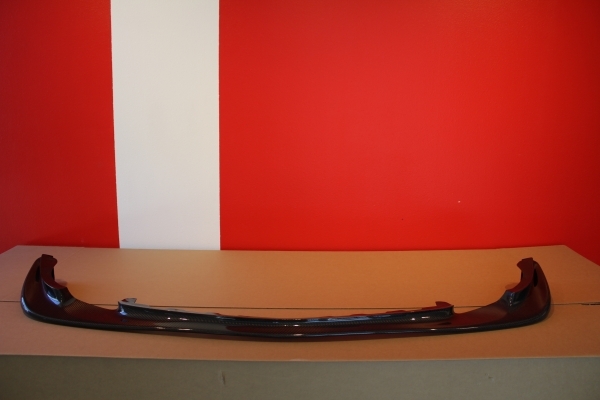 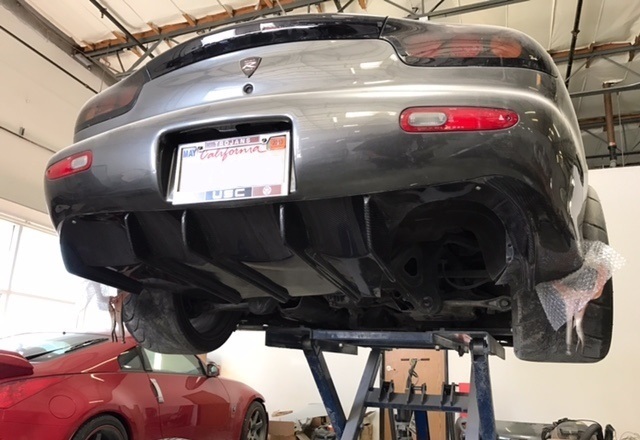 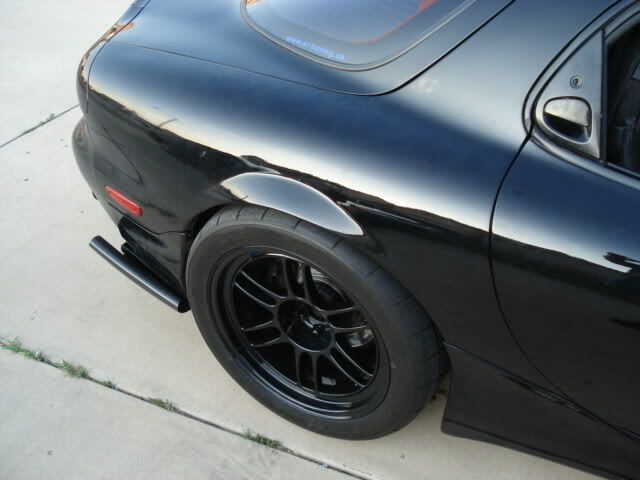 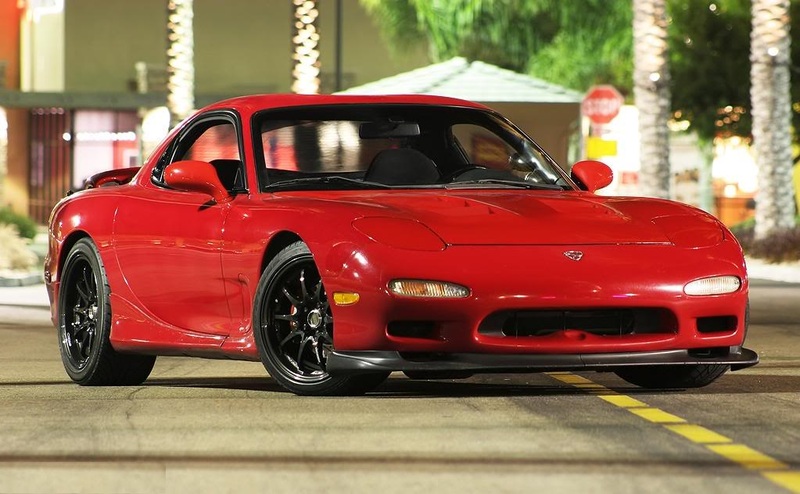 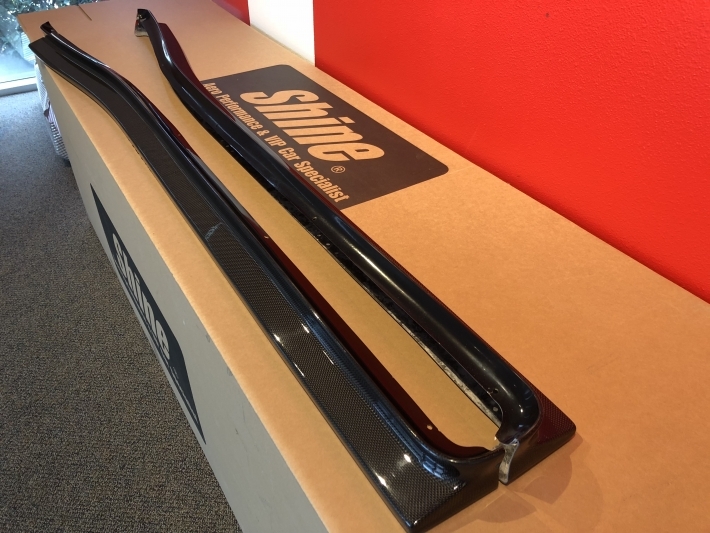 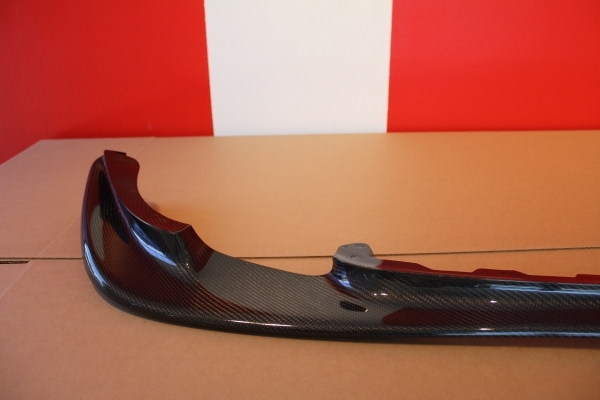 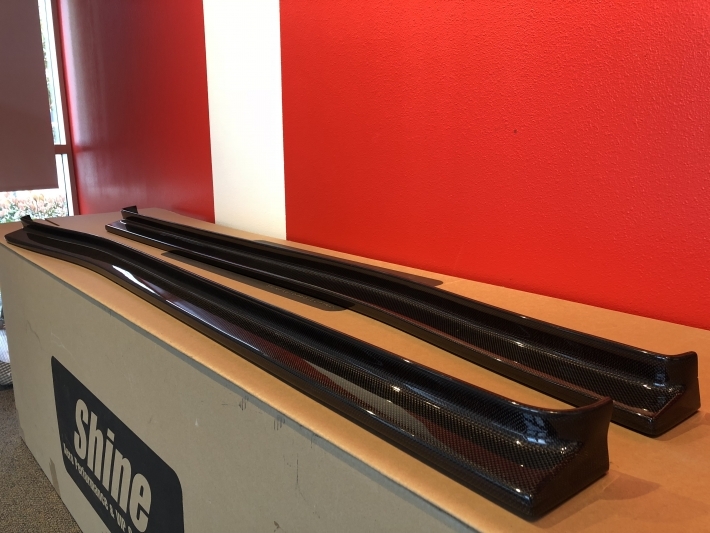 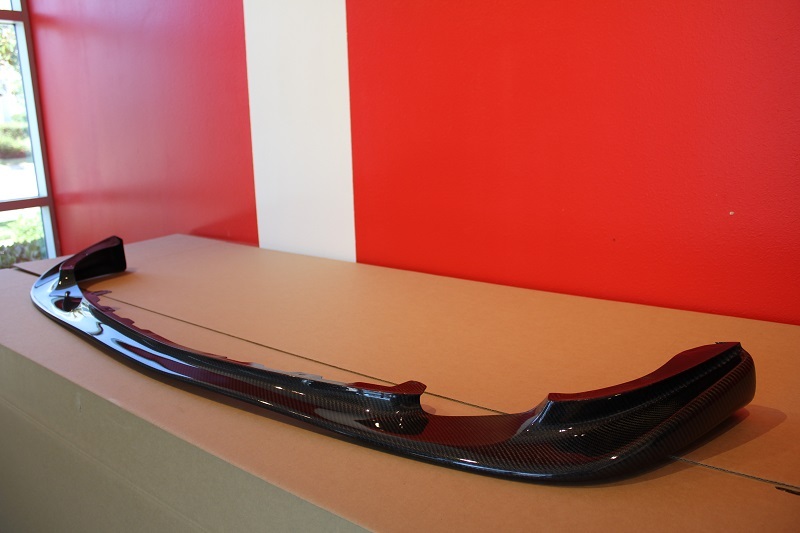 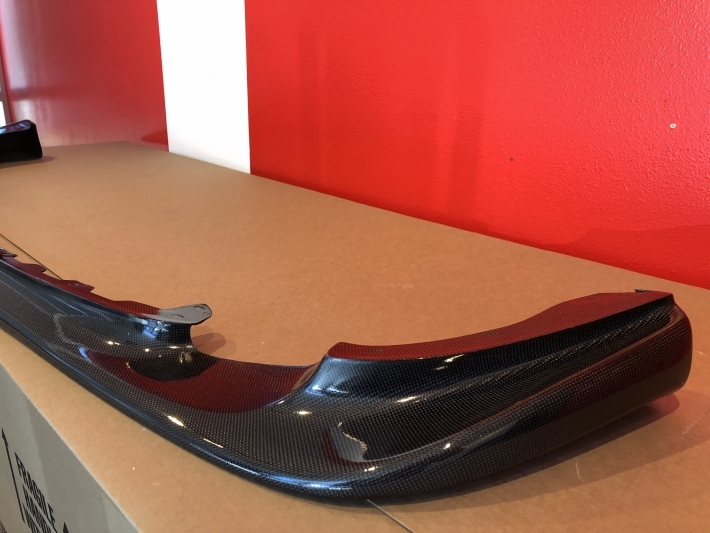 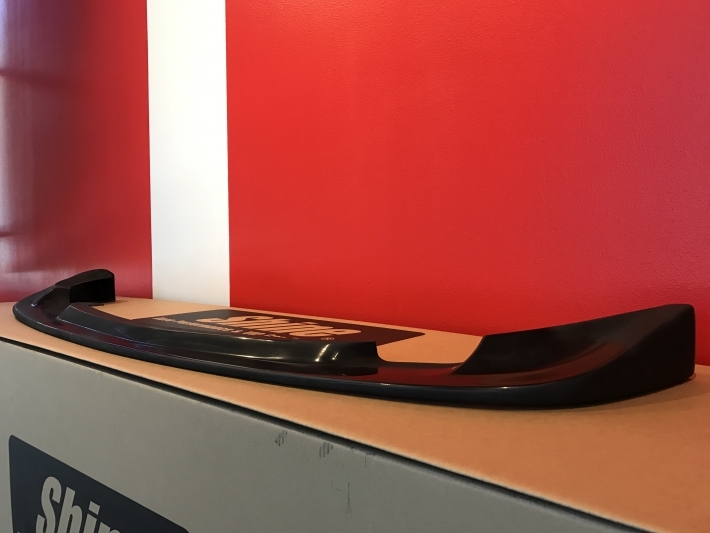 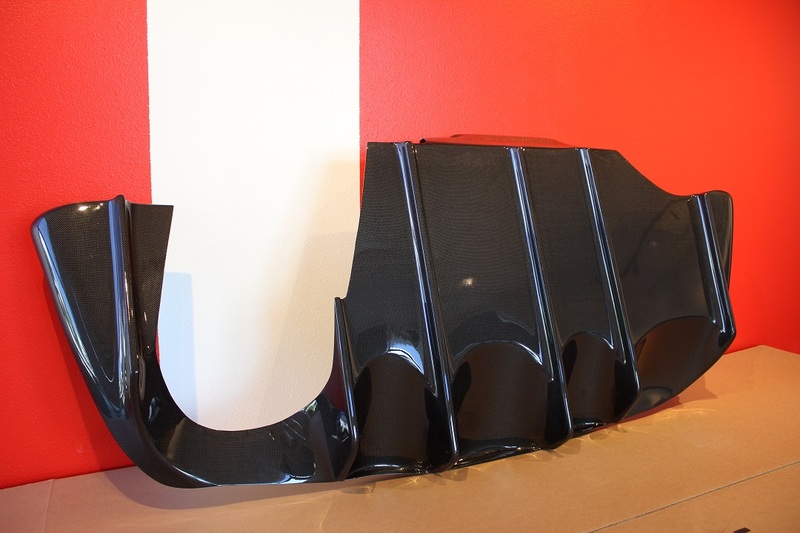 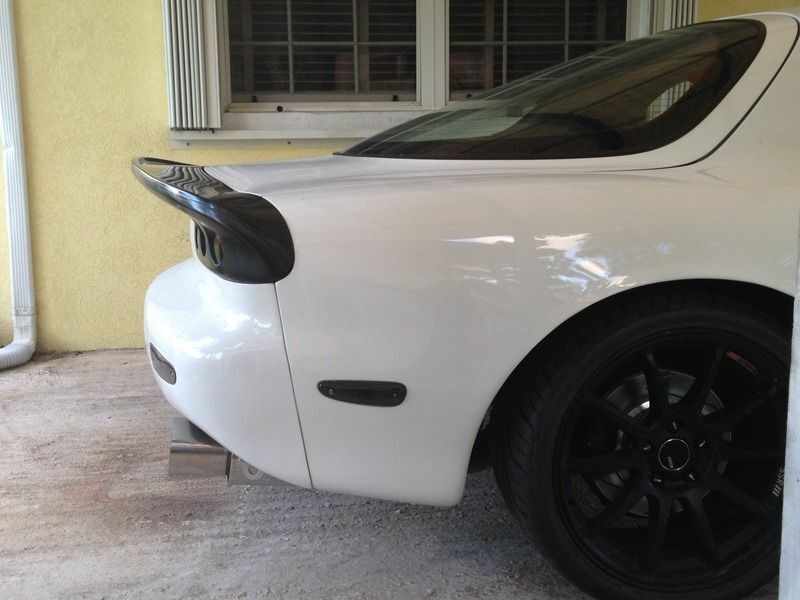 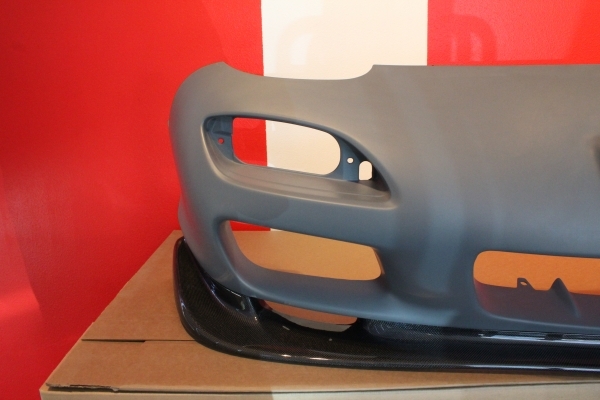 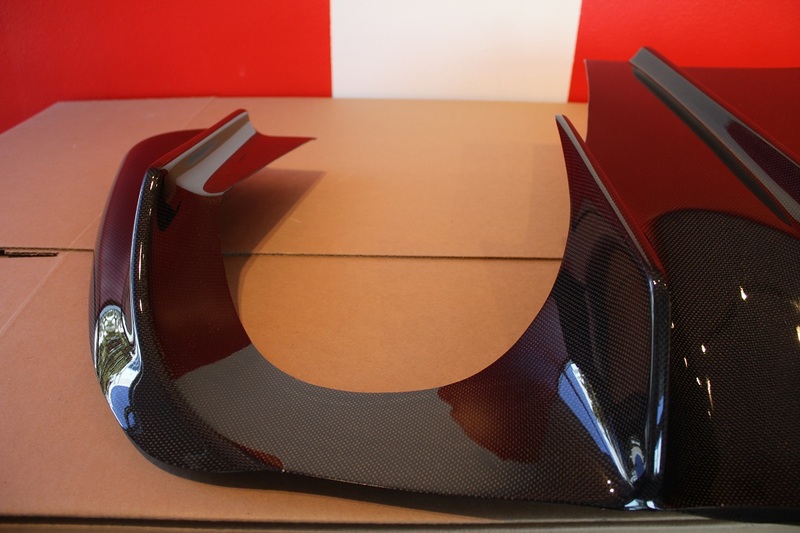 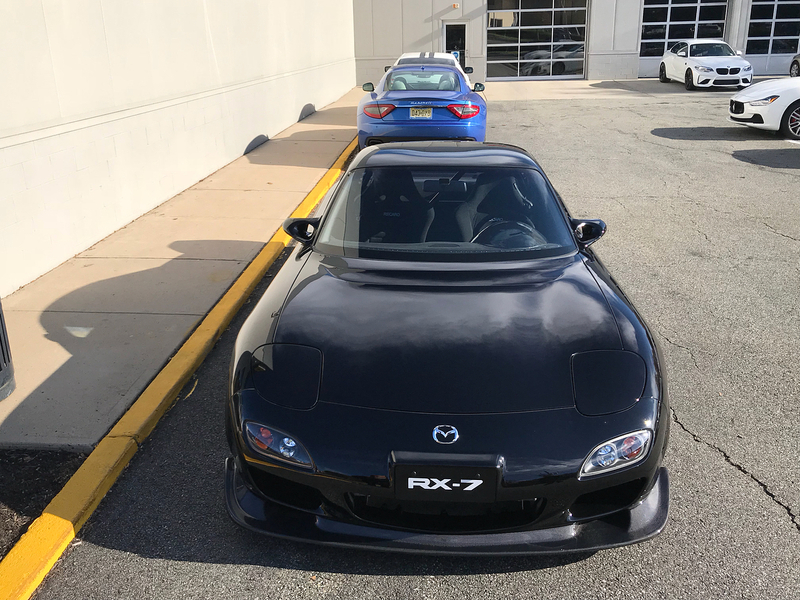 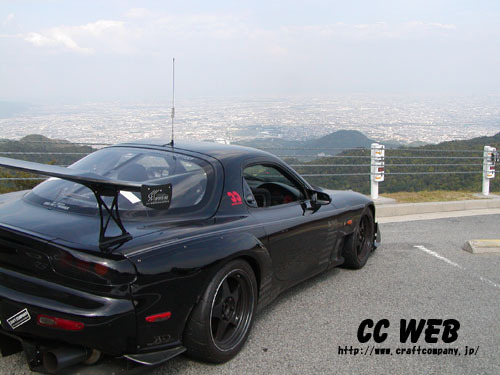 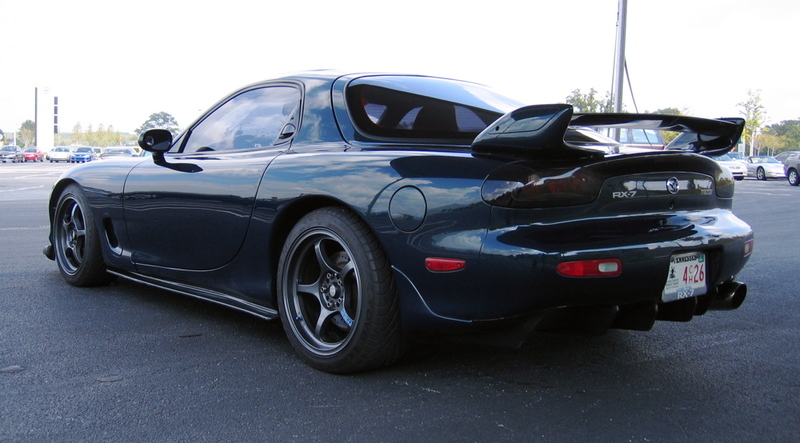 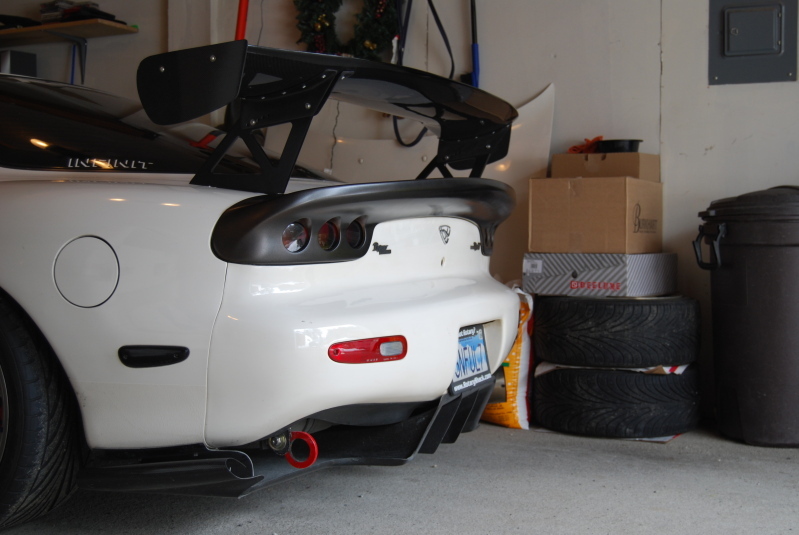 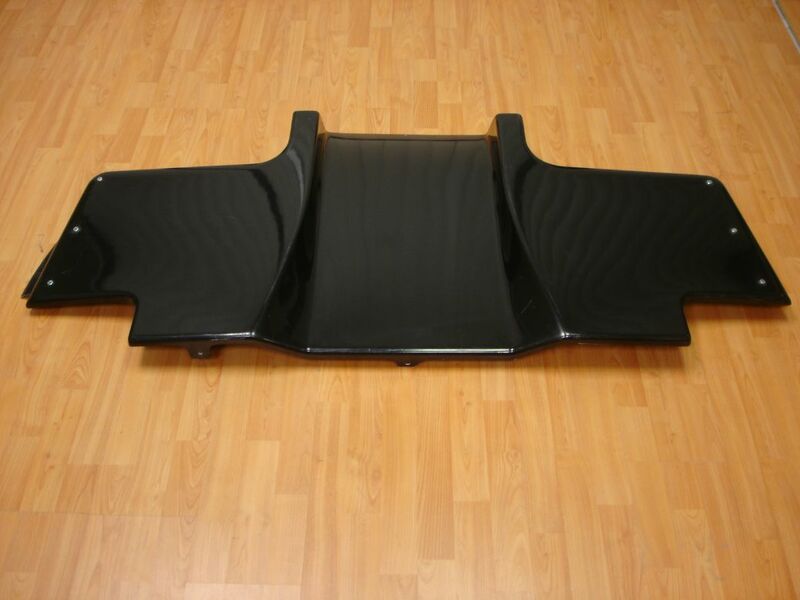 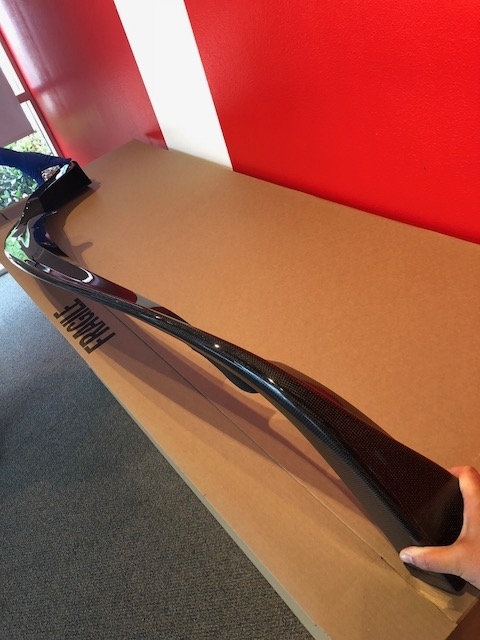 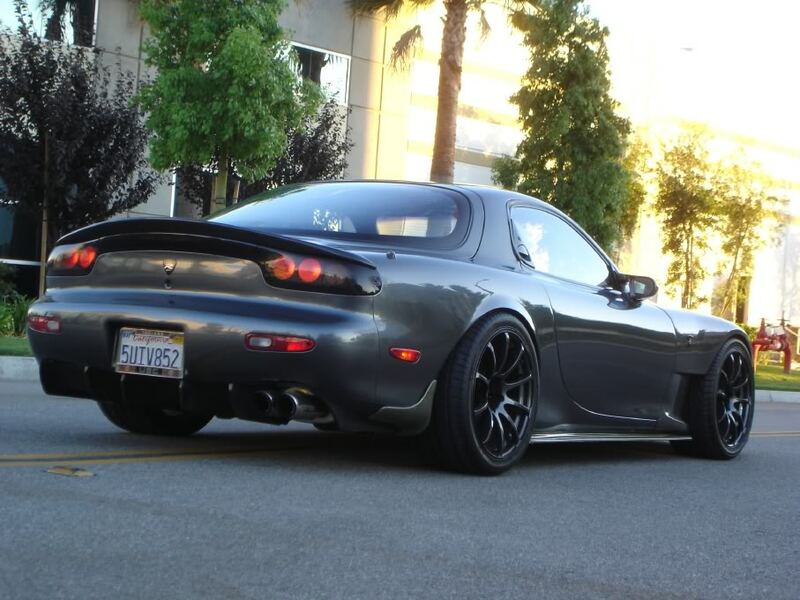 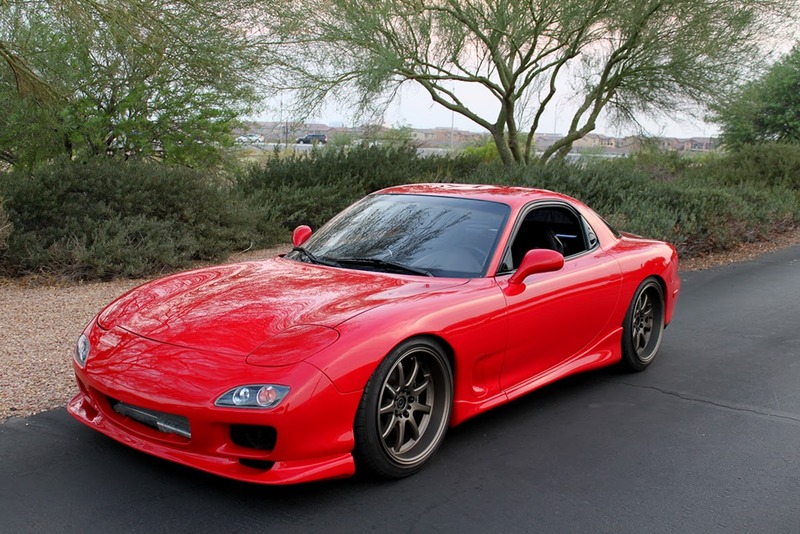 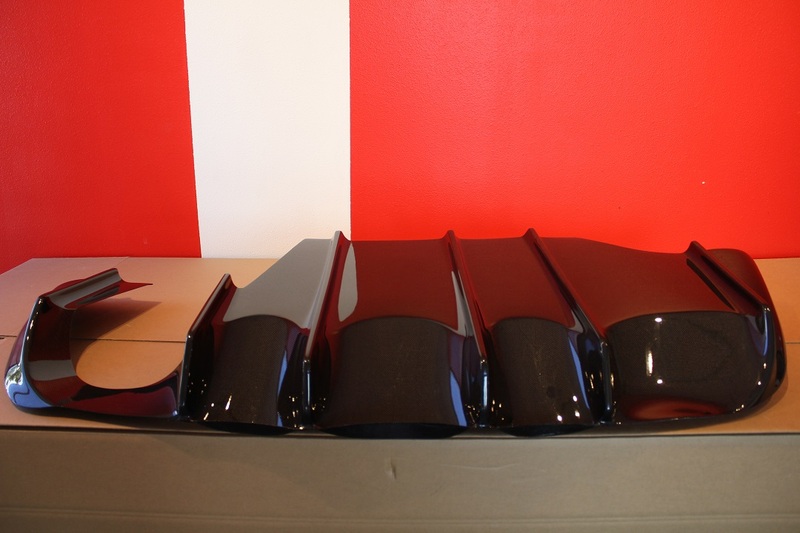 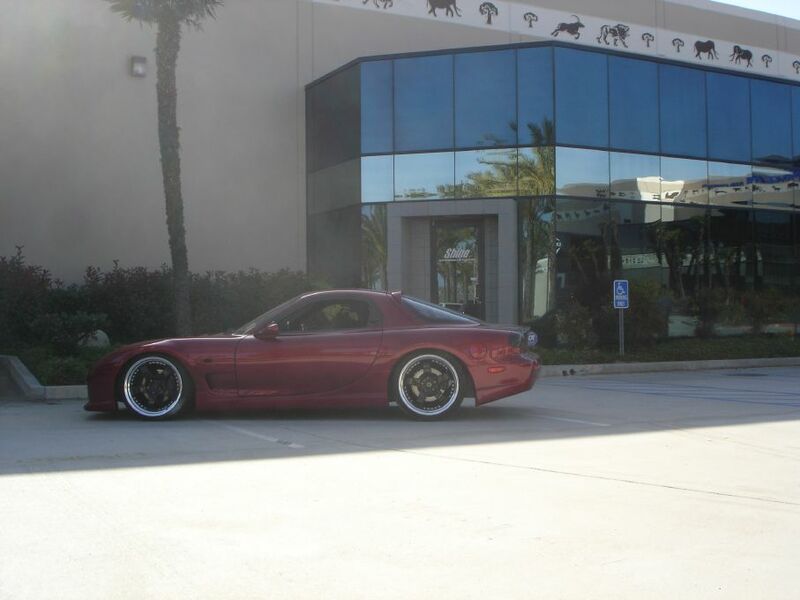 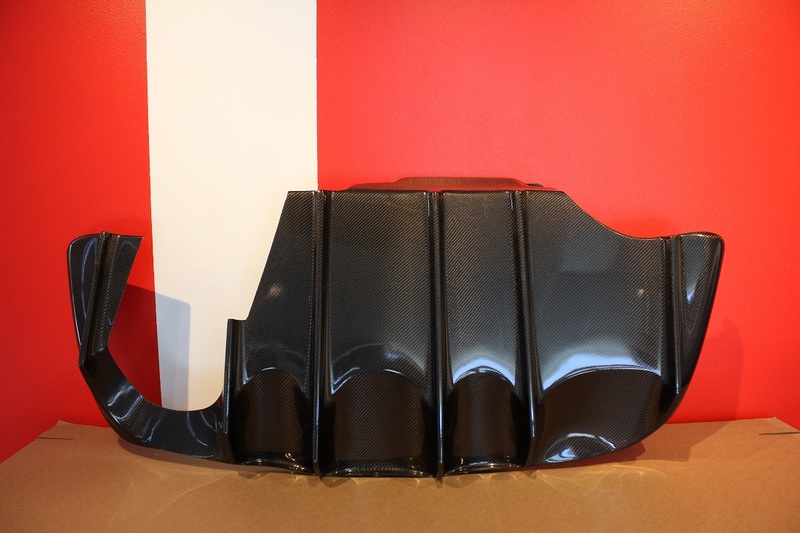 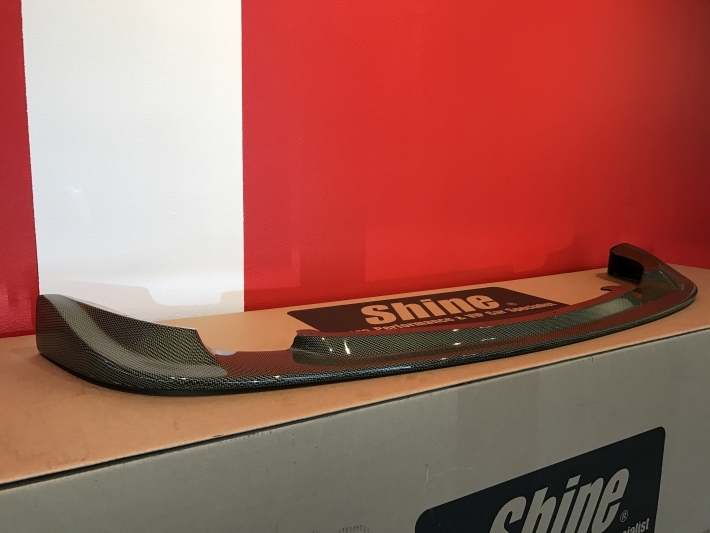 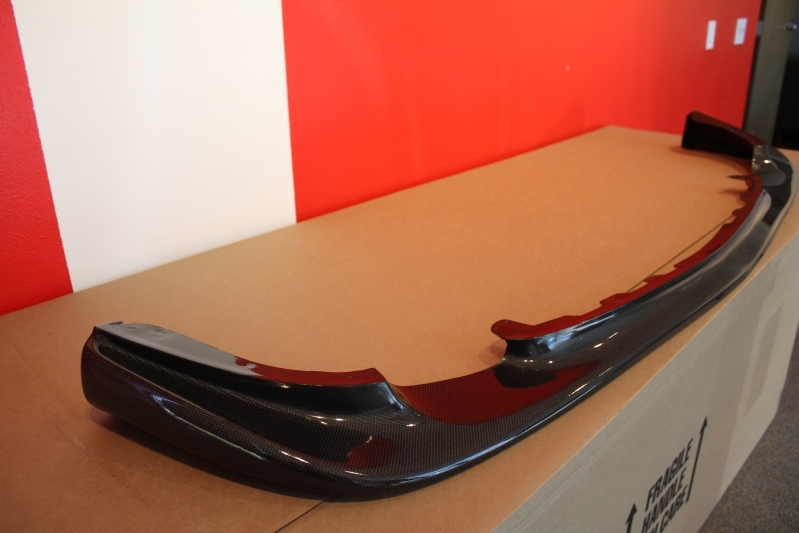 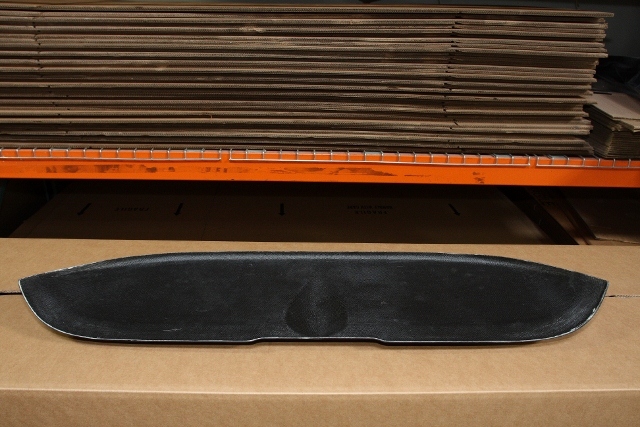 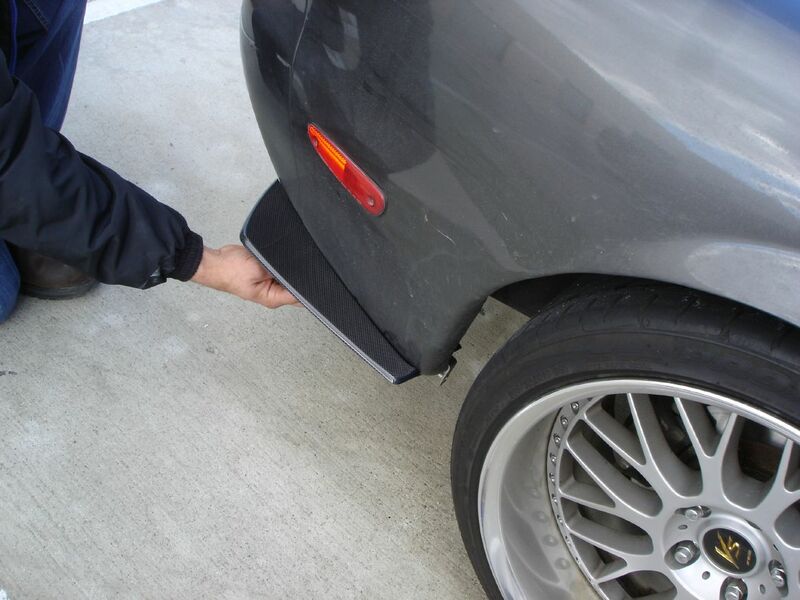 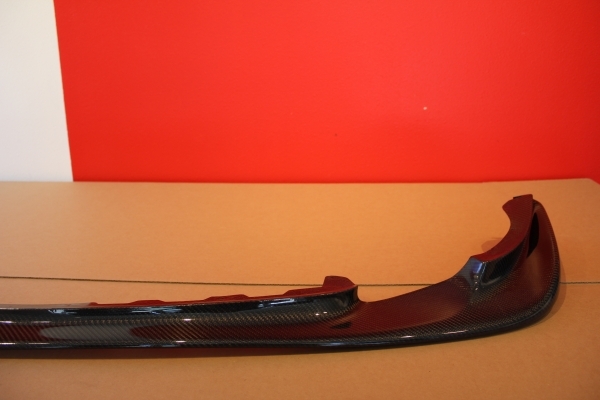 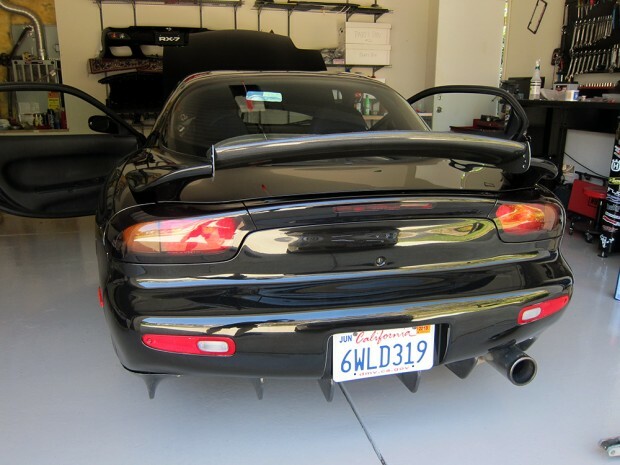 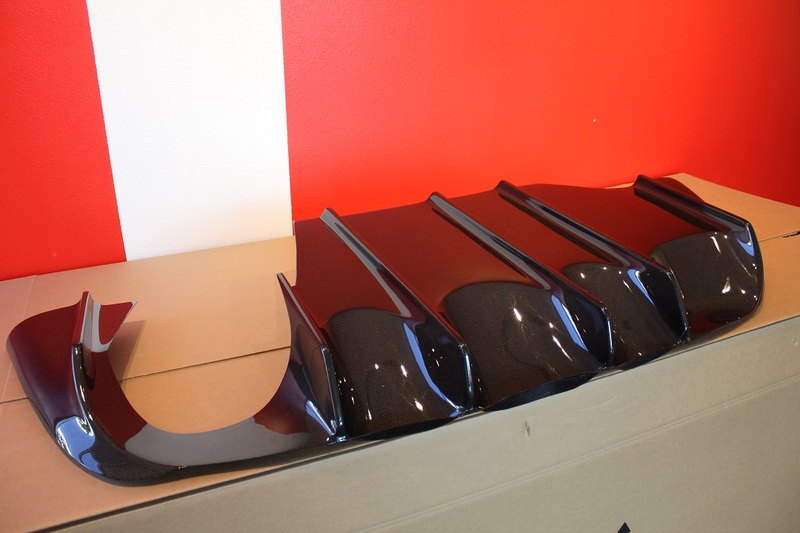 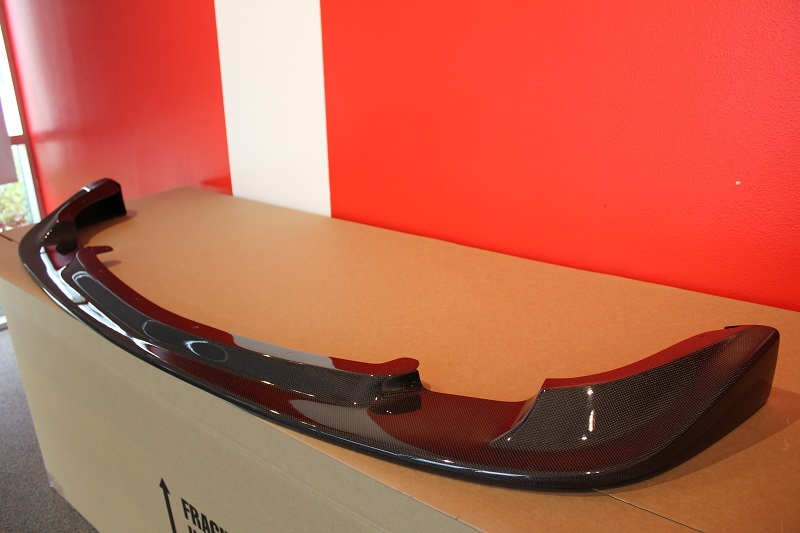 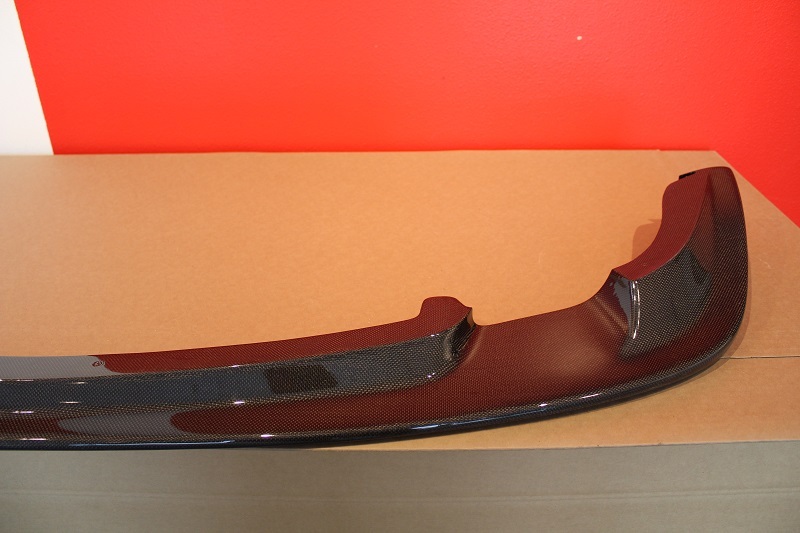 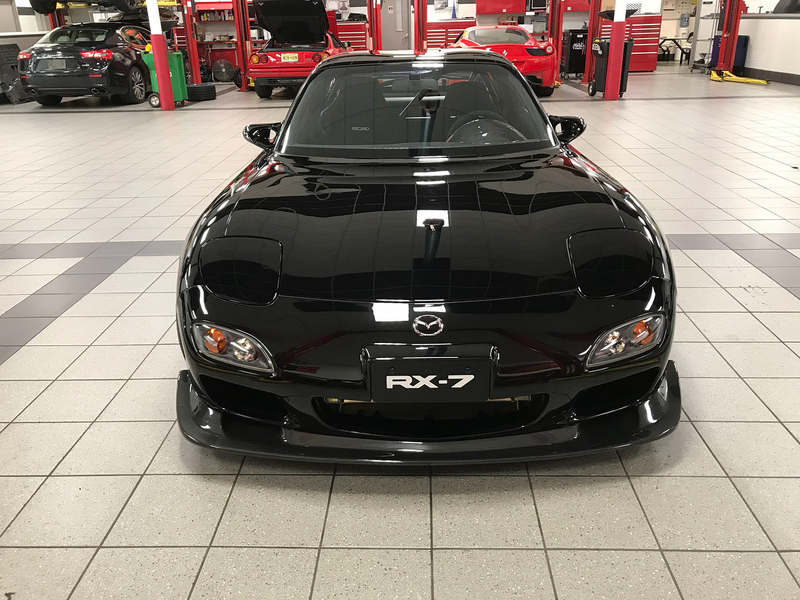 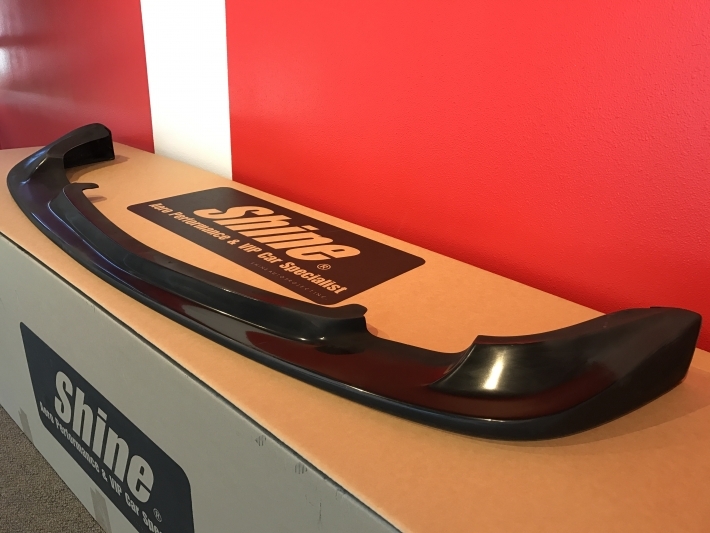 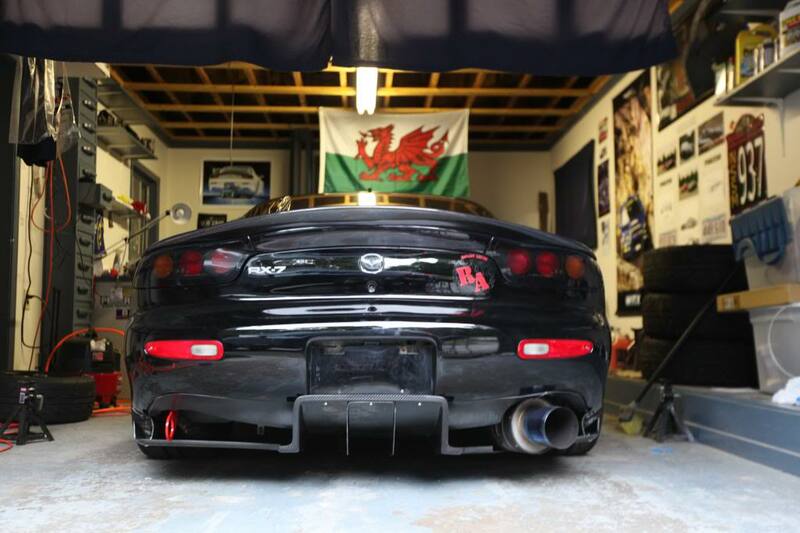 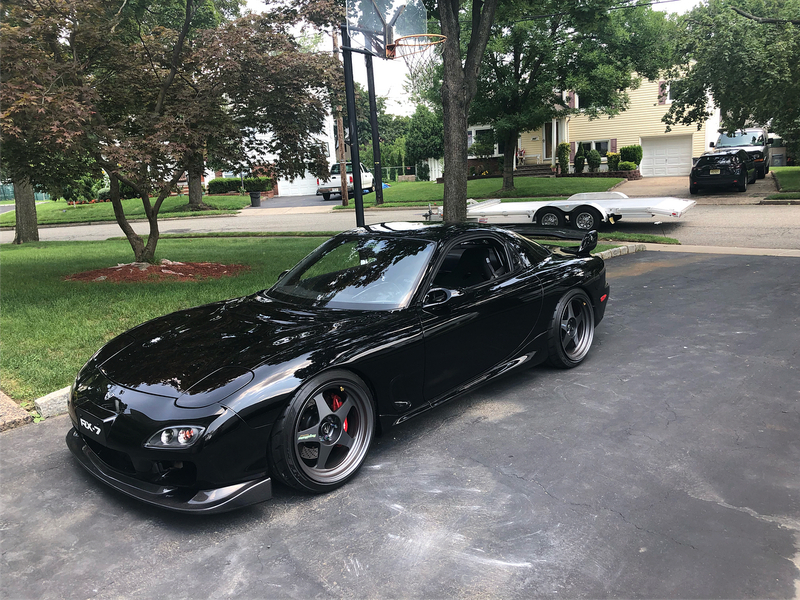 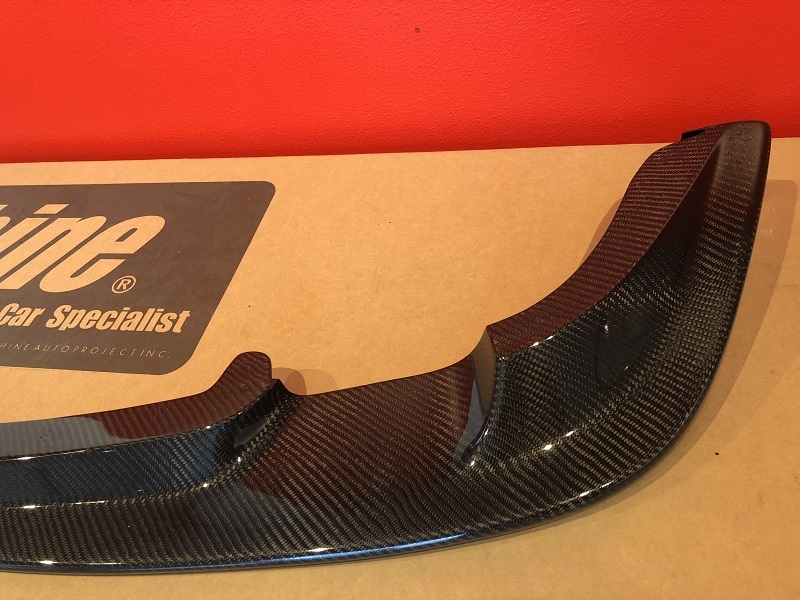 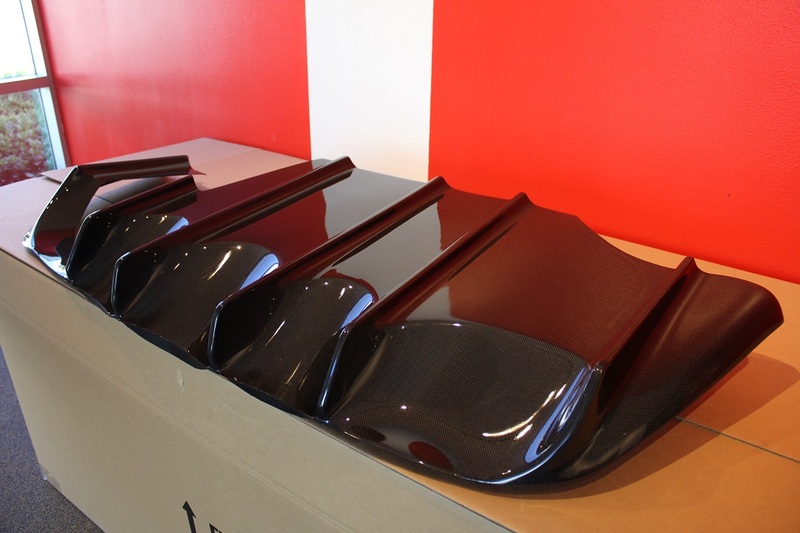 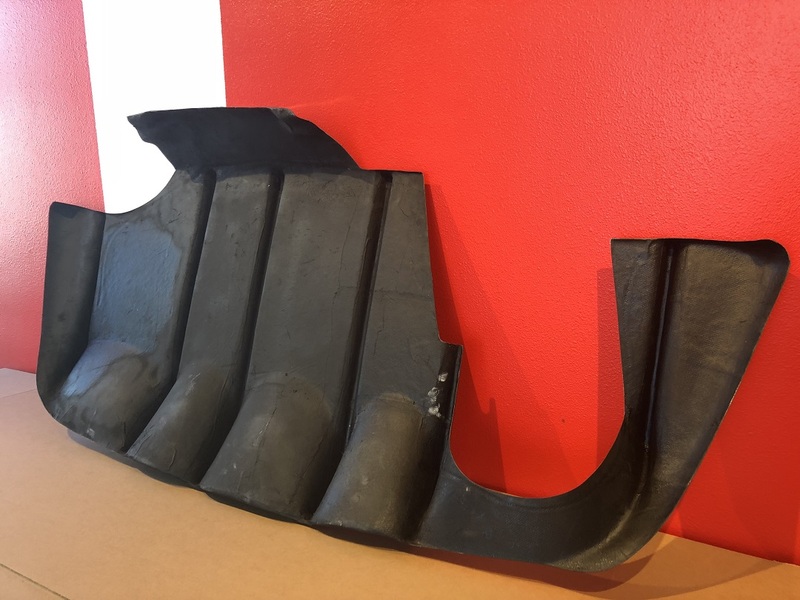 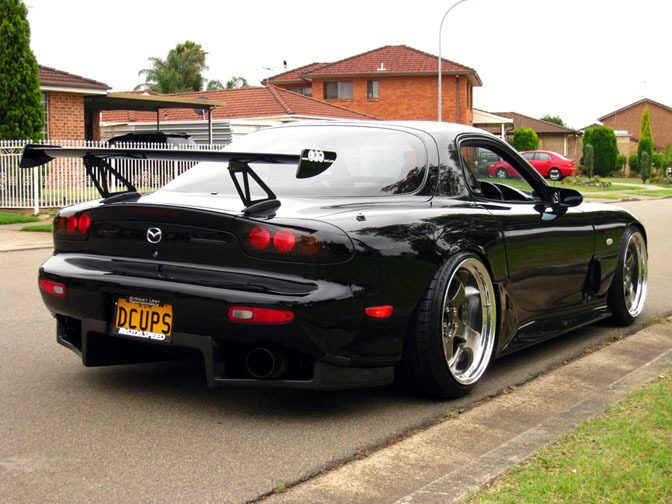 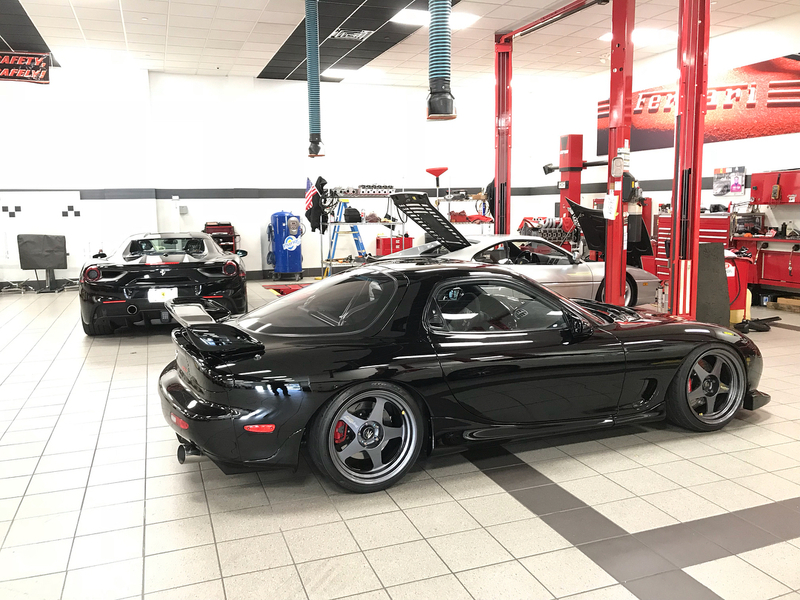 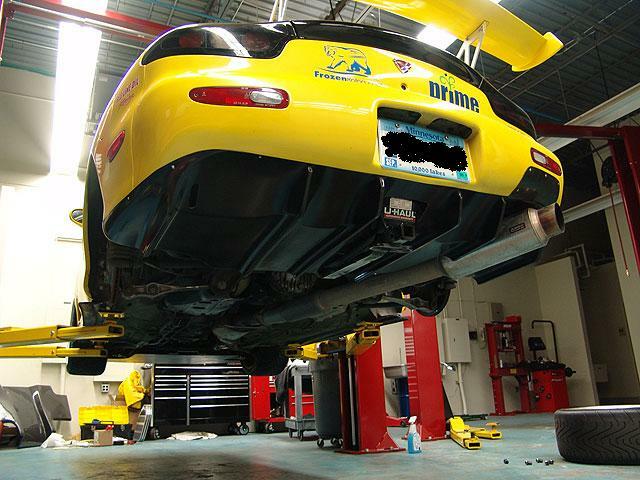 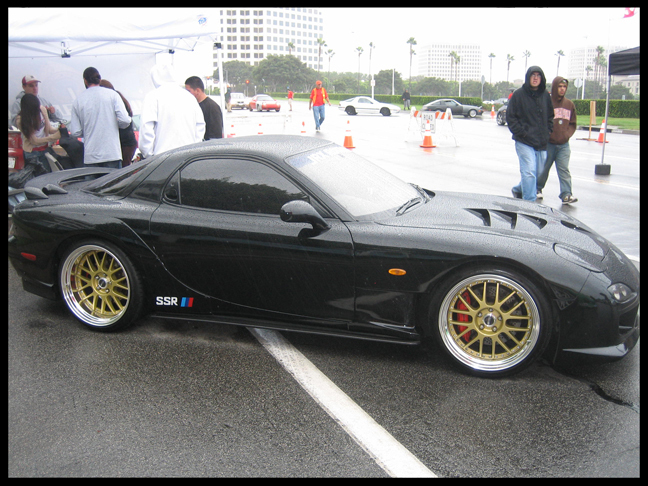 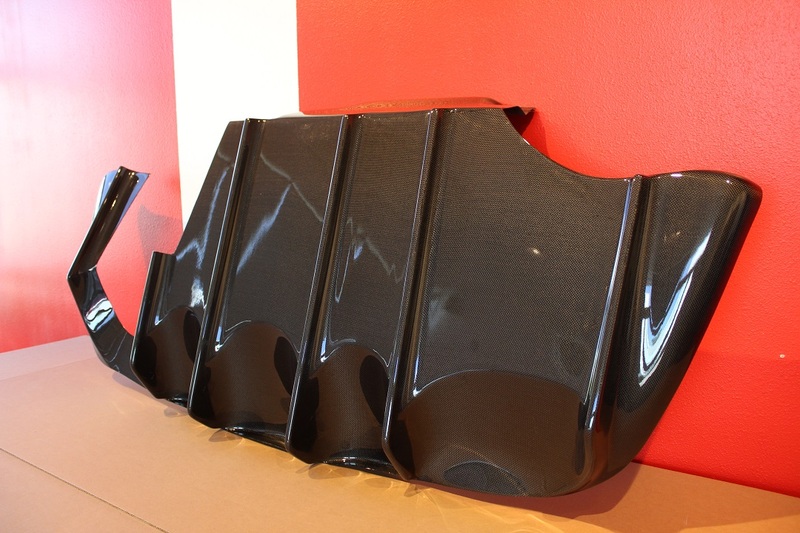 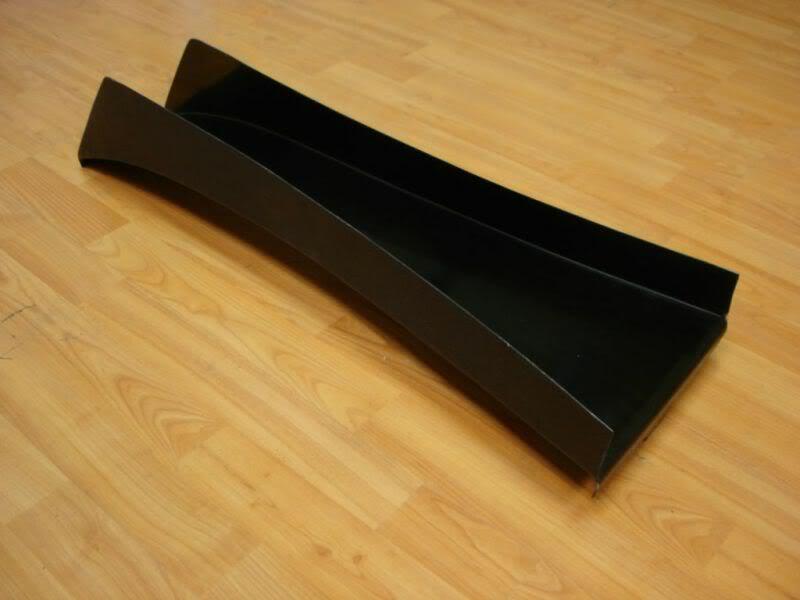 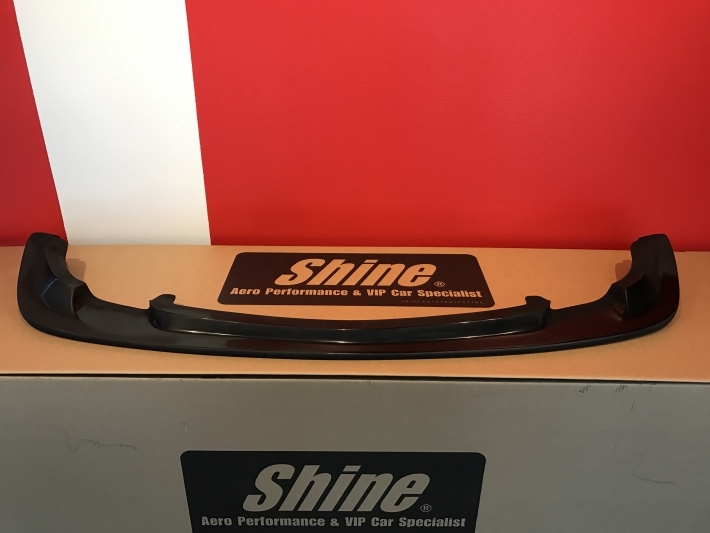 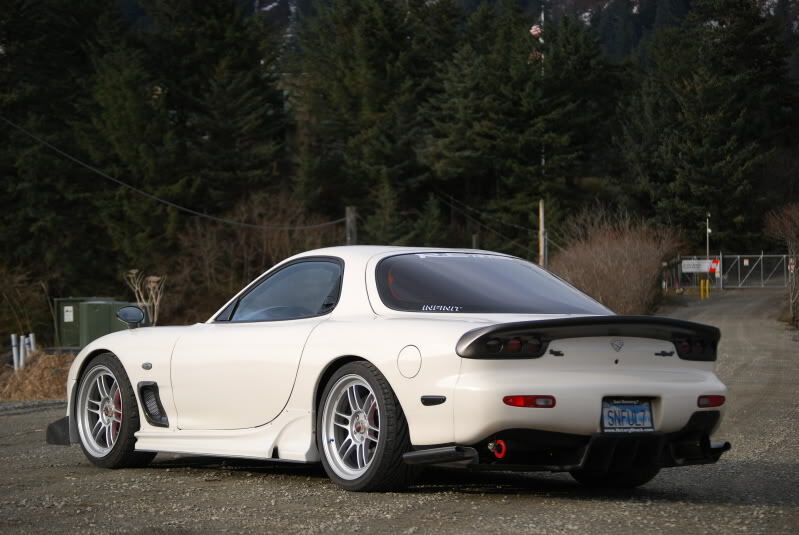 FD3S RX-7 Spec-M (Mazdaspeed Style) Rear Spoiler Insert for 99 Spec Wing Only. 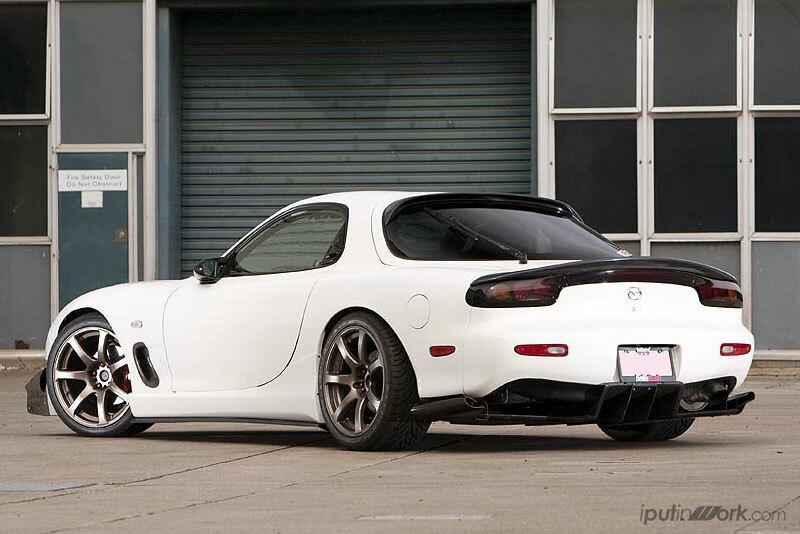 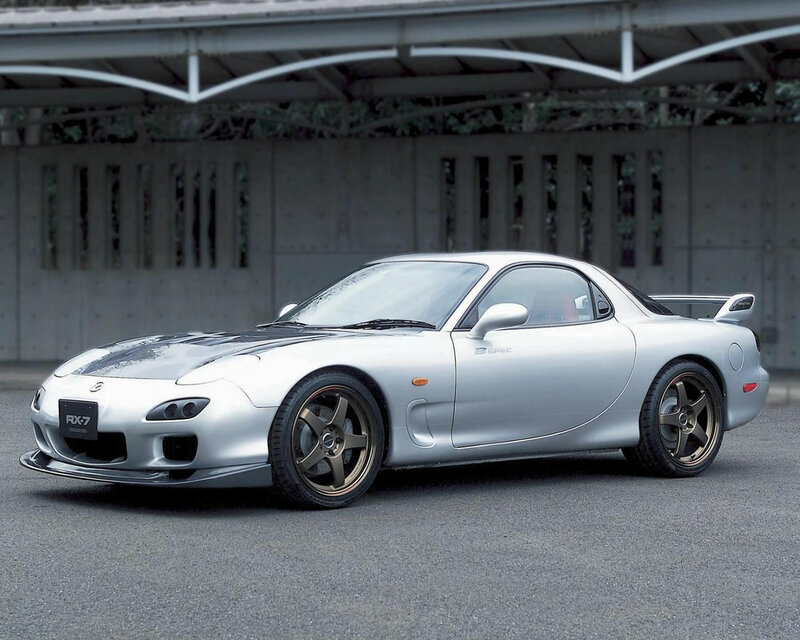 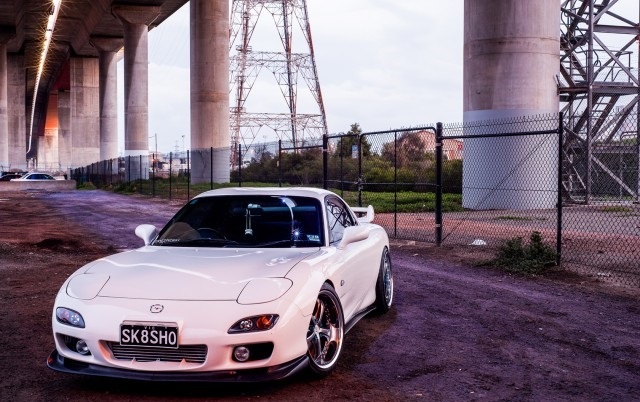 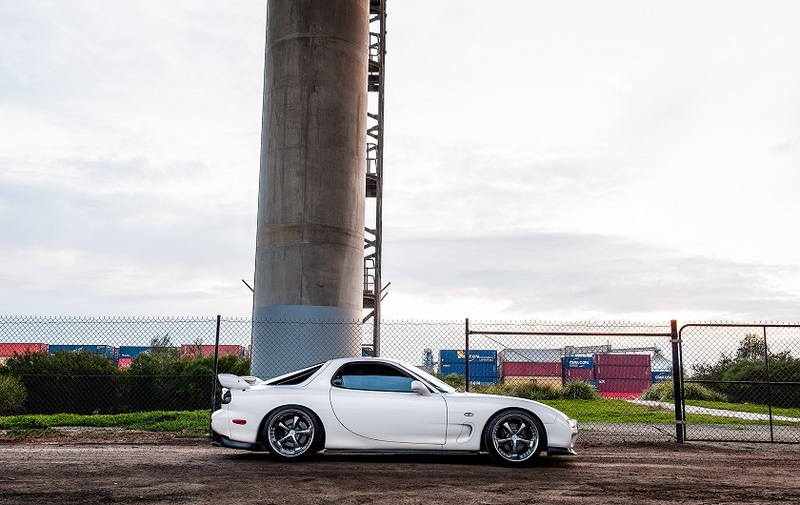 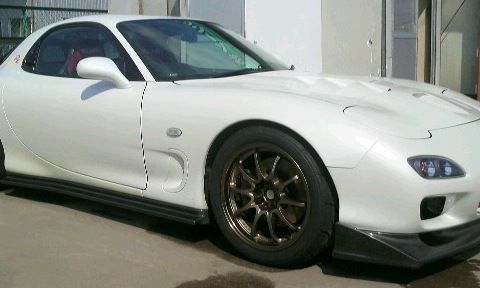 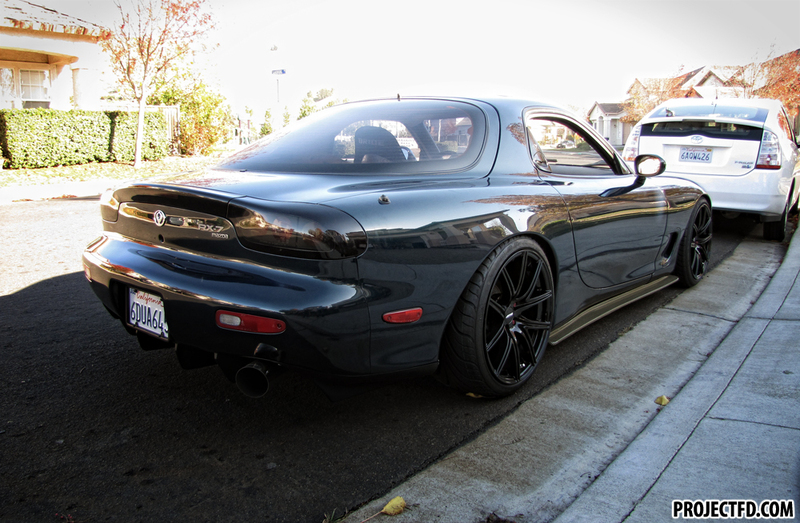 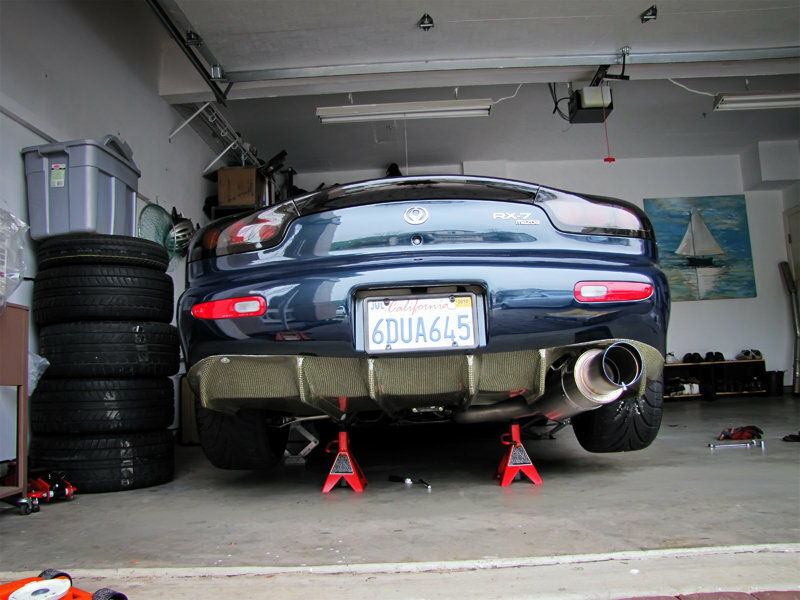 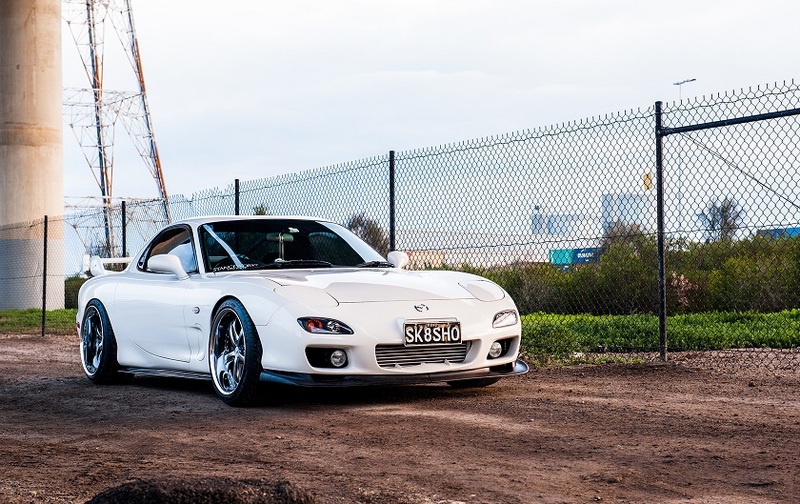 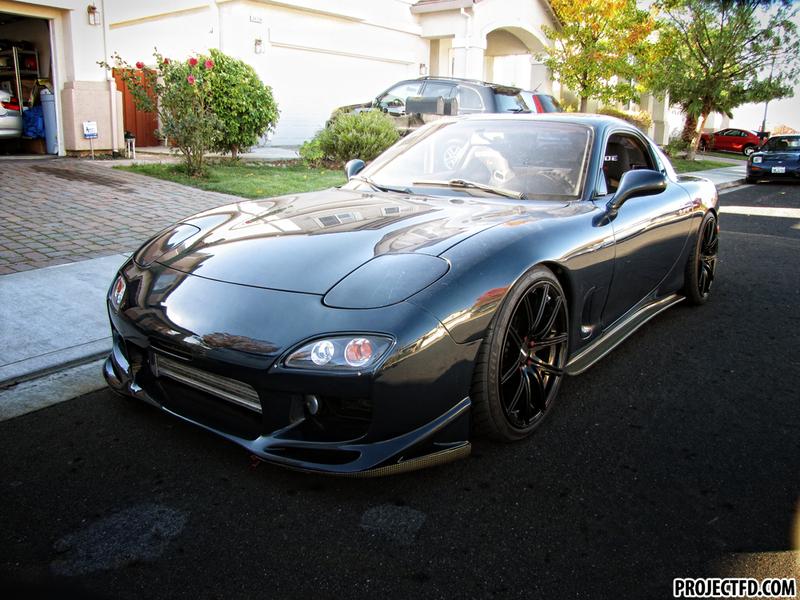 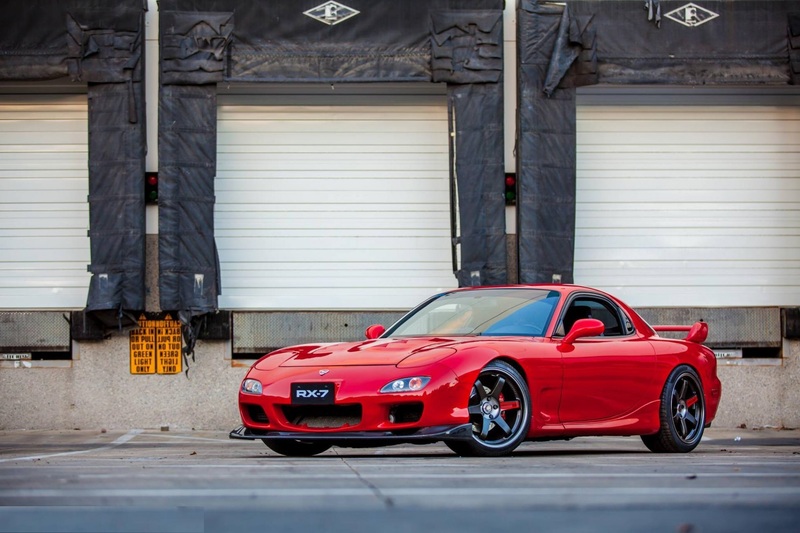 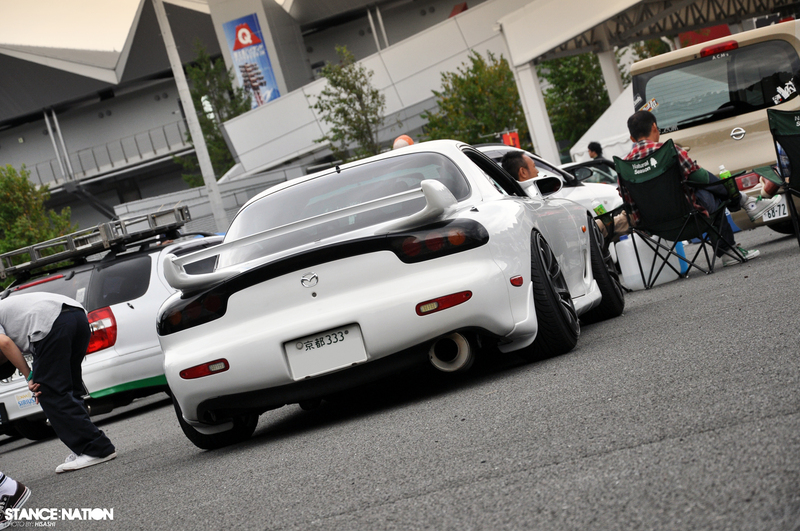 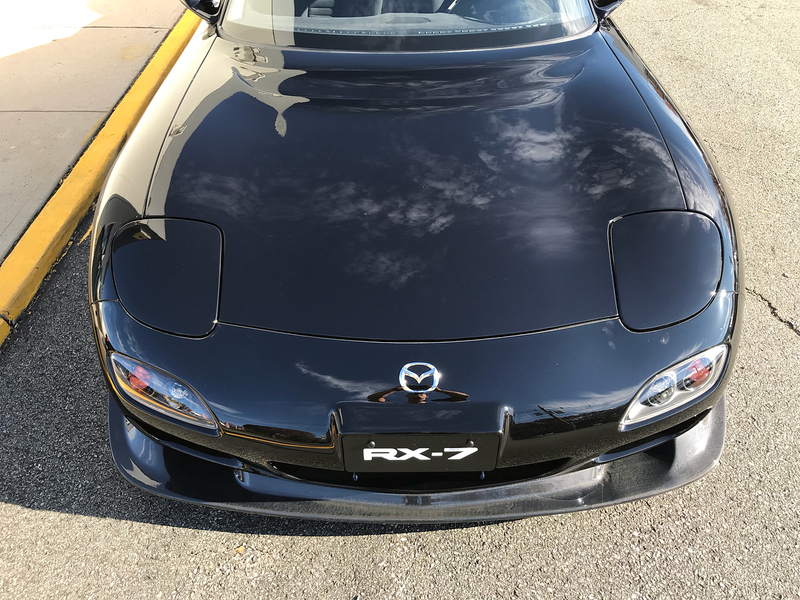 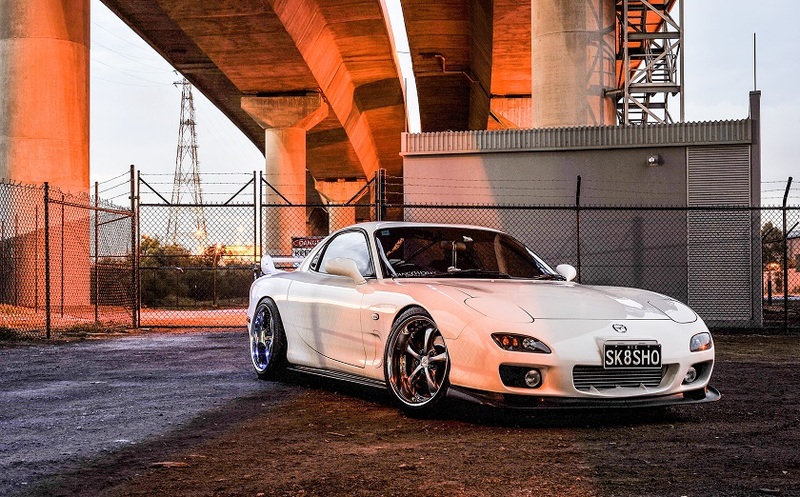 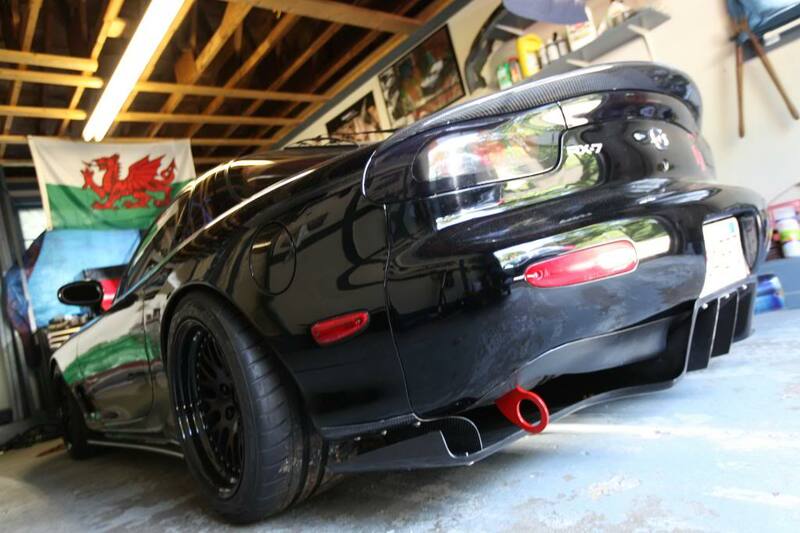 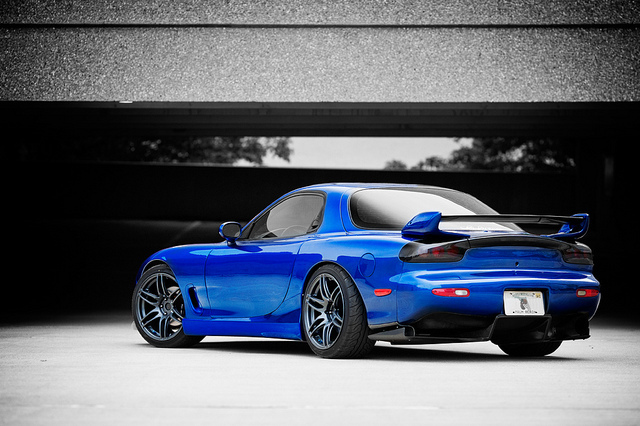 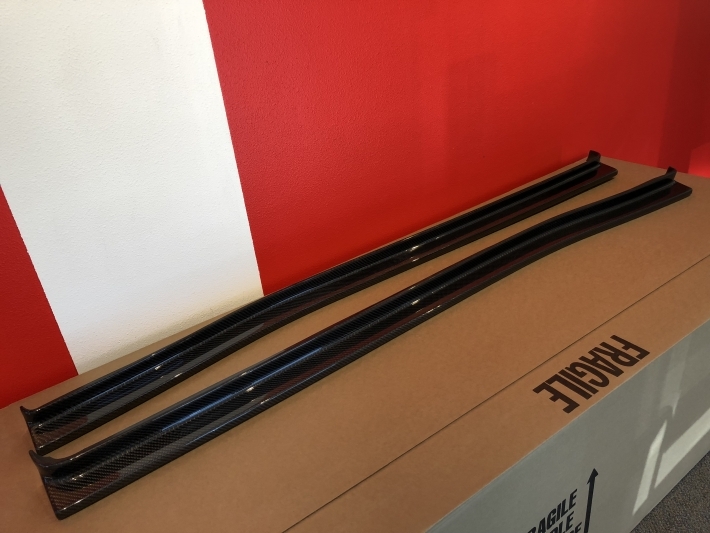 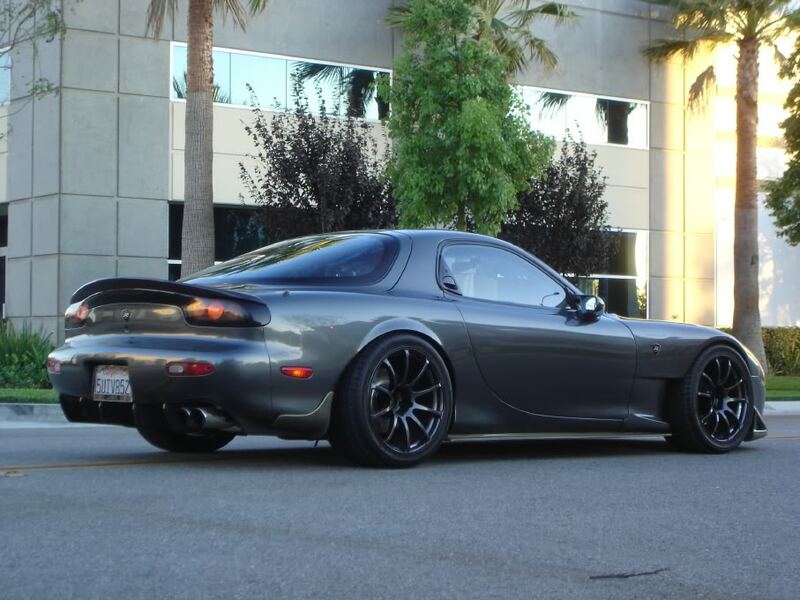 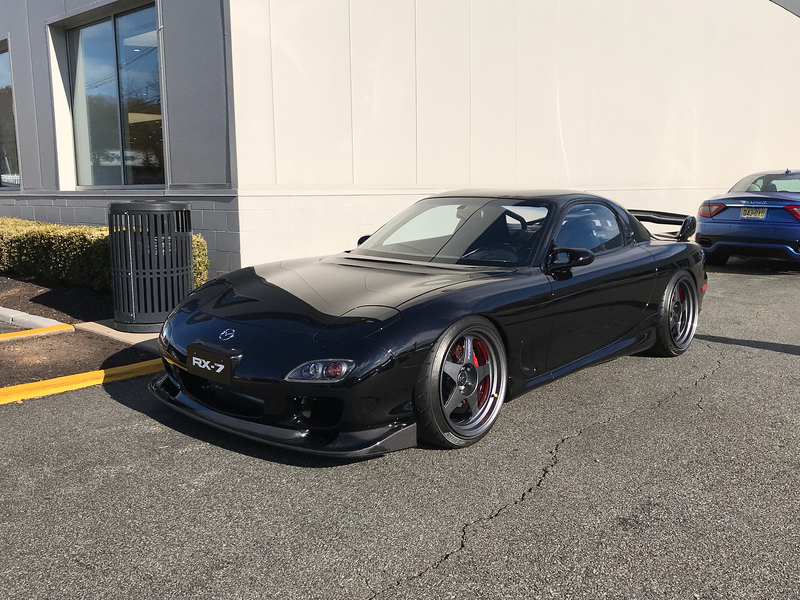 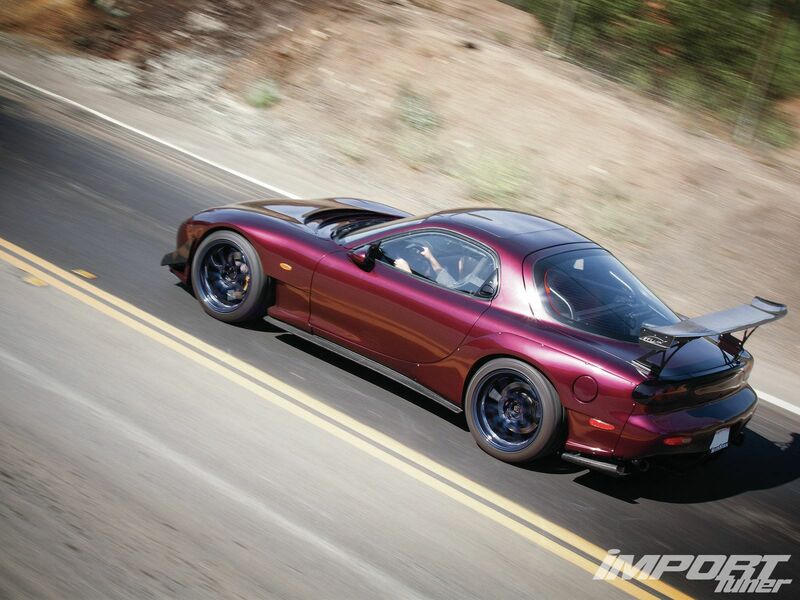 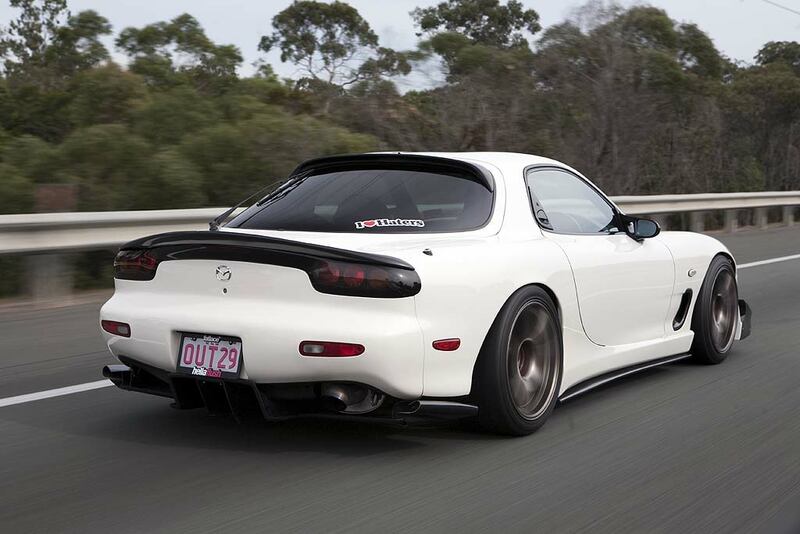 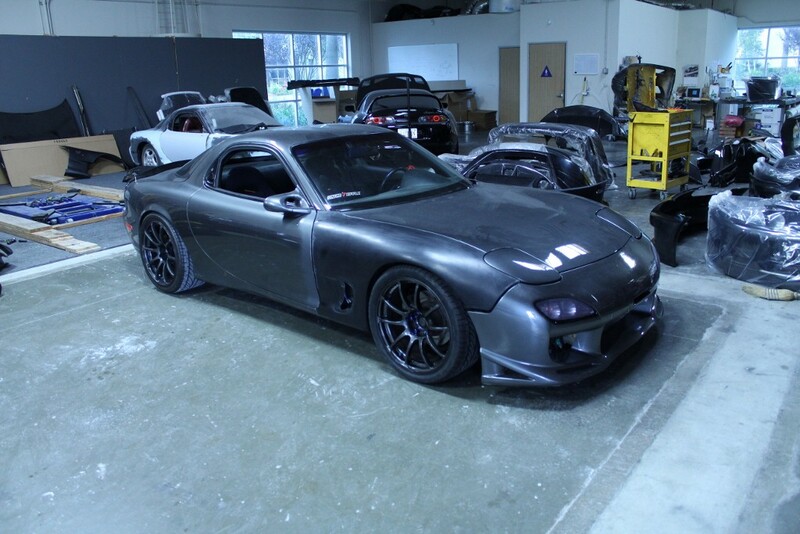 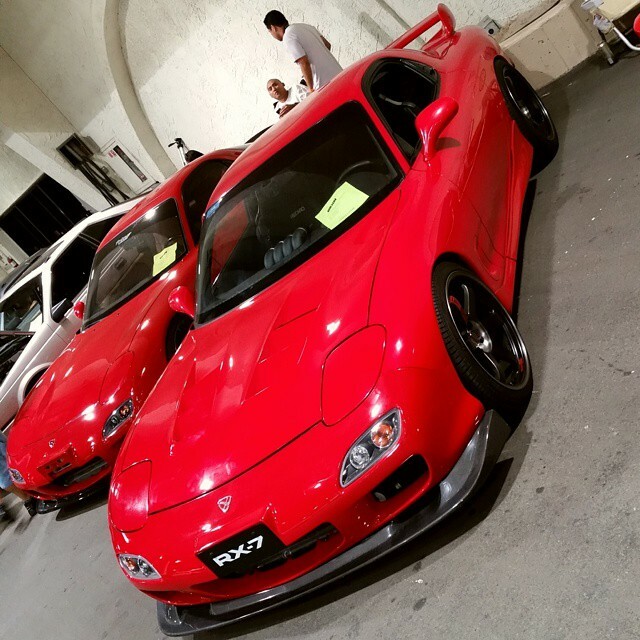 FD3S RX-7 Type-F Rear Adjustable Spoiler. 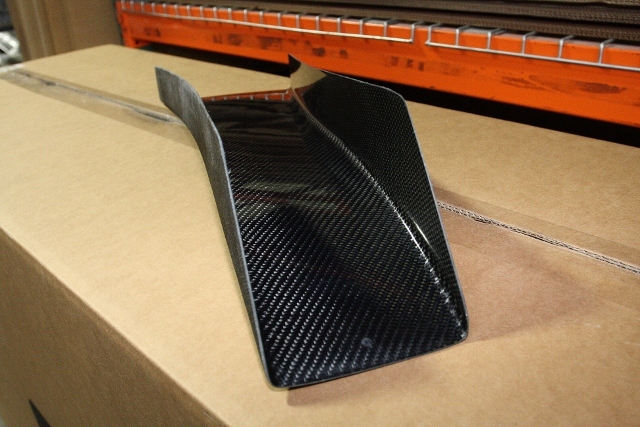 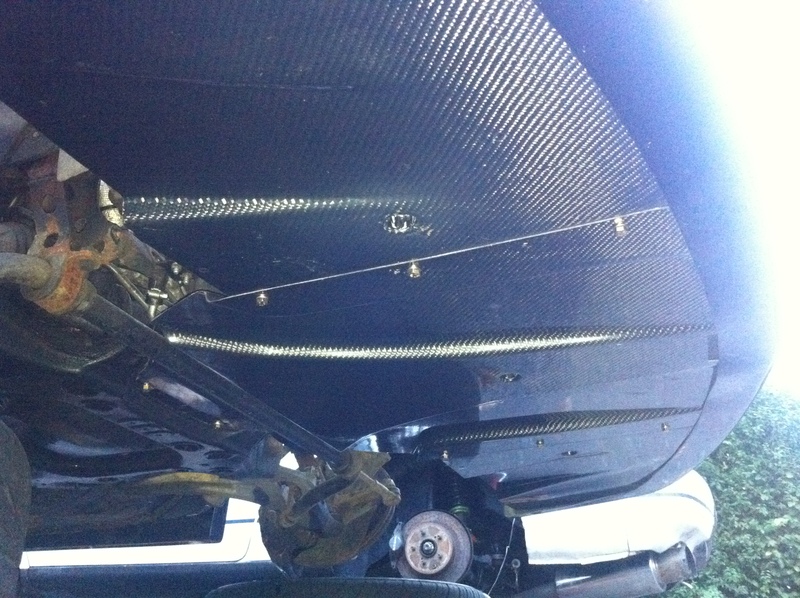 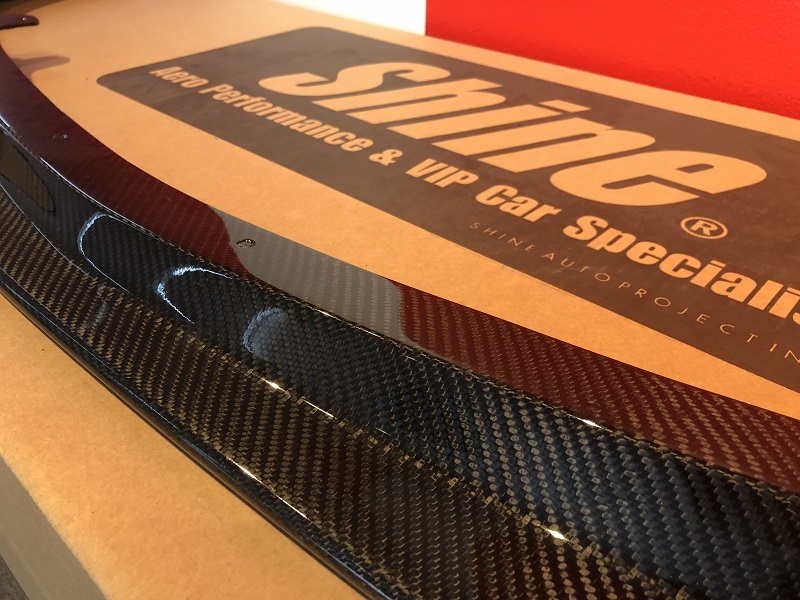 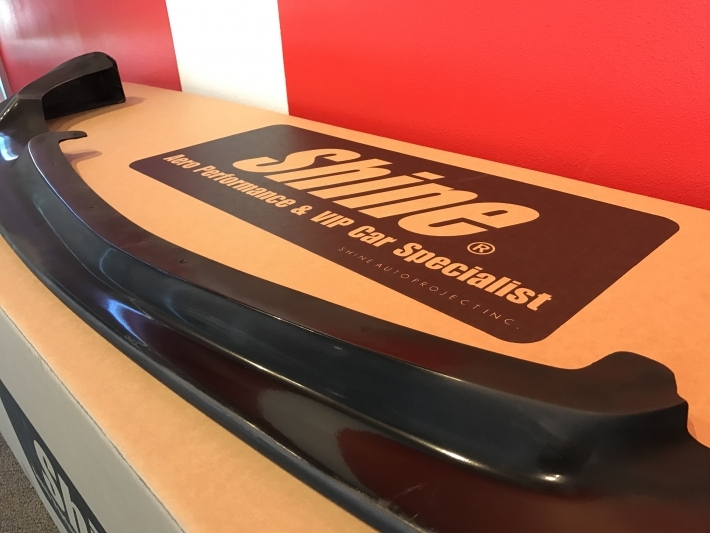 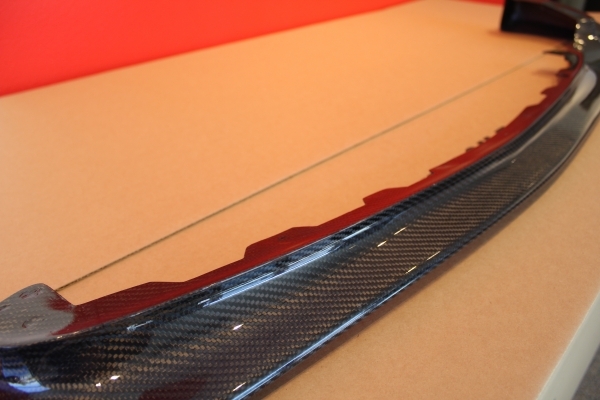 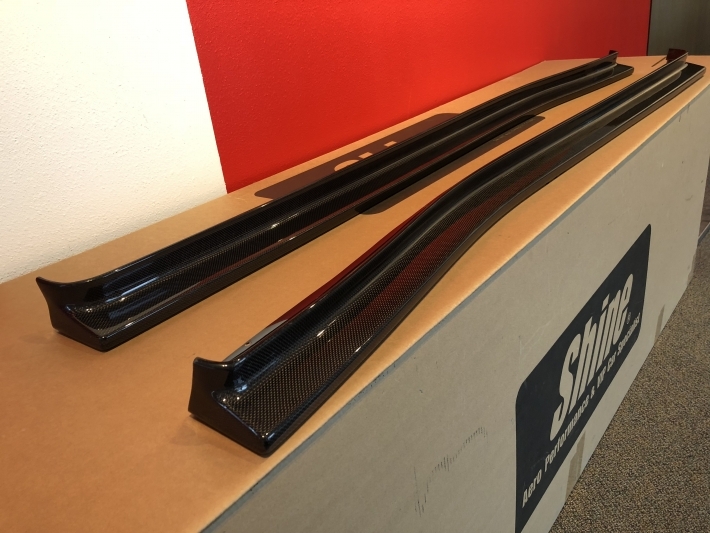 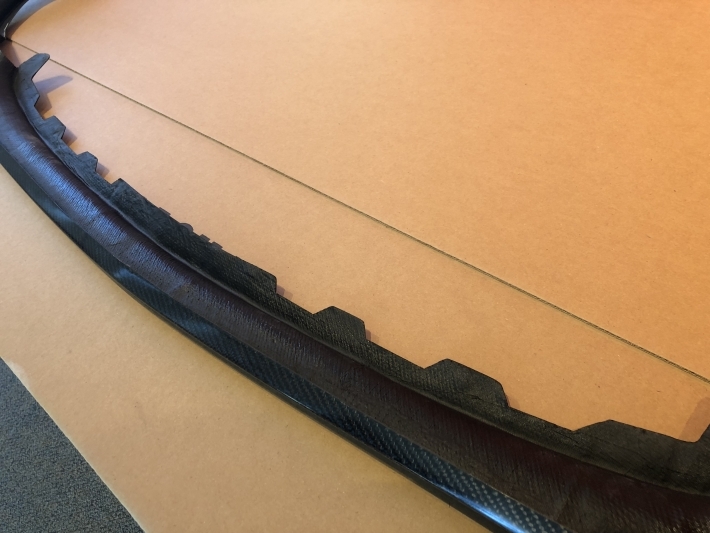 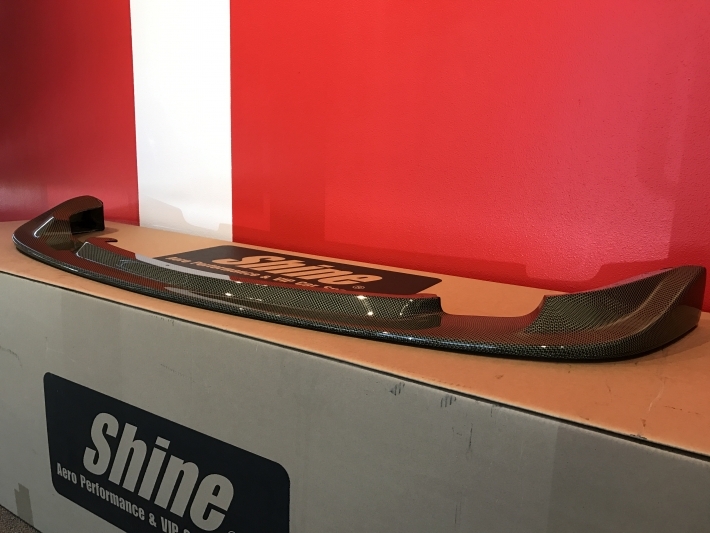 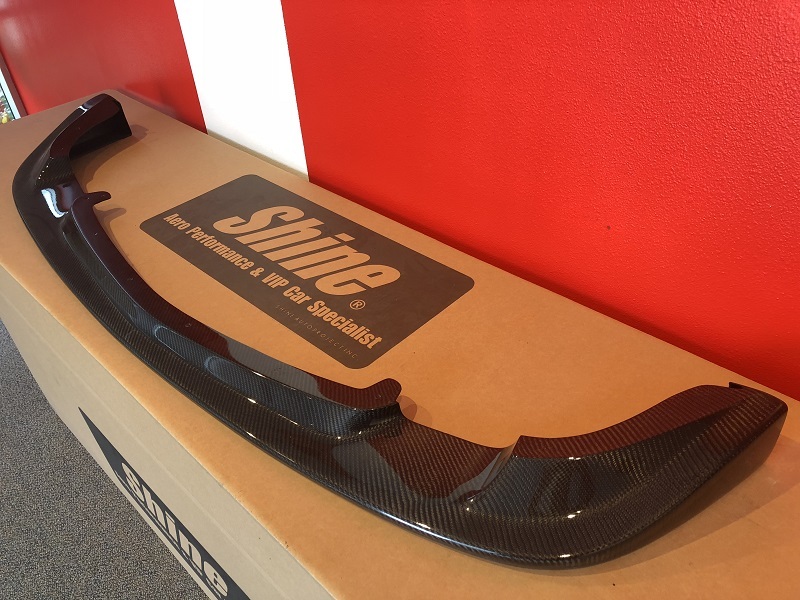 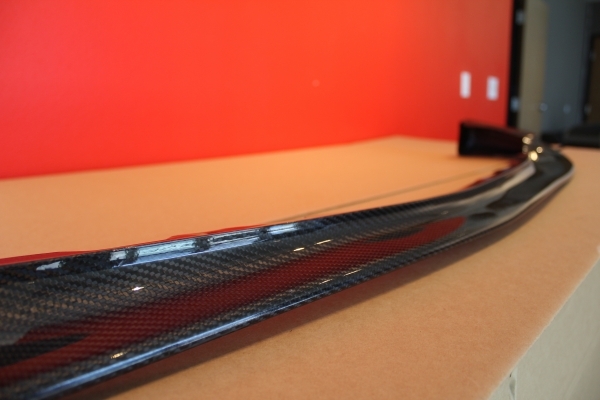 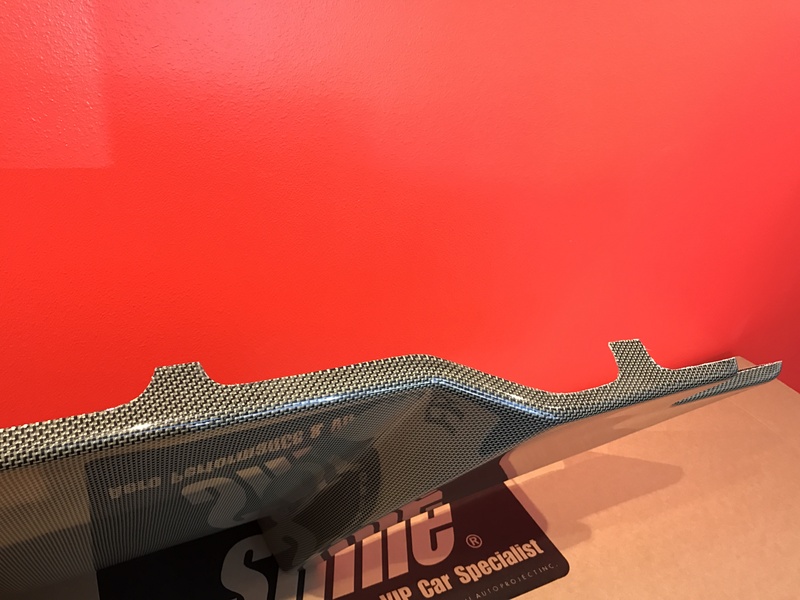 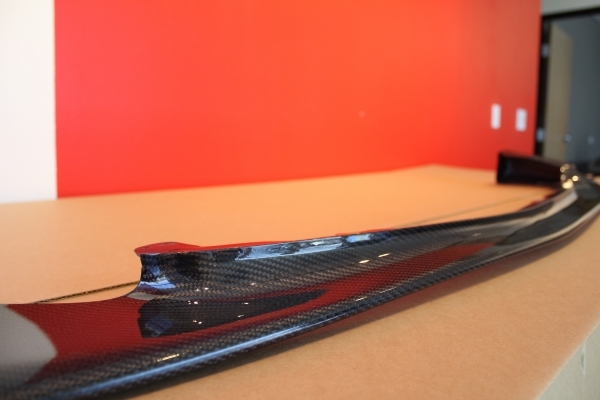 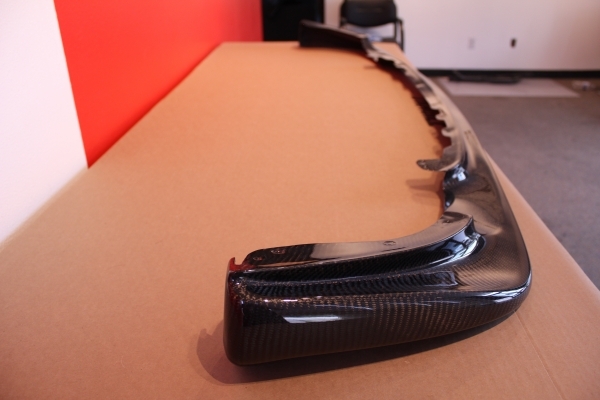 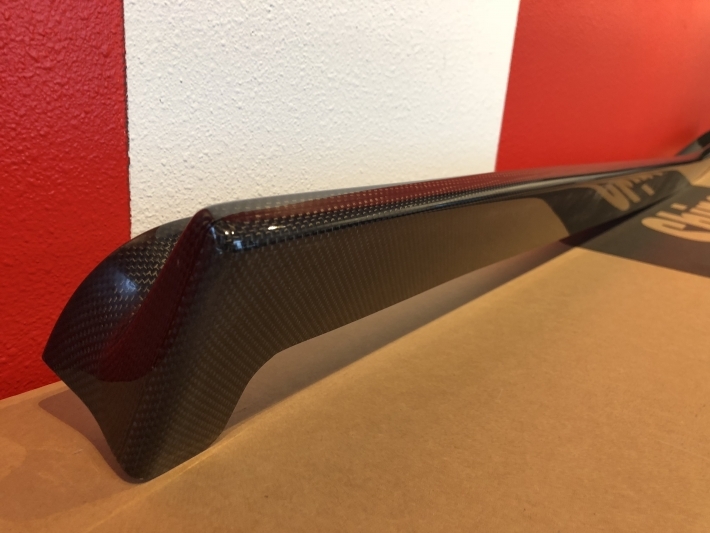 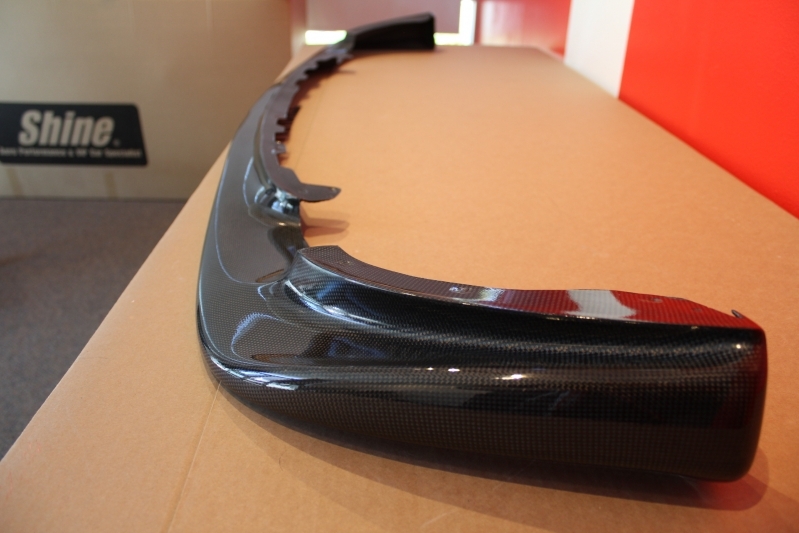 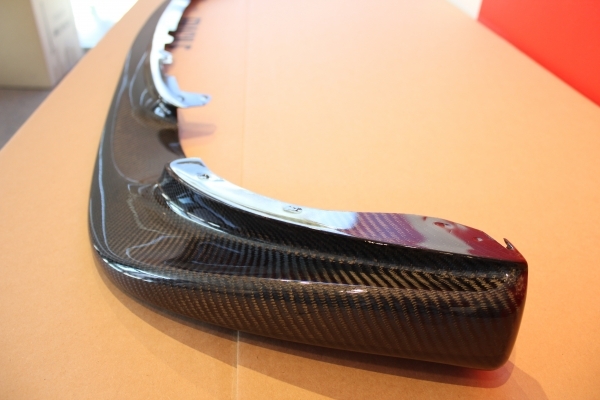 Center spoiler comes in Carbon or Carbon-Kevlar. 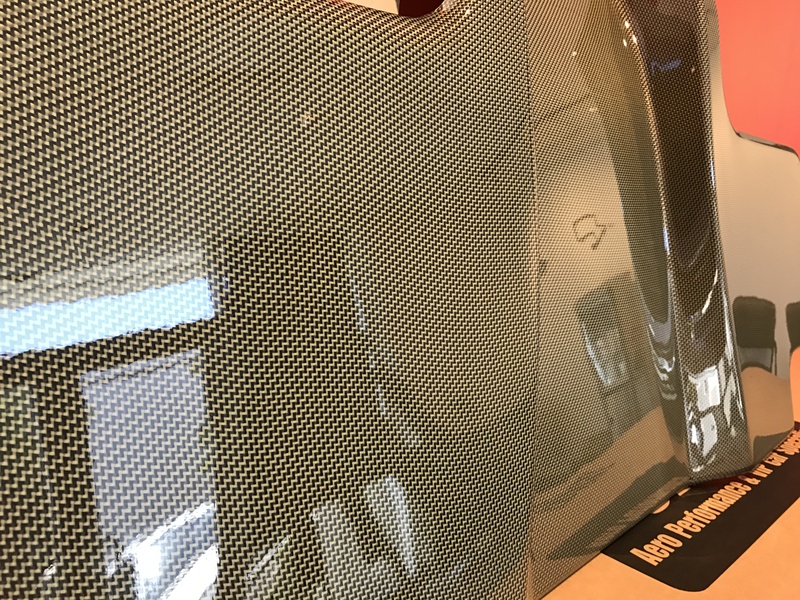 Attached to glass with 3m double-sided tape. 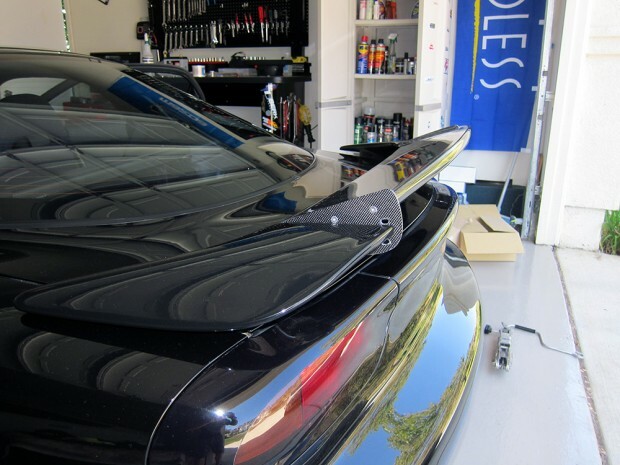 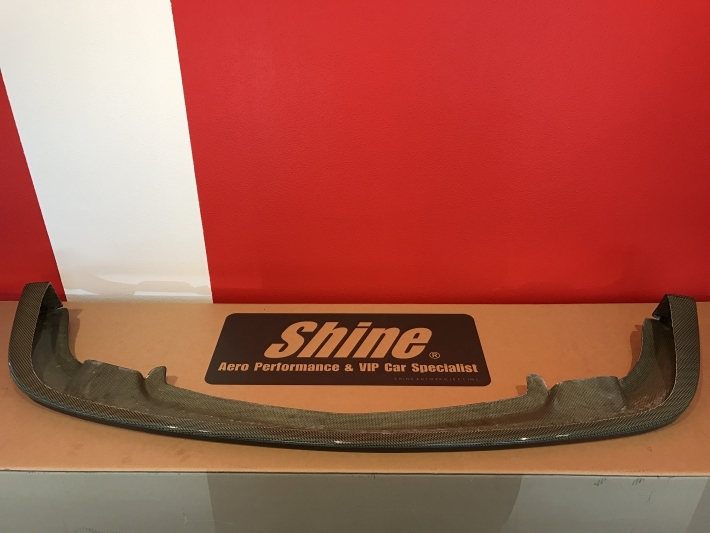 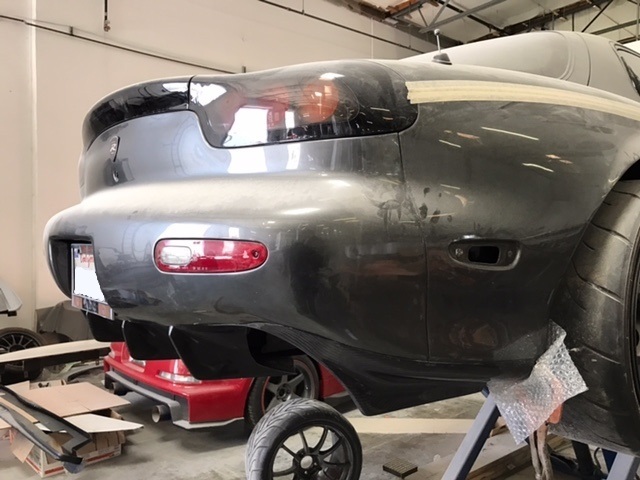 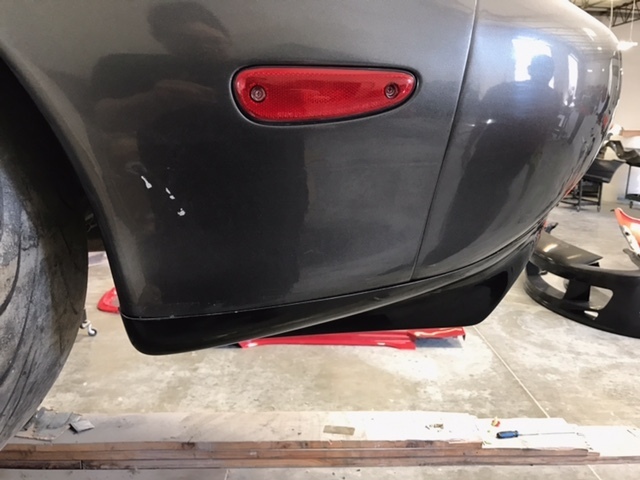 This spoiler will only work on 94+ RX-7′s as the curvature on the 93 models is slightly different causing a fitment issue.